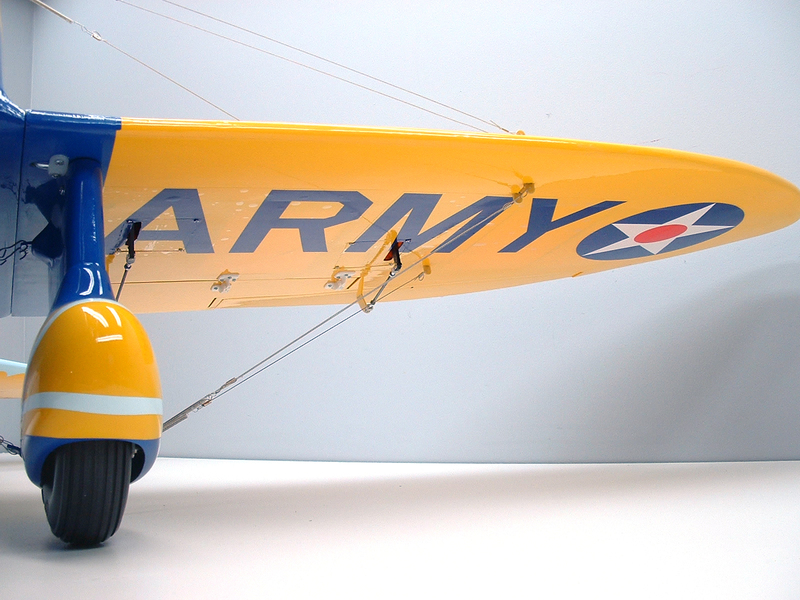 Flying from early 1932 to its retirement in 1956, the Boeing P-26A “Peashooter” was a first of its kind on two fronts. 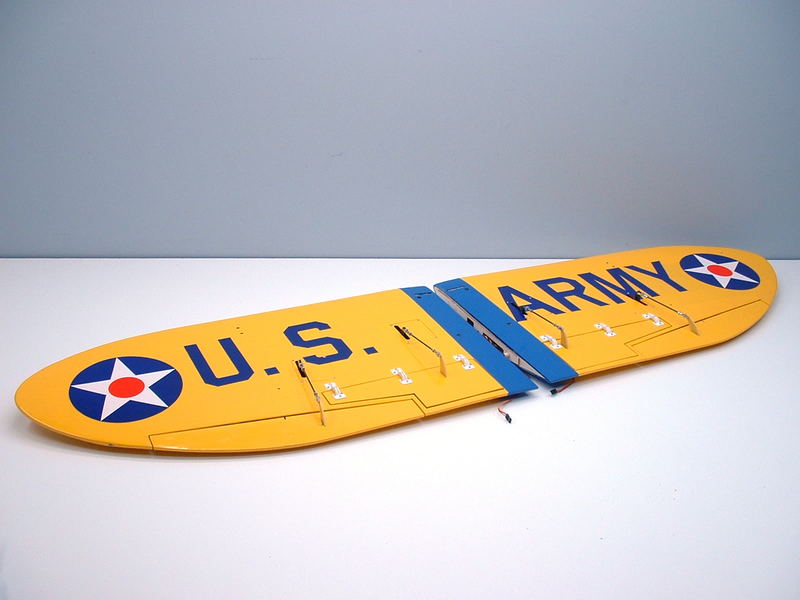 It was the first production fighter aircraft to be of all-metal construction, and the first single wing aircraft to enter squadron service in the United States Army Air Corps. 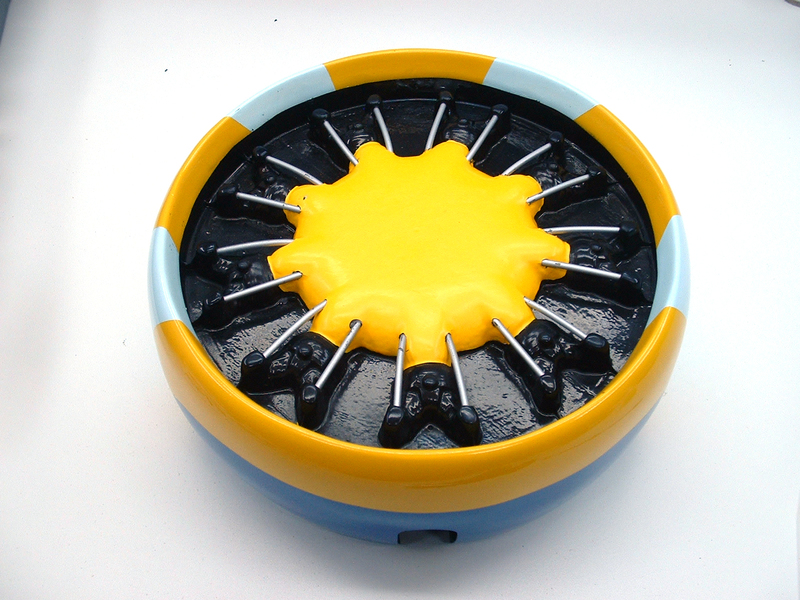 The Peashooter has a rather unique appearance, and had many, wild color schemes while being used. 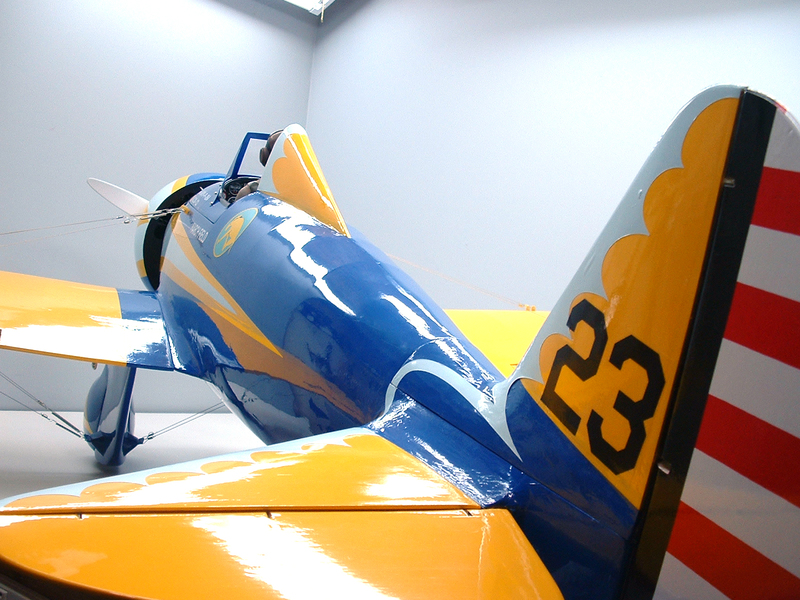 Ironically, the P-26 was also Boeing’s last fighter aircraft to enter service until the F-18. 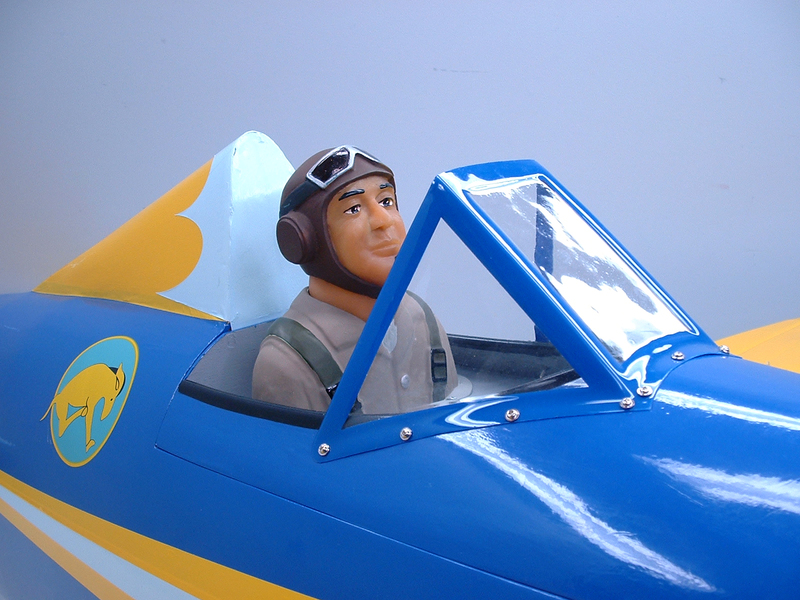 Seagull Models has gained a reputation for modelling some of the more unique scale aircraft from around the world, and the P-26 definitely fits into the ‘unique’ category. 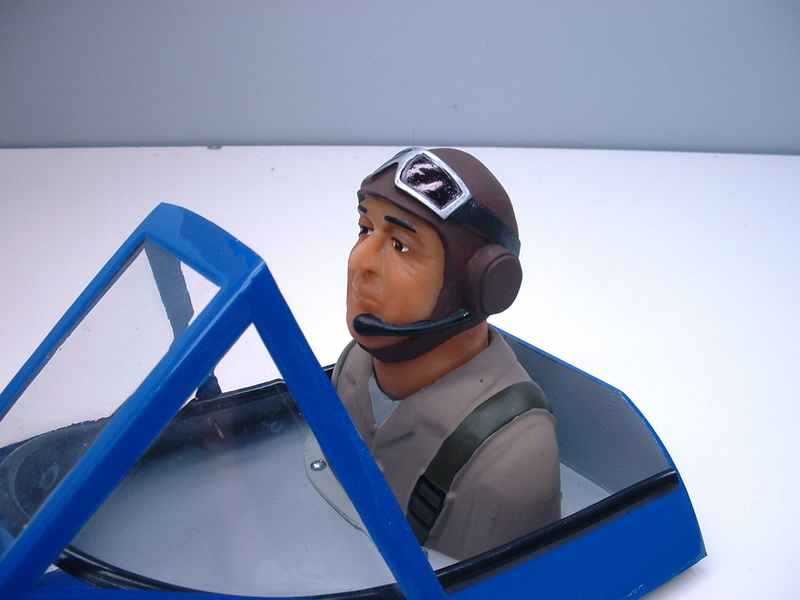 I must admit that as I started in on the assembly process, I was less than enthused by this airplane. 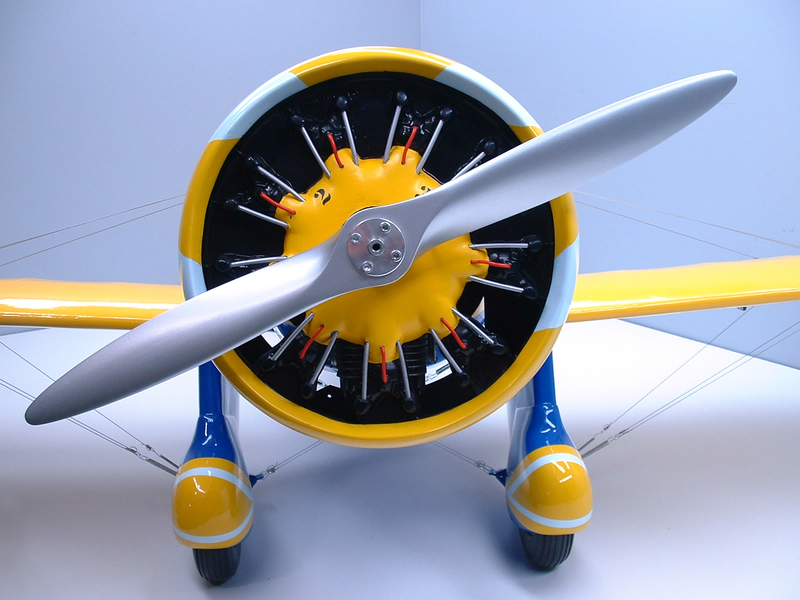 But, the more time I spent with it, the Peashooter grew on me, and I started to really like the look of this airplane. 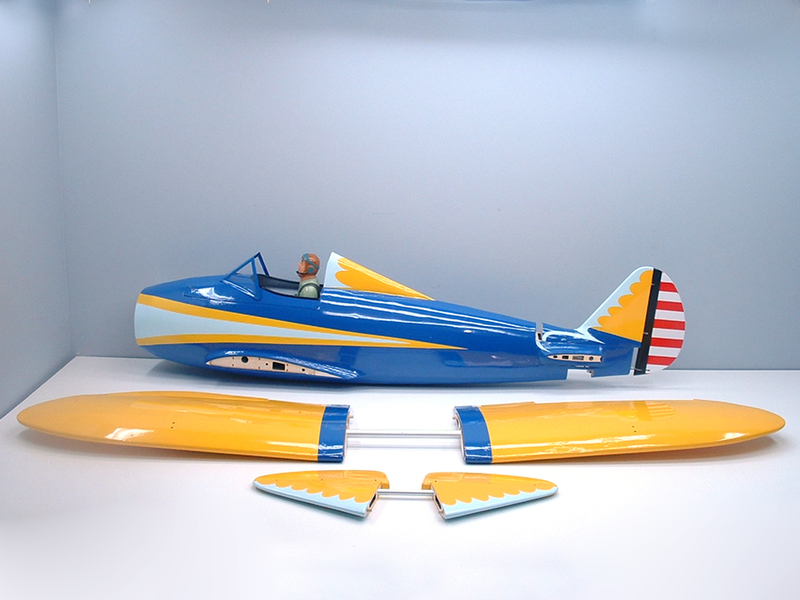 Throughout the assembly process, I had been posting photos on numerous Facebook group pages, and everyone that commented on my photos seemed to share my growing enthusiasm for this plane. 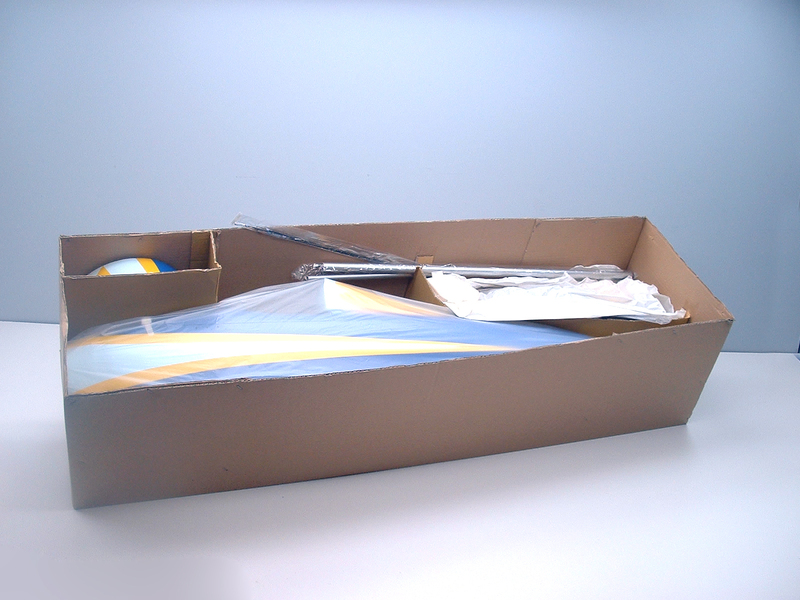 So, without me rambling on longer than necessary, let’s get the box on the bench and see what’s inside! 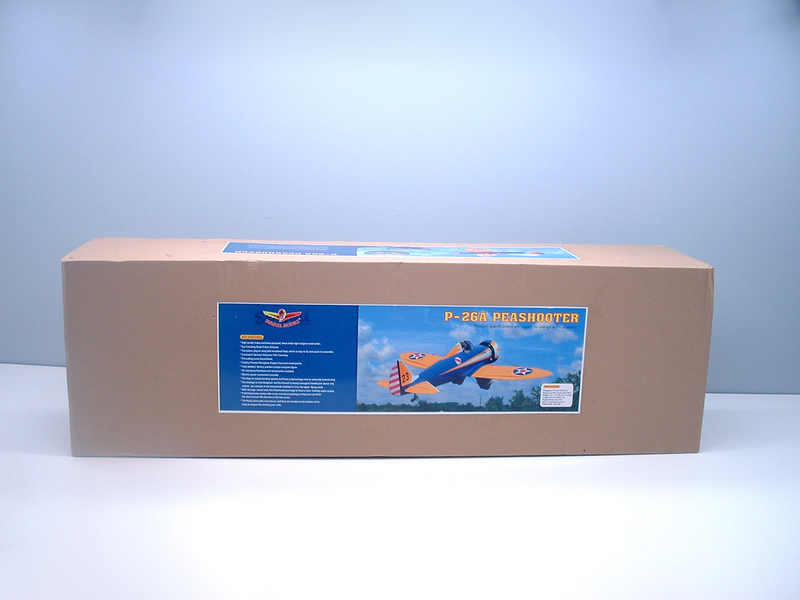 The P-26 arrived in a rather large box – let’s face it, as a 30cc sized model, it should have a large box! 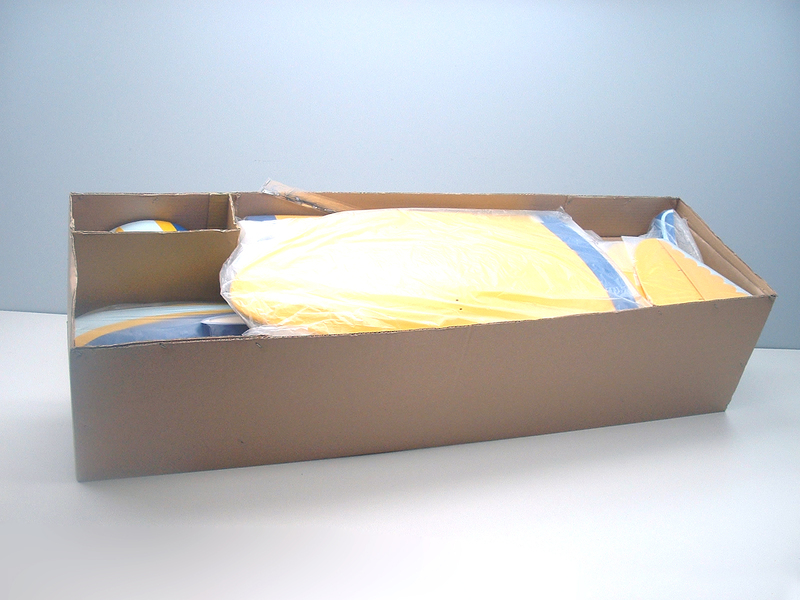 The contents were all packed very well, and survived transport from Vietnam to Willmar, Minnesota! 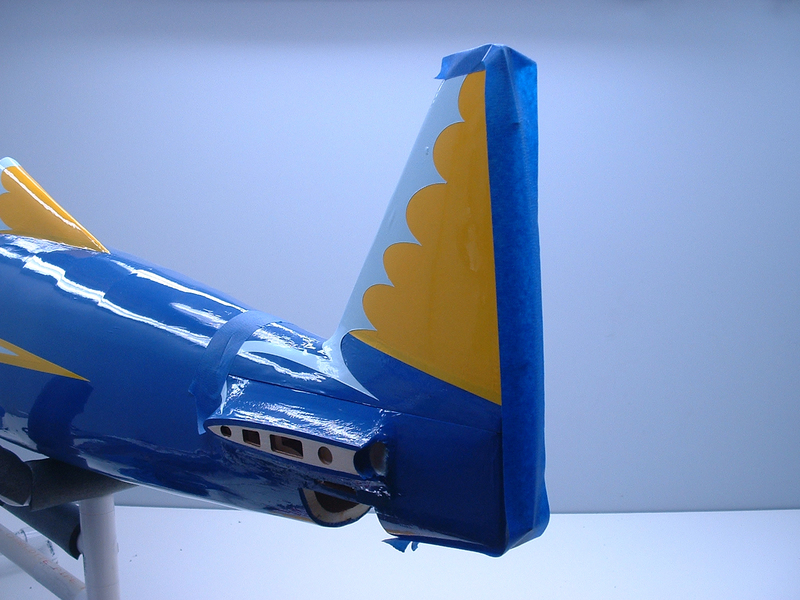 With the top layer of wings and tail surfaces removed, I got my first look at the large fuselage and HUGE cowl ring! 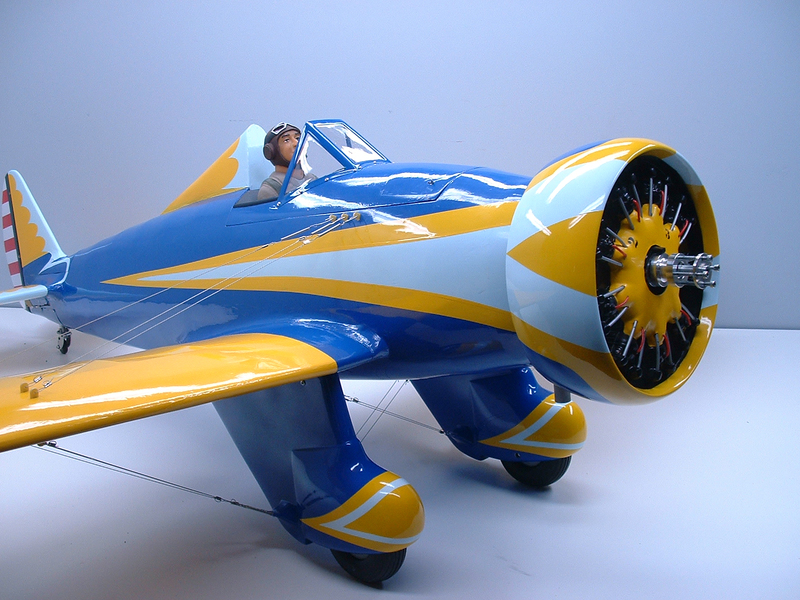 I was really starting to appreciate the size of this model aircraft! 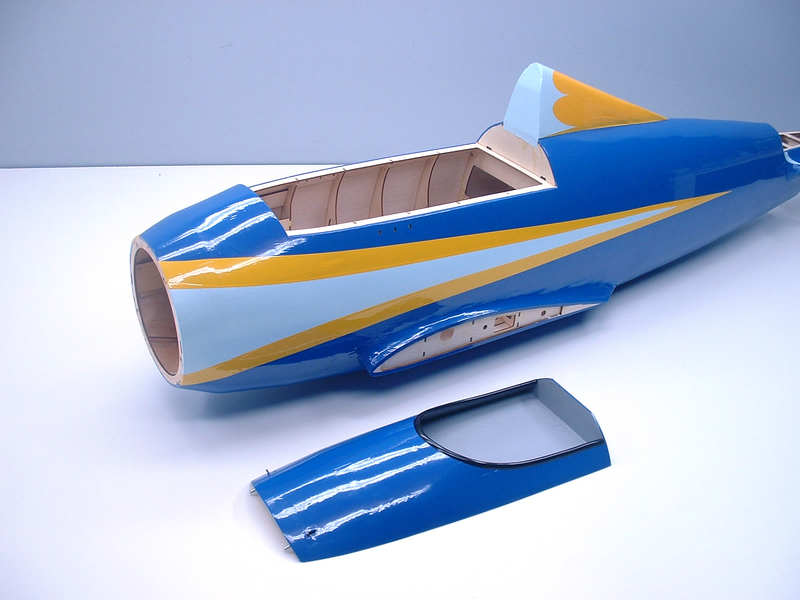 I set a few of the parts together on my bench, and laid out the wings and tail surfaces – The colors looked really good and the covering was well-applied. It always impresses me just how good the factory workers are at applying that much Oracover without getting it wrinkled! 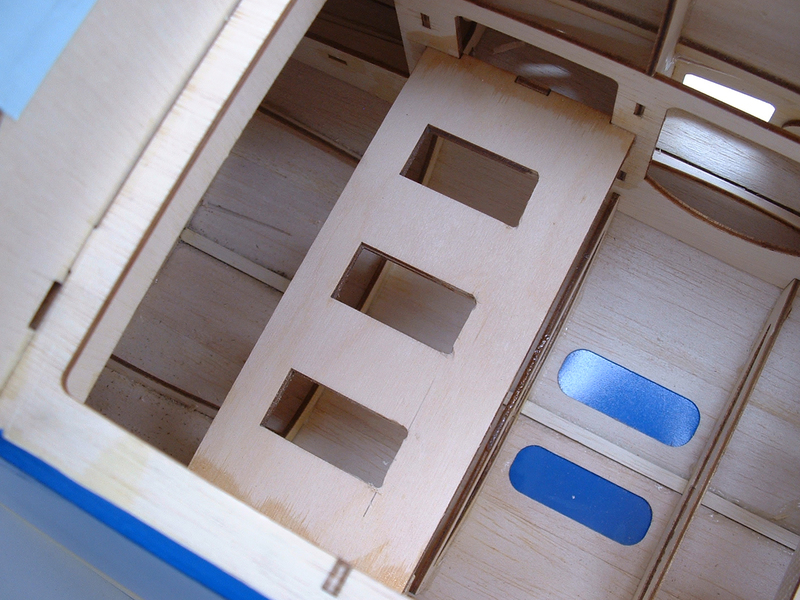 All of the control surfaces, except the flaps, are attached with hidden pinned-hinges. 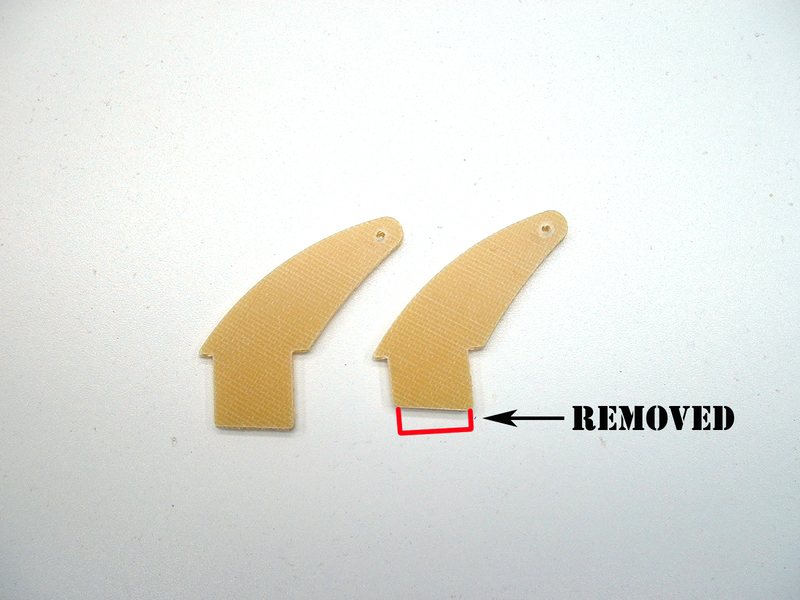 These make for a clean transition from flying or stabilizer surface to the control surface, and leave zero hinge gap. 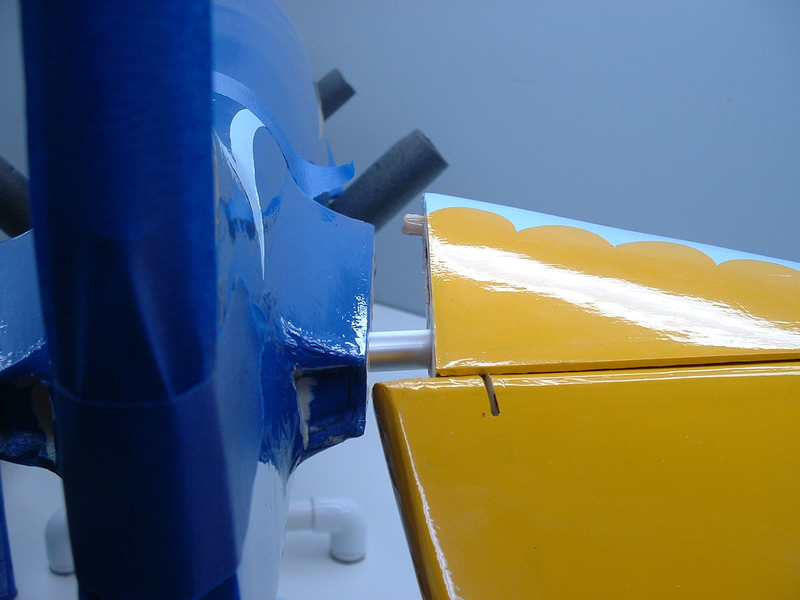 The pins are held in place with a clear tape – it’s applied well, and appears that it will keep the pins in place. 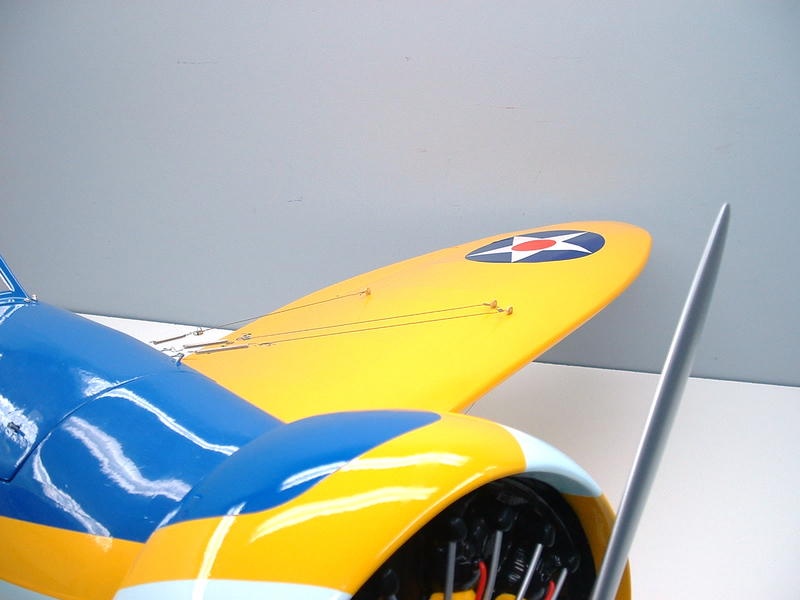 The LARGE fiberglass wheel pants/strut covers are very nicely painted to match the covering and trim scheme of the Peashooter, and the shock absorbing struts seem to be tough enough for landing the 30cc airframe. 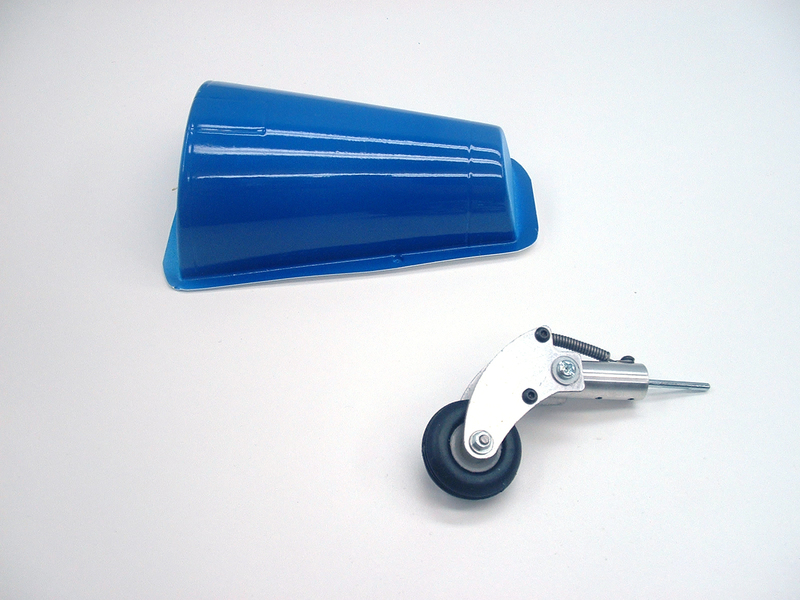 A pair of 4.5″ treaded, rubber wheels with plastic molded hubs are included with the ARF, and are a definite upgrade from some of the more usual foam wheels included with these planes. 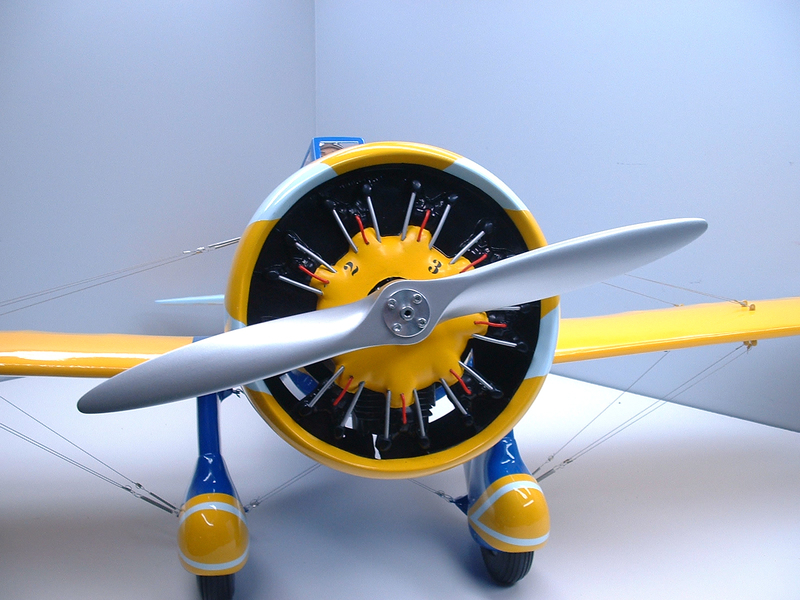 The painted fiberglass cowl ring, painted plastic dummy radial engine, and painted wood cowl mount are very nicely finished, and look great. 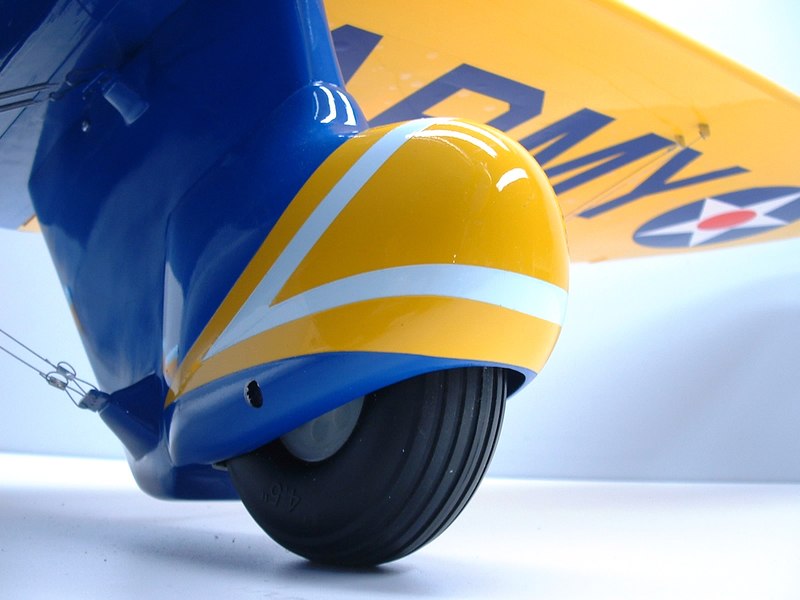 Also of painted plastic, the tail wheel mount cover is color-matched to the Oracover perfectly. 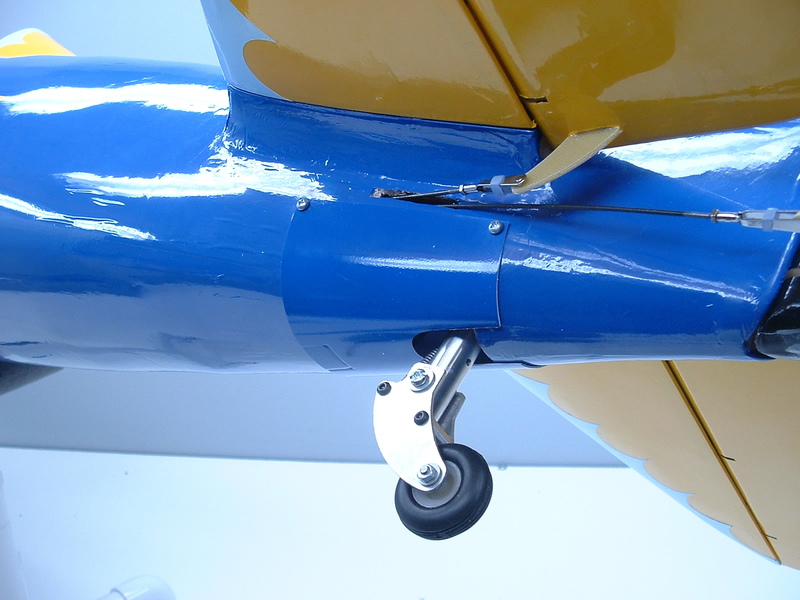 The sprung tail wheel assembly is ready to be slid into the pre-installed mount in the fuselage, and looks plenty robust. 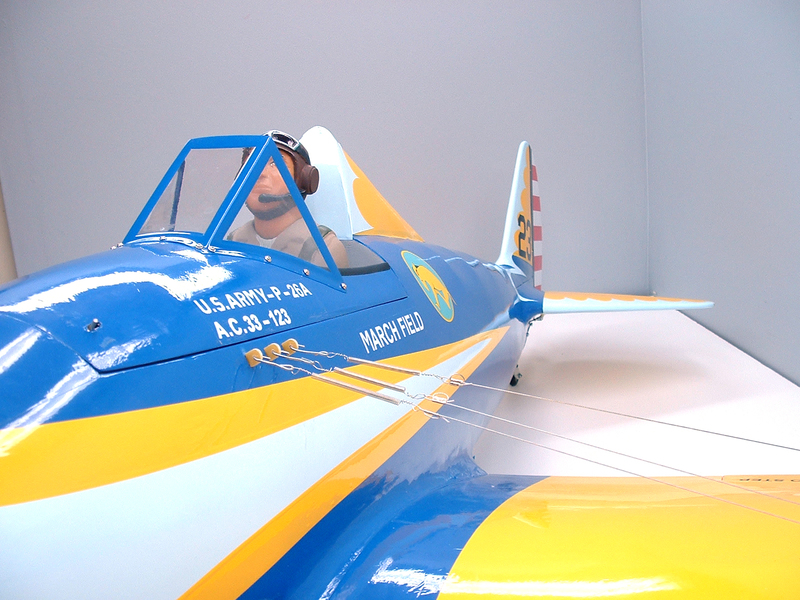 Two large sheets of peel-and-stick vinyl decals are included, and will add the extra pop of scale detail to the P-26! 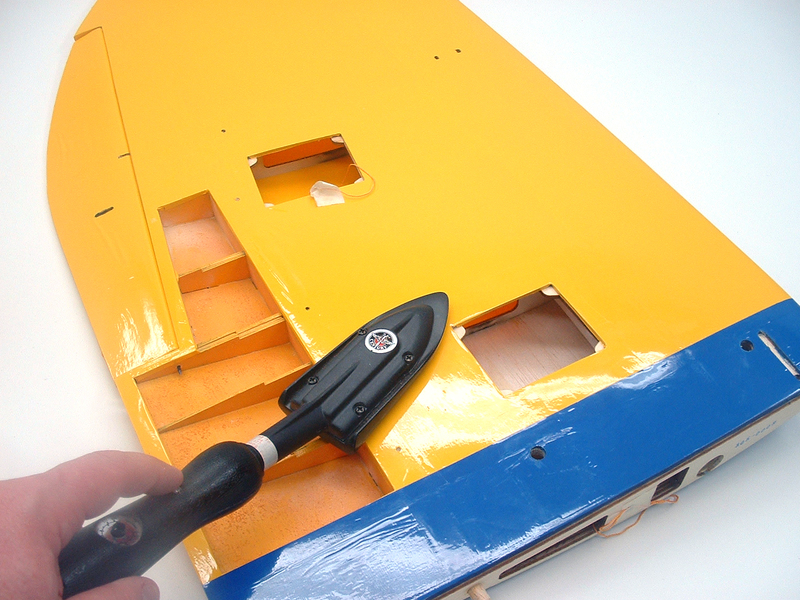 The included hardware is all definitely of good quality and can readily be used during assembly of the P-26! 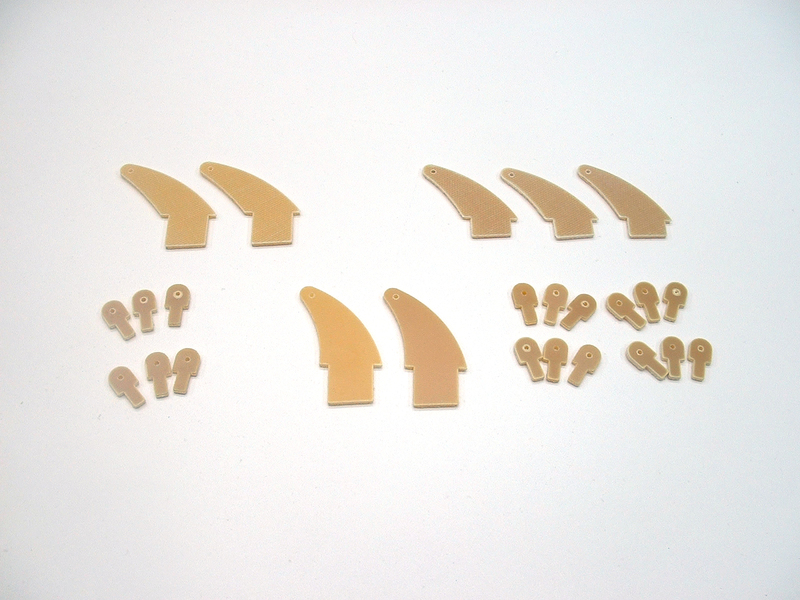 I really like Seagull’s fiberglass control horns – they are epoxied into pre-cut slots, and are an upgrade from nylon-type control horns that use a backing plate and screws! 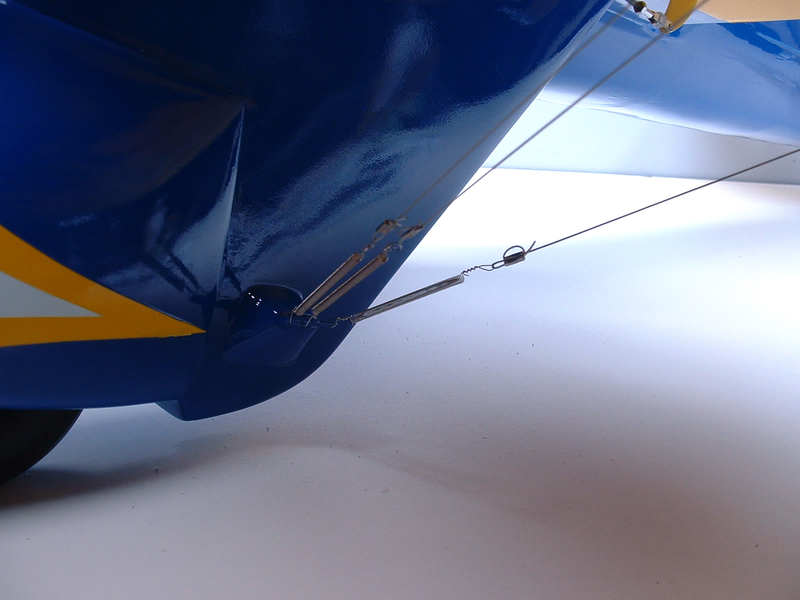 The wing wire springs are a little on the soft side, and will deform if pulled too hard, but do a great job at holding the wing wires in place. Talk about a top hatch! 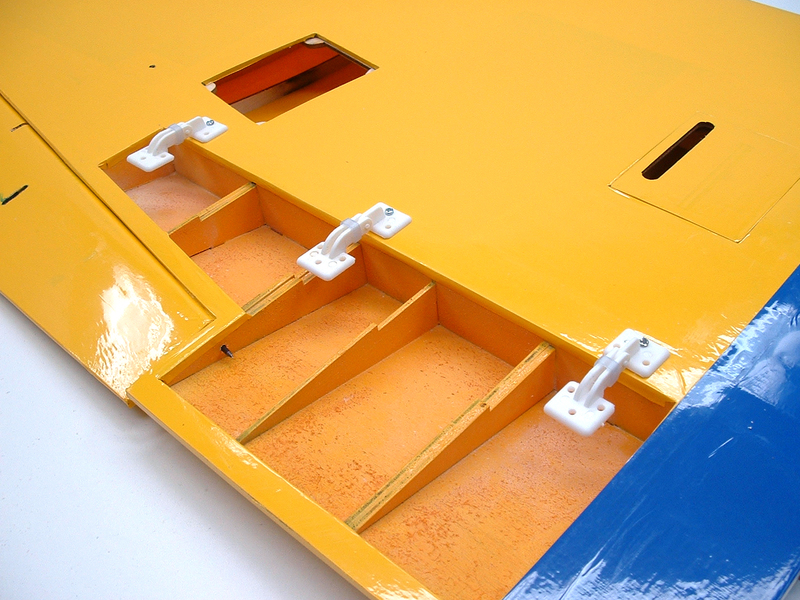 The battery/equipment access hatch is HUGE, and allows access for easy installation of all your accessories! 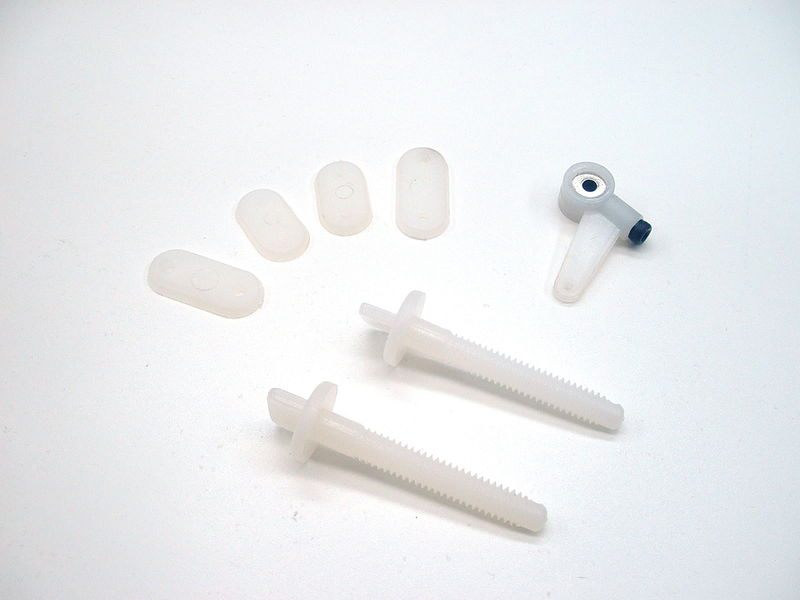 Seagull has stepped up their game with spring loaded pin-style hatch retainers, and they work really well! 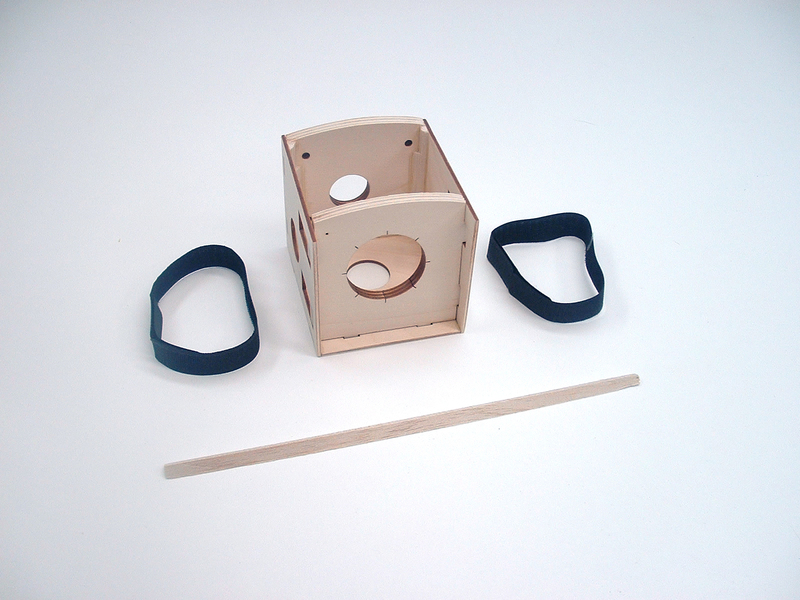 It’s also easy to see that Seagull has taken a lot of time developing the underlying structure in the Peashooter, and all of the laser cut parts fit together very nicely. 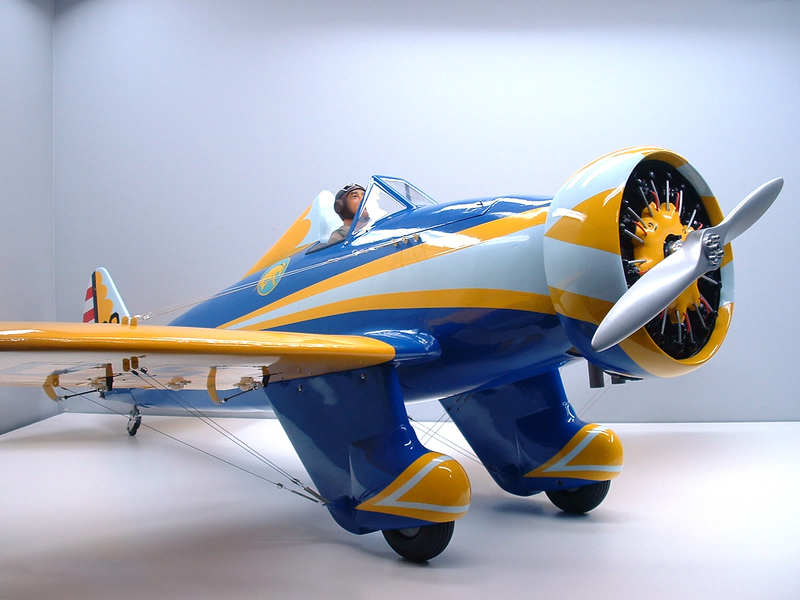 As is the case with almost every new Seagull ARF that leaves their factory, the P-26 includes the basic parts required for gas/glow engines or electric flight. 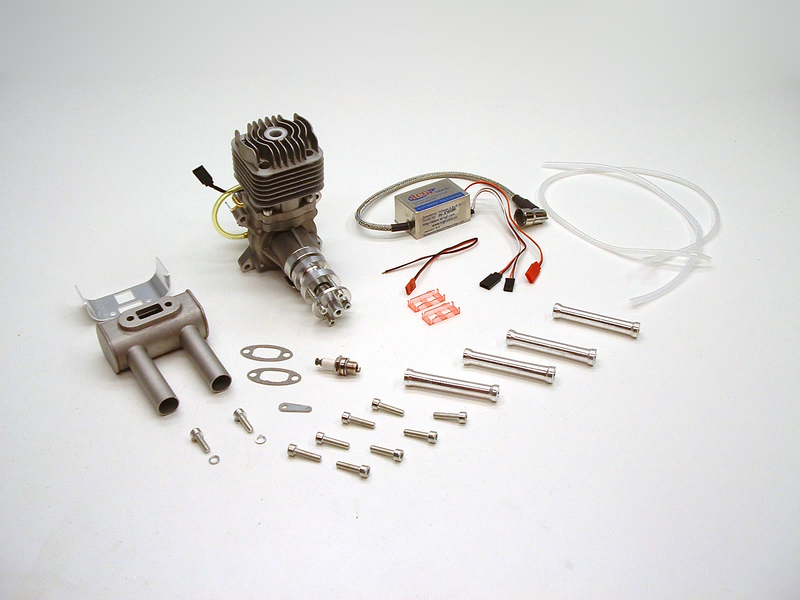 Because the Peashooter is 30cc sized, I’m going to be installing a gas engine in my review model. 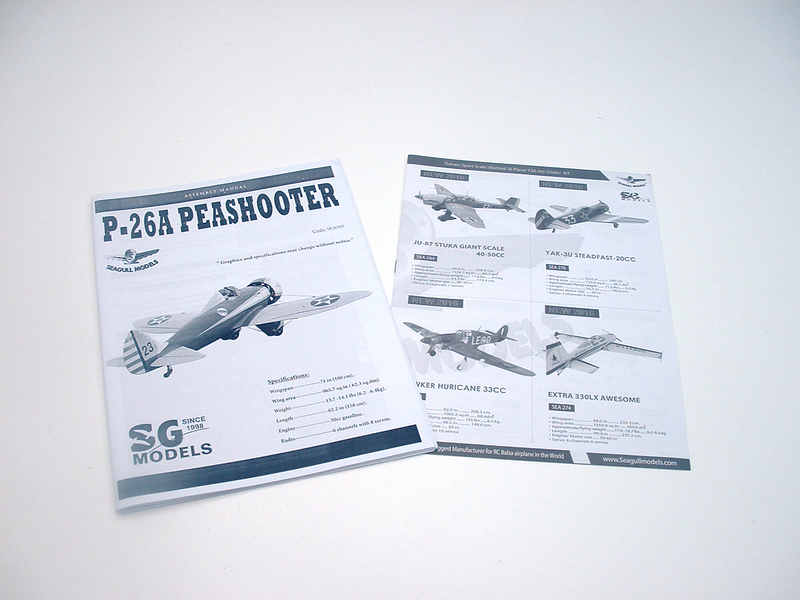 The included assembly manual is sufficient for putting the P-26 together. There are plenty of good illustrations, and lots of written instruction as well! 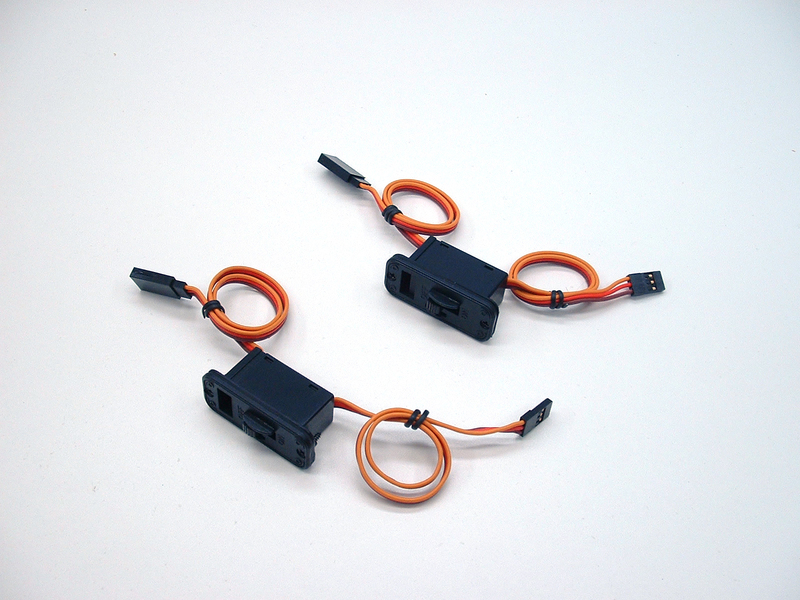 Batteries: Two 4.8-6.0 Volt NiMh batteries for receiver and engine ignition. 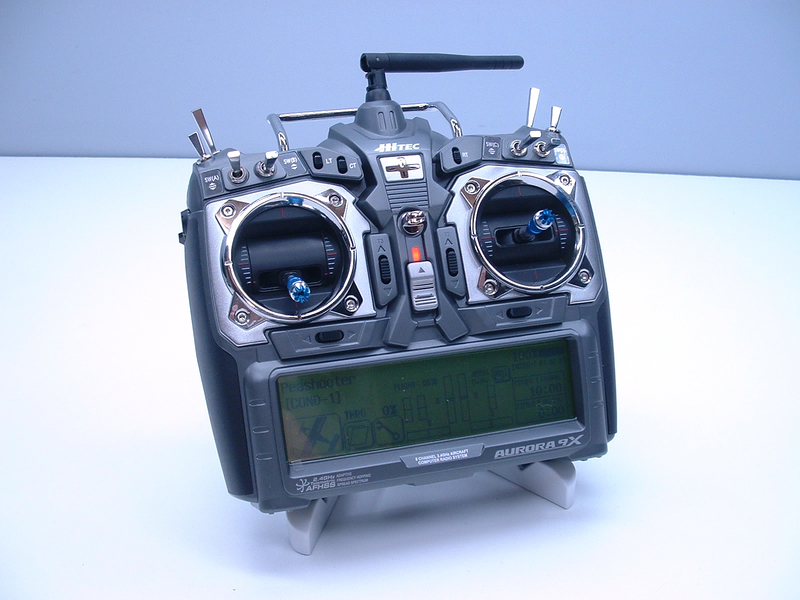 From the ground, I will be using my new Hitec Aurora 9X 2.4 gHz transmitter. This is a definite upgrade from my Flash 7, both in number of channels and programming options. The touch screen makes setting changes super quick and easy, too! 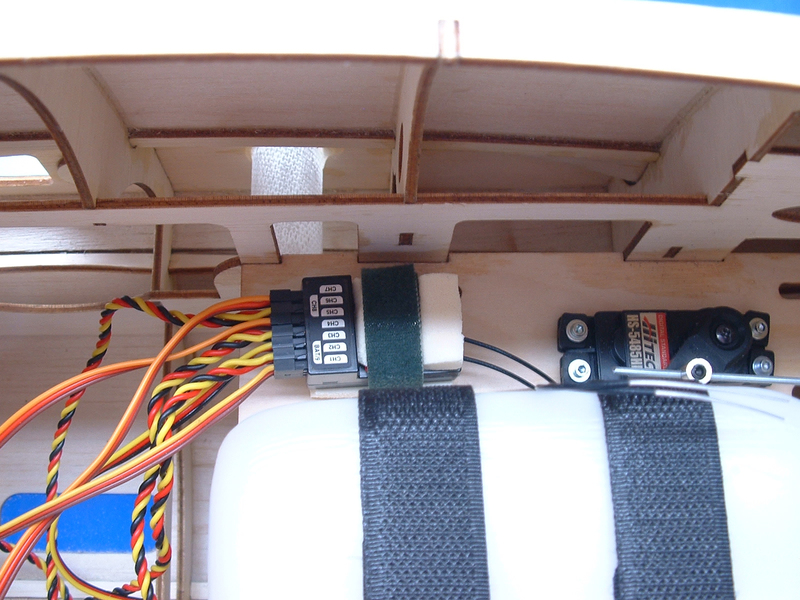 In the air, a Hitec Maxima 9 2.4 gHz receiver will be controlling all 8 of the digital servos on-board the Peashooter. 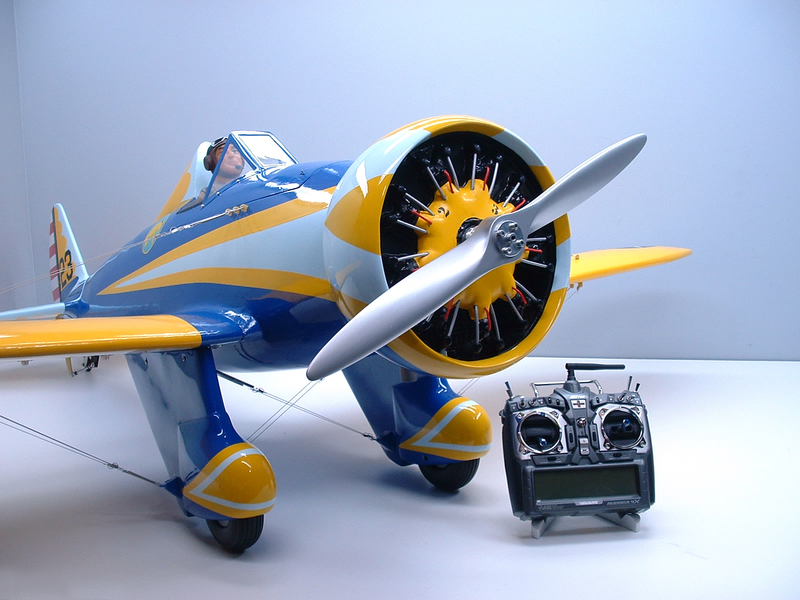 Seven HS-5645MG Digital, High Torque, Metal Geared servos will be taking care of the P-26A’s control surfaces, and an HS-5485HB Standard Karbonite Digital Sport Servo will be operating the throttle arm on the engine’s carburetor. 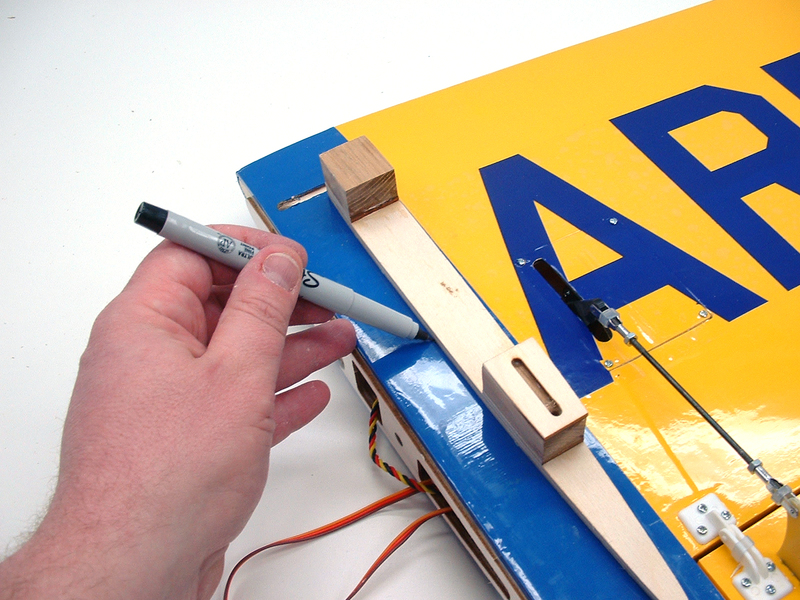 For this review, I will be putting each servo (control surface) on its own channel – this makes servo adjustment easy and setup a breeze! I haven’t spent a whole lot of time with the Aurora 9X yet, but I’m already loving the ease of programming! 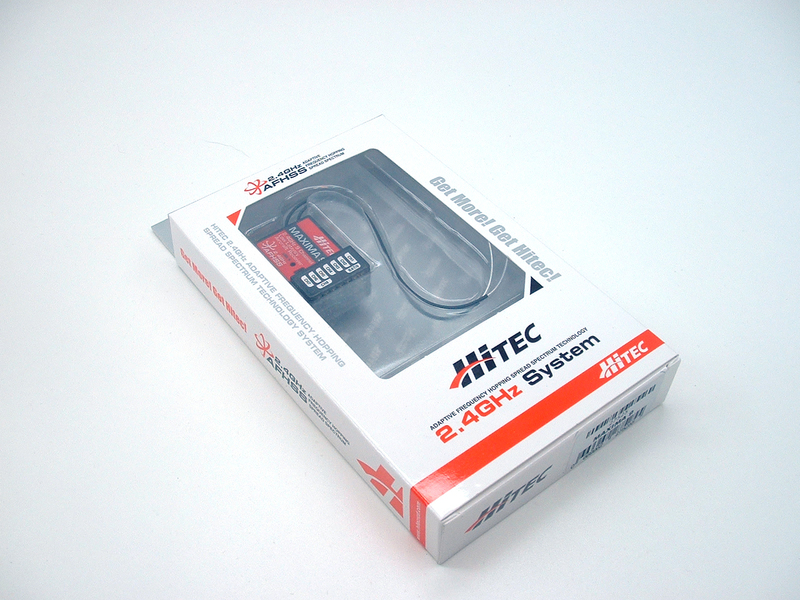 This is definitely my new go-to Hitec transmitter!!! Speaking of the engine…. 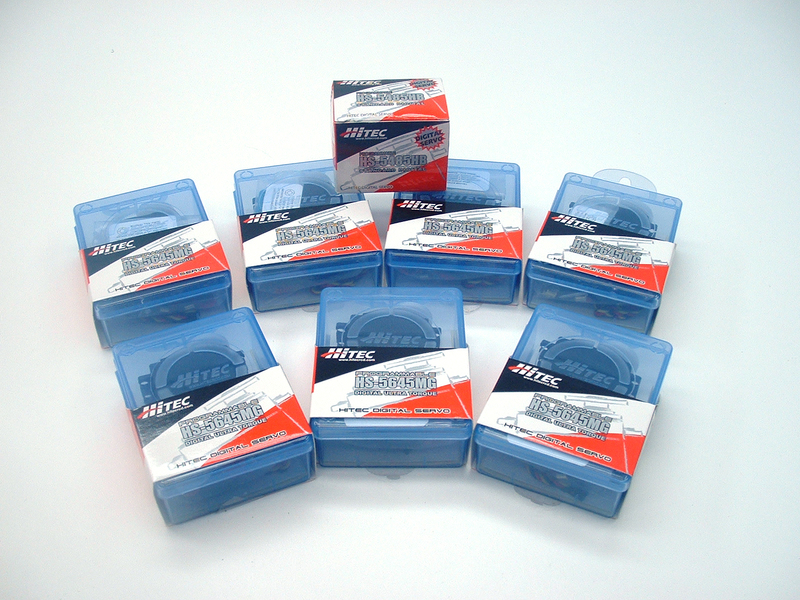 I will be using the new RCGF 35cc rear exhaust 2-stroke gasoline engine for this review. 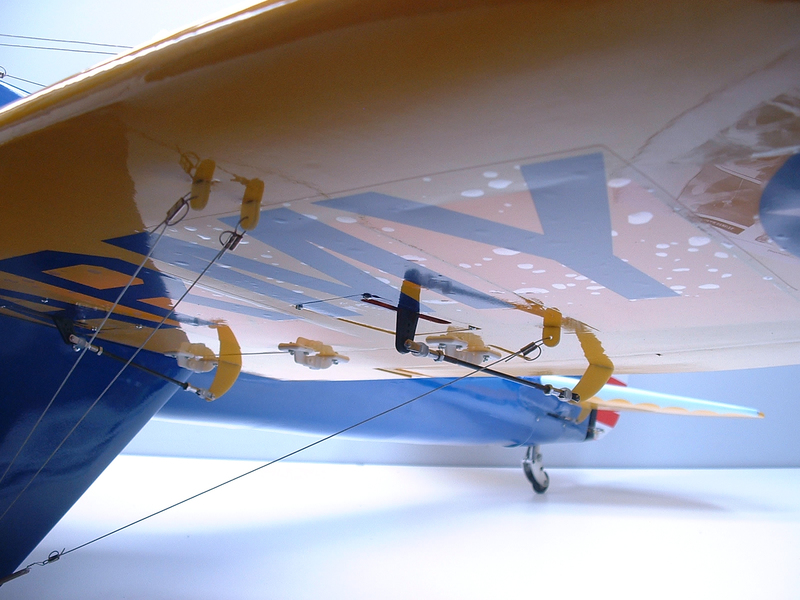 The RCGF 35RE should have more than enough power to pull the P-26A around the sky, accompanied by a BRAND NEW Falcon 20×8 PAINTED Civilian Beechwood Propeller. 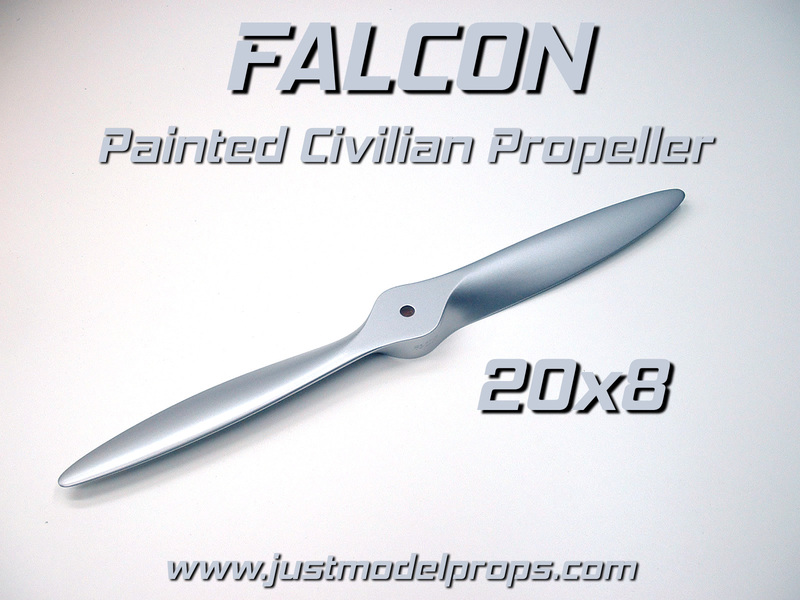 The engine is available through RCGFusa.com, and Falcon Propellers are available through justmodelprops.com and Bob’s Hobby Center at Steve’s Hangar in Orlando Florida! 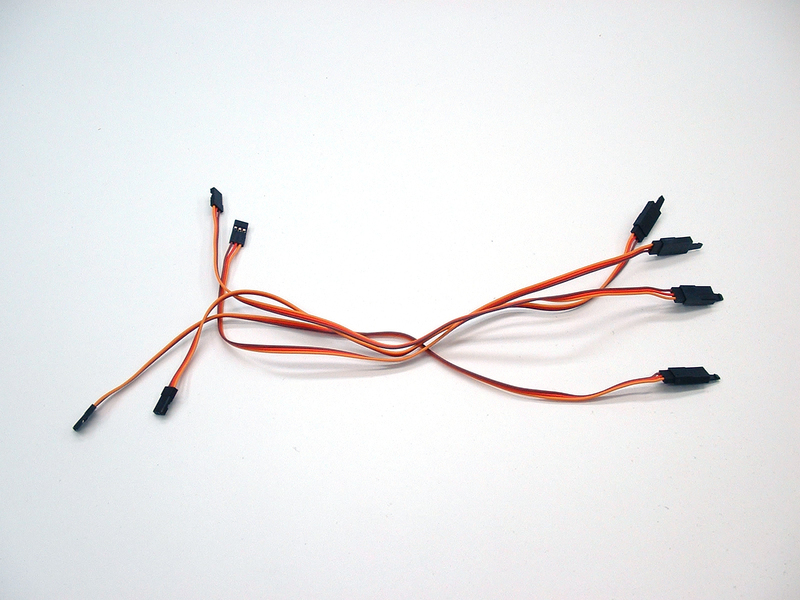 The other accessories I used to assemble the Peashooter were as follows: Eight (8) 12″ servo wire extensions, Two (2) heavy-duty switch/charge jacks, and four (4) Hitec HD-LL heavy duty long length servo arms. 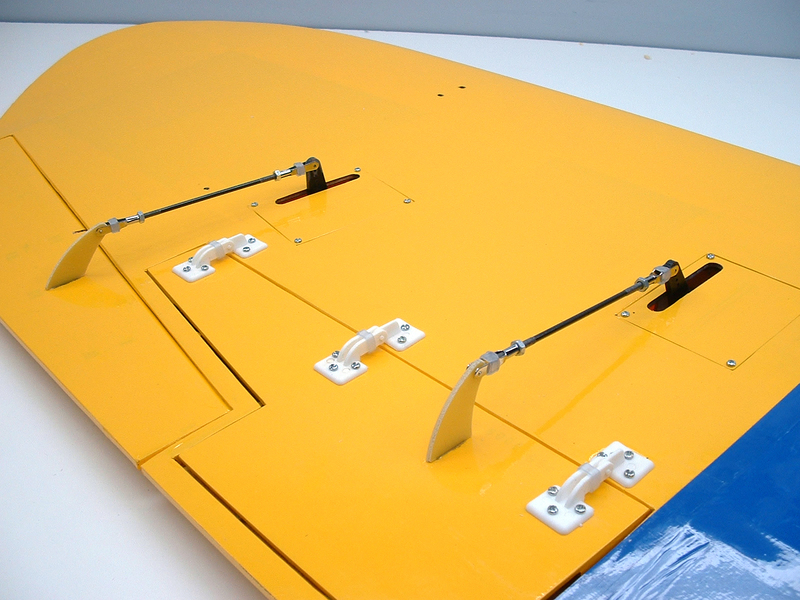 These arms make attaching the aileron and flap pushrods easy, and eliminate binding of the pushrod at the hatch surface! 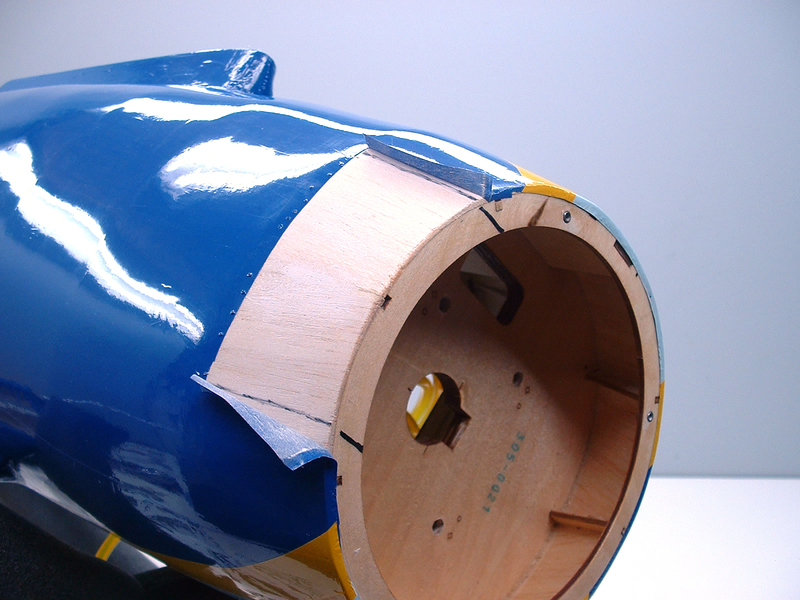 Though there were only a few minor wrinkles, I tightened and sealed all of the covering prior to beginning assembly. This is so much easier when the parts are NOT assembled! As I said, there were only a few spots that needed attention, so this step was done quickly. 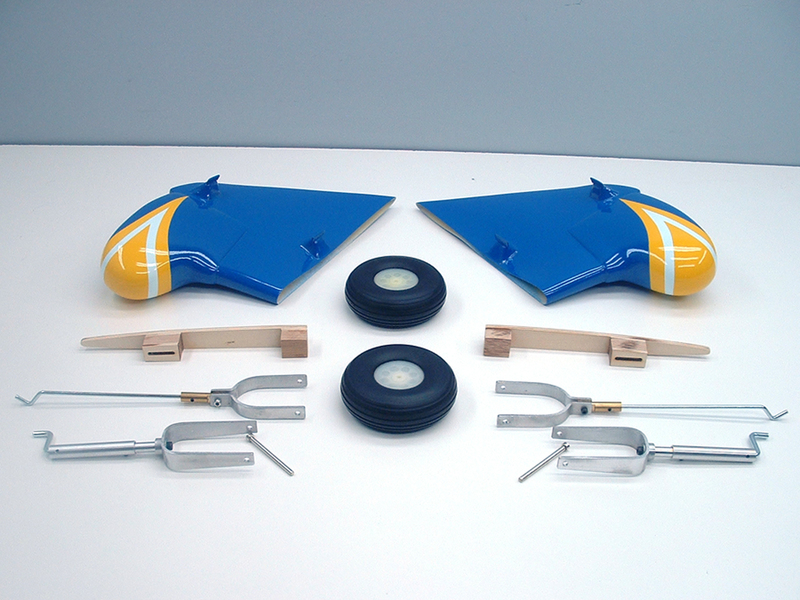 Assembly began like many ARF aircraft – assembling the wings. 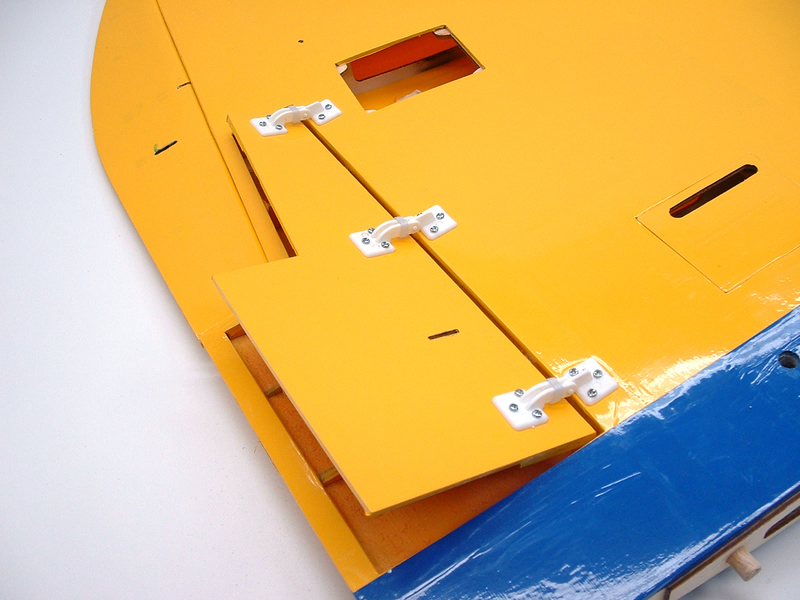 For Seagull models that incorporate flaps, installing them is where we start. 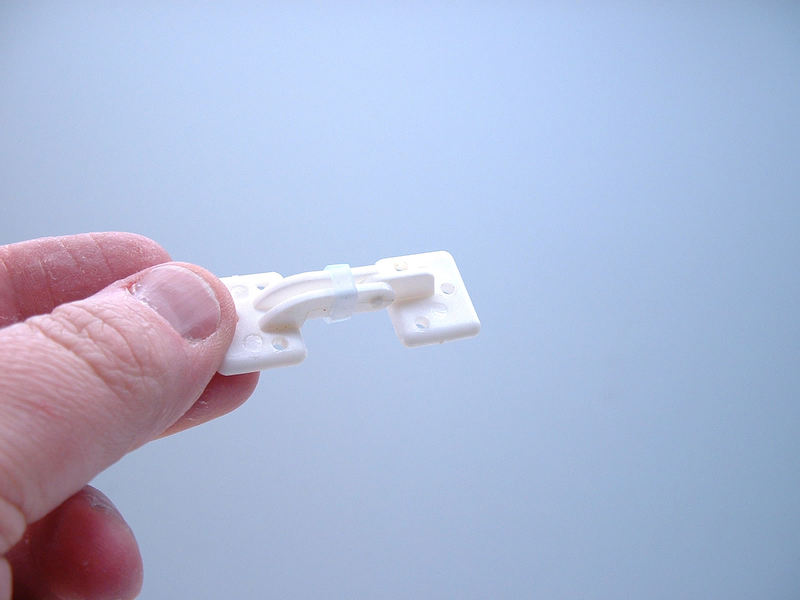 The two piece molded hinge is first assembled – I like to add a small piece of large diameter silicone fuel line to ensure that the hinge doesn’t separate under load. 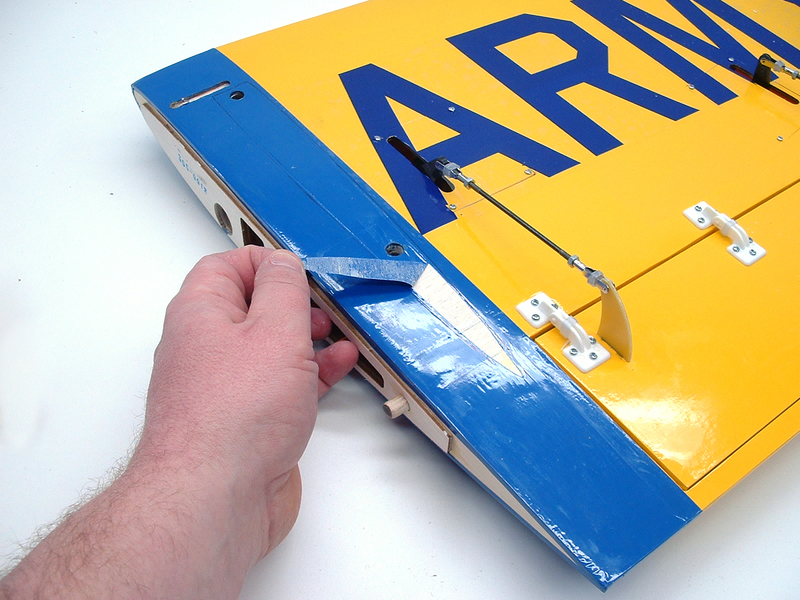 The hinges are attached by drilling holes at the pre-marked locations on the wing, and then attached to the flap. I taped the split flap in place to make sure it didn’t move during installation. After drilling all of the holes (six per hinge), I turned a screw into each and then removed the screw – this creates threads in the wood, which were hardened by applying a drop of thin CA to each hole. 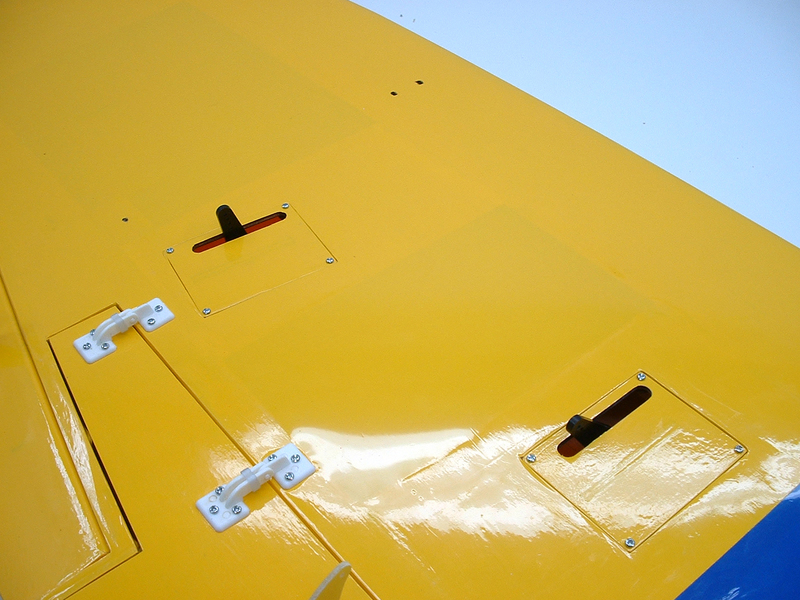 When the CA had cured, the screws were all installed, which in turn secured the flap to the wing! ***Editor’s Note*** Though the flaps fit in the openings fairly well, a slight amount of trimming was required to make them fit and move perfectly. 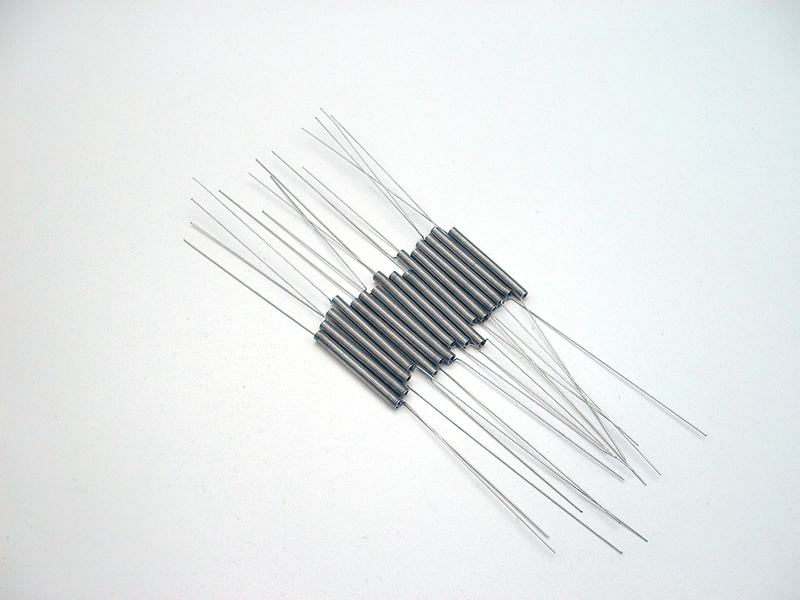 Because of the size and nature of this model, this will be a non-issue for any intermediate to expert modeler. 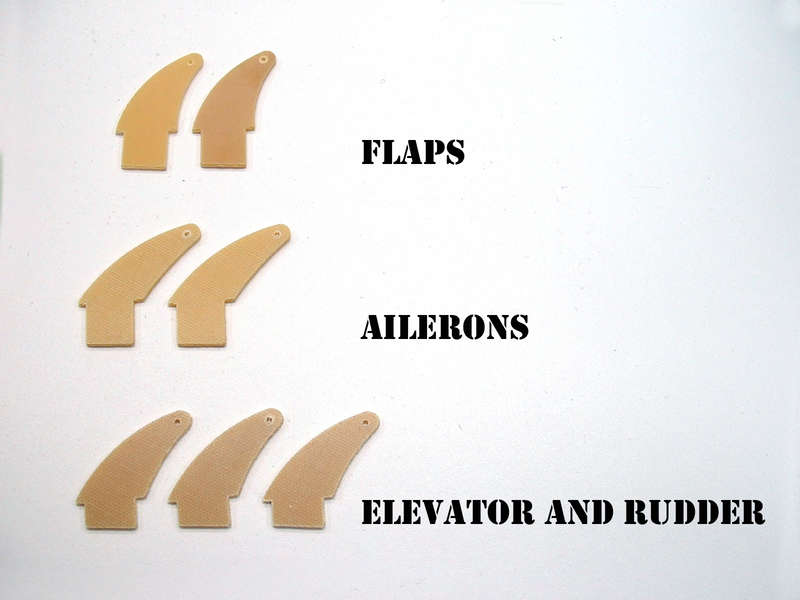 Here’s an important photo – Please take note of which control horn is for which location. 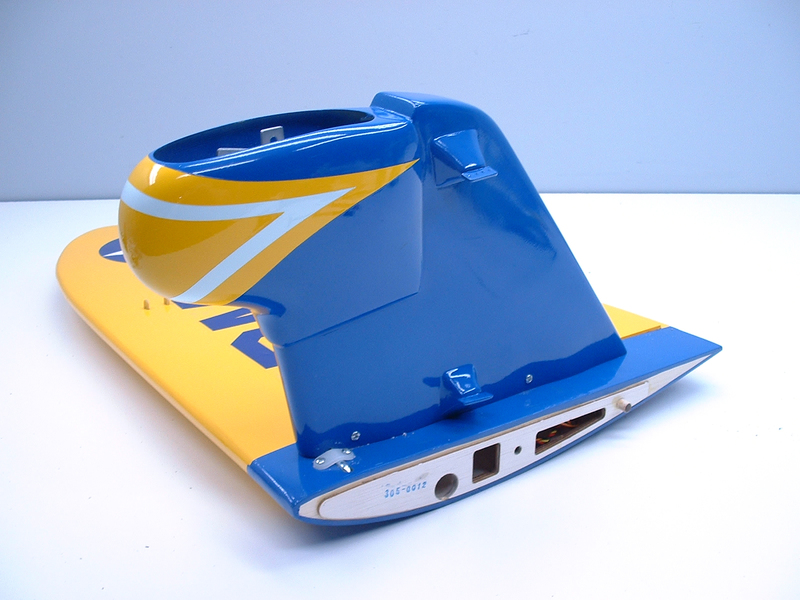 They ARE different, and need to be placed properly to ensure the control surfaces operate correctly! 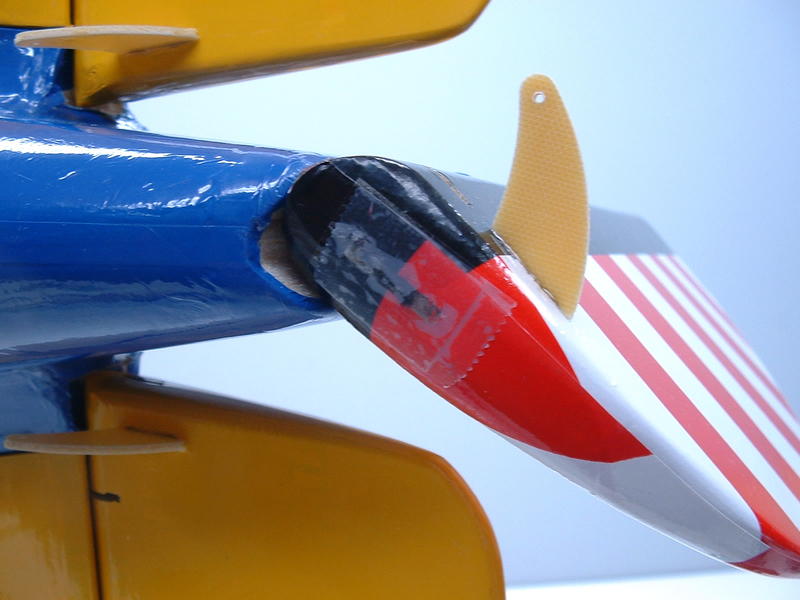 One small issue I ran into while assembling the wings was the fittment of the aileron control horns. 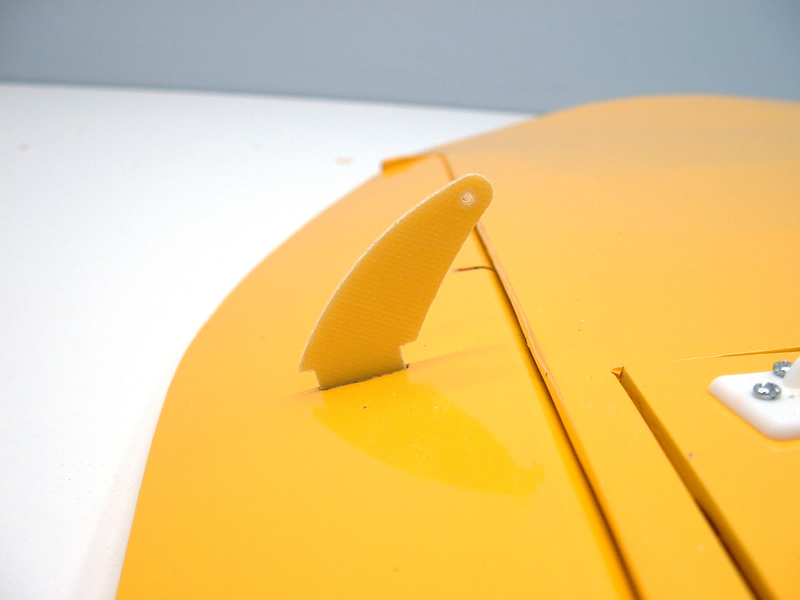 The tab that gets epoxied into the aileron was too long. I trimmed the tab to fit using my small 1″x30″ belt sander that my wife got me for Christmas in 2017 – I never realized just how incredibly useful this tool was until I got one! 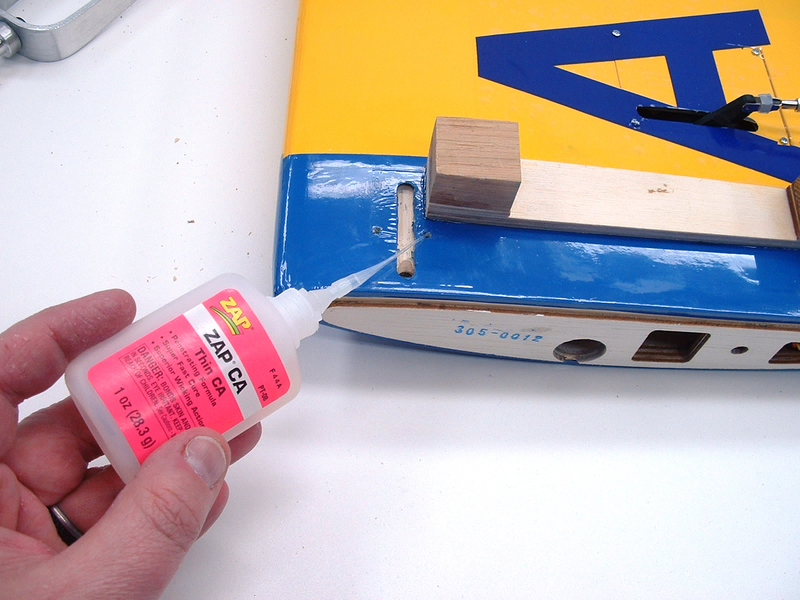 When I was satisfied with the fit of the aileron and flap control horns, I epoxied them into their respective control surface using ZAP 5-minute epoxy. 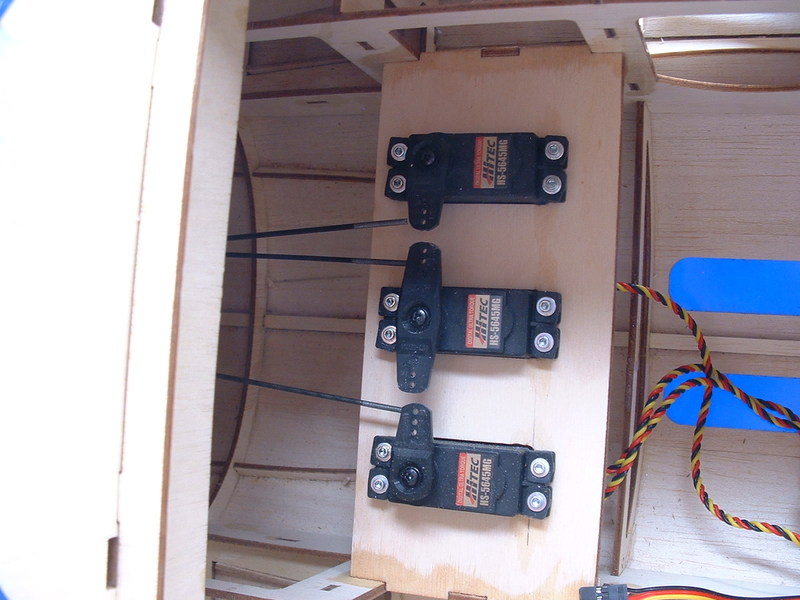 The aileron and flap servos were readied for installation, and then attached to the servo hatches. 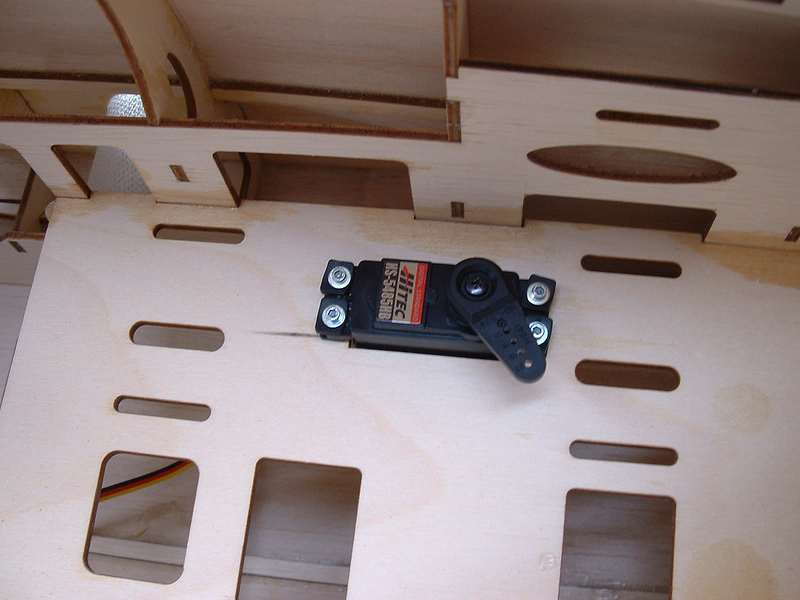 I use a piece of 1/16″ light ply as a spacer between the hatch and the servo case. 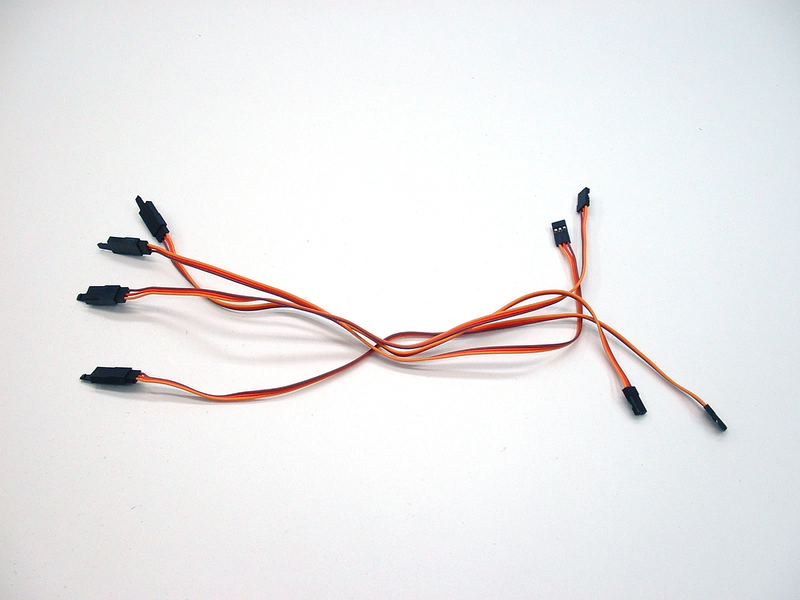 This helps reduce airframe (engine) vibrations to the servos. 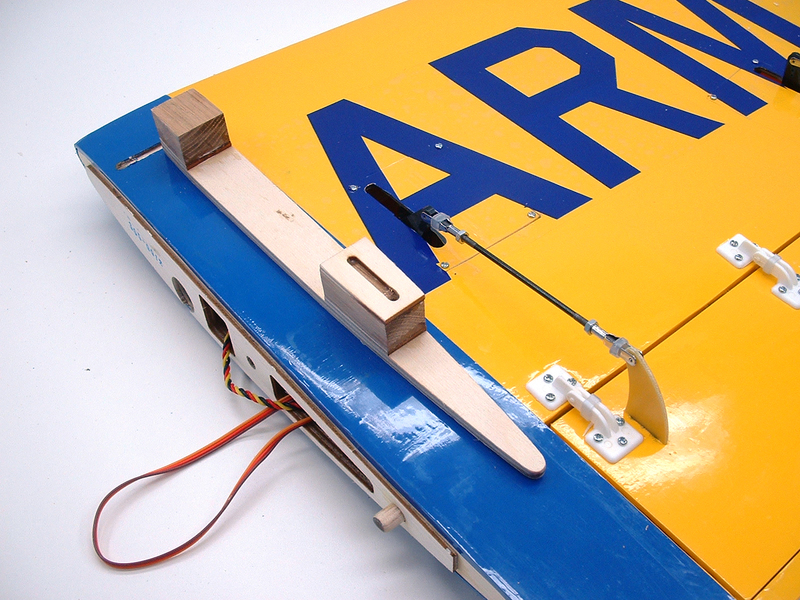 The pre-installed pull-string made it easy to pass the servo wires through the wing. 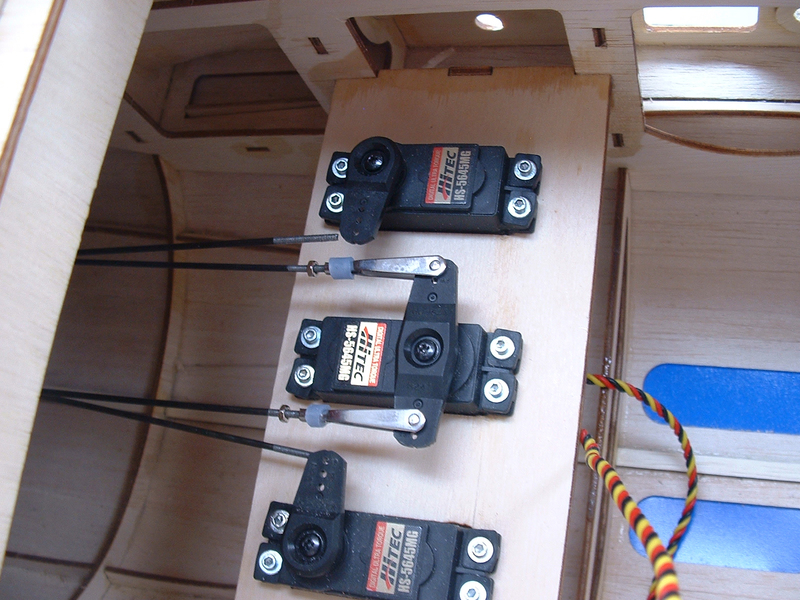 With the wires pulled through the wing, the servo hatches were installed and secured with four small wood screws per hatch. 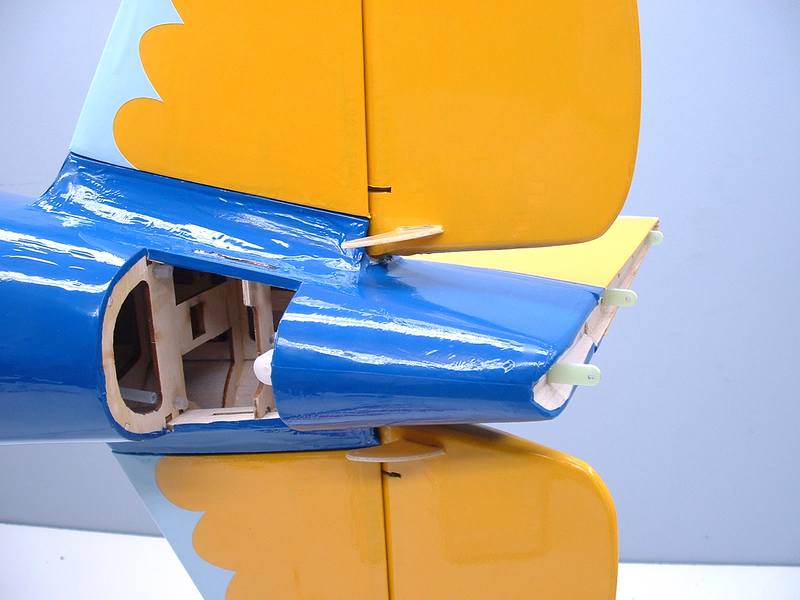 I then centered the control surfaces, set the servos to center (aileron) and up (flap) and adjusted and installed the aileron and flap pushrods. 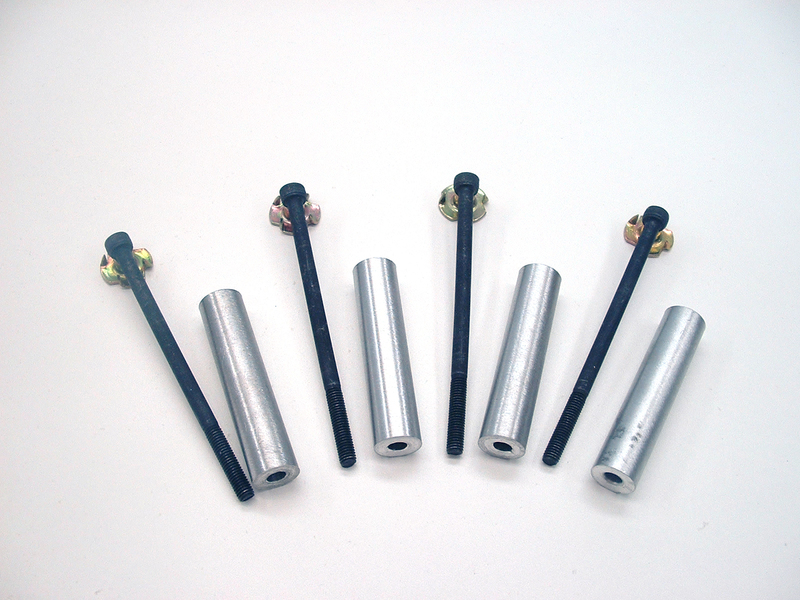 These pushrods are quite stout, and conisted of a 3mm rod, a pair of metal clevises, and lock nuts. 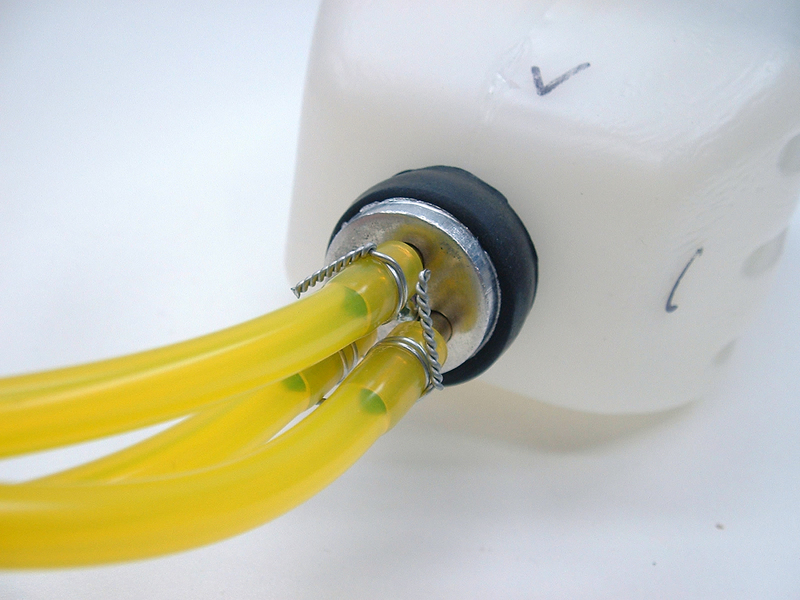 I did add a small piece of large diameter silicone fuel tubing to reduce the chance of the clevis opening mid-flight. 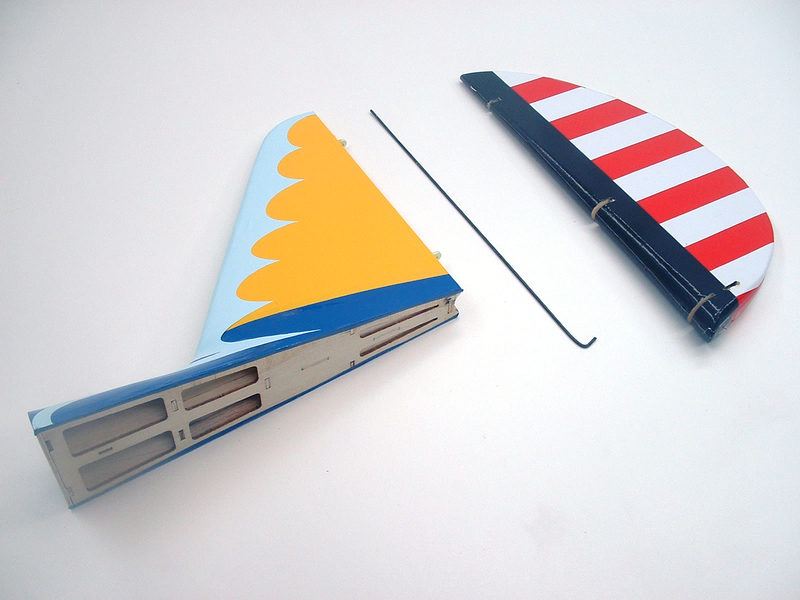 One more little issue I ran into was on the left wing flap hinge installation – due to the control horn slot placement on the flap, I had to move the hinge approximately 1/4″ toward the root of the wing. 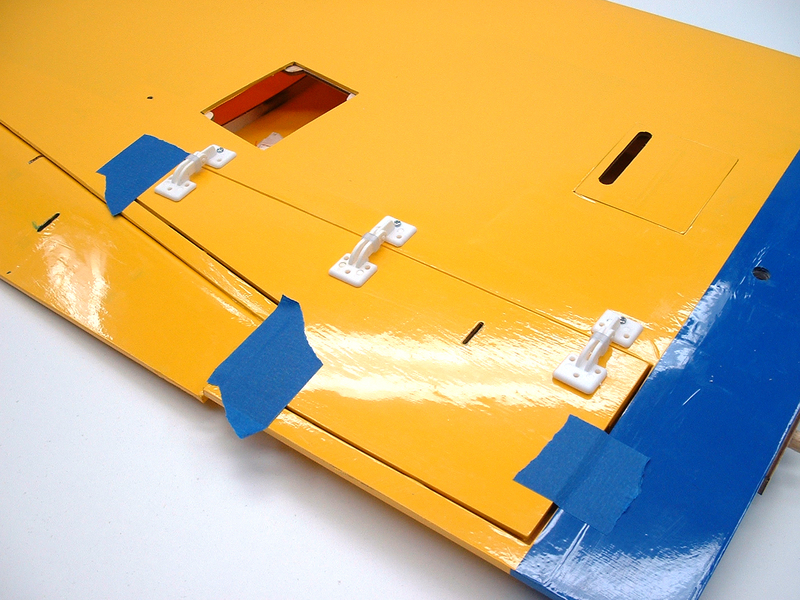 This will give you just enough clearance so that the hinge base doesn’t cover the flap control horn slot. 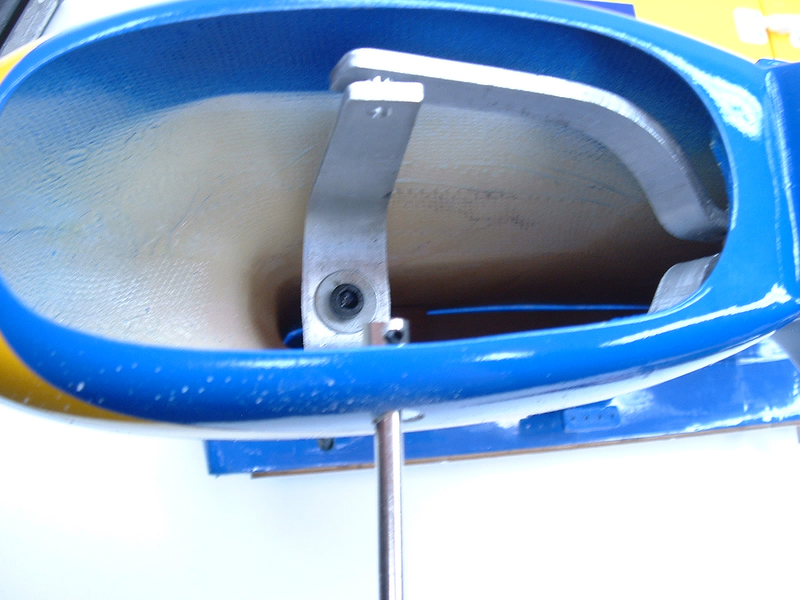 The larger hole, to the right in the photo above, is the stock location for the flap hinge. 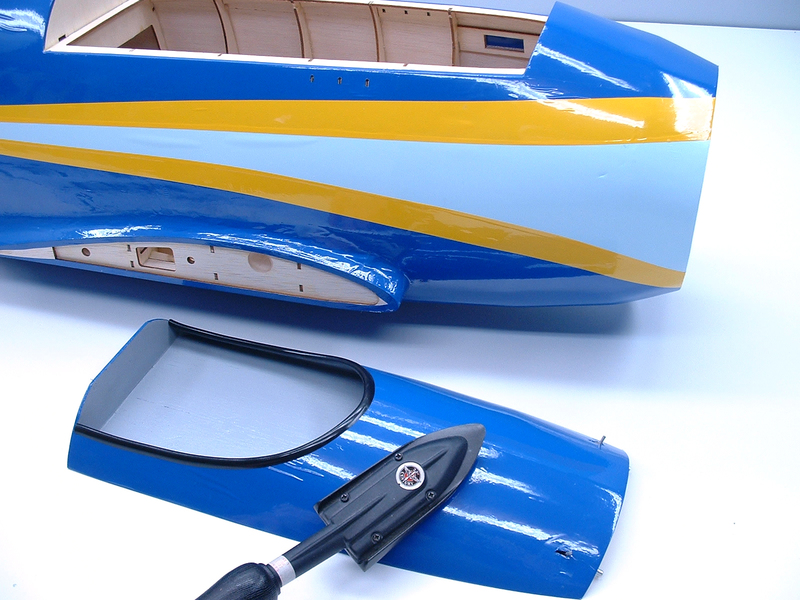 It dawned on me after installing the servo hatches, flaps, and pushrods that I would have to work around them to apply the decals. While not COMPLETELY impossible, I did decide that it would have been a lot easier to install the decals before any of the other ‘obstructions’ had been put in place. 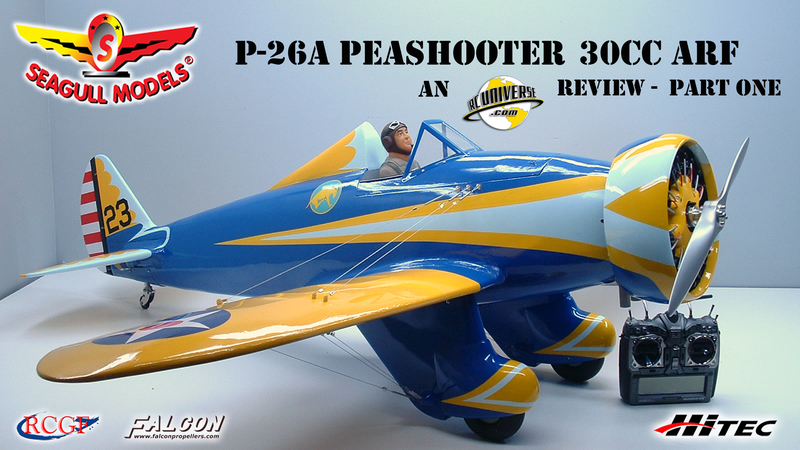 So, for those of you reading this review prior to assembling your Peashooter, INSTALL THE DECALS FIRST!!! 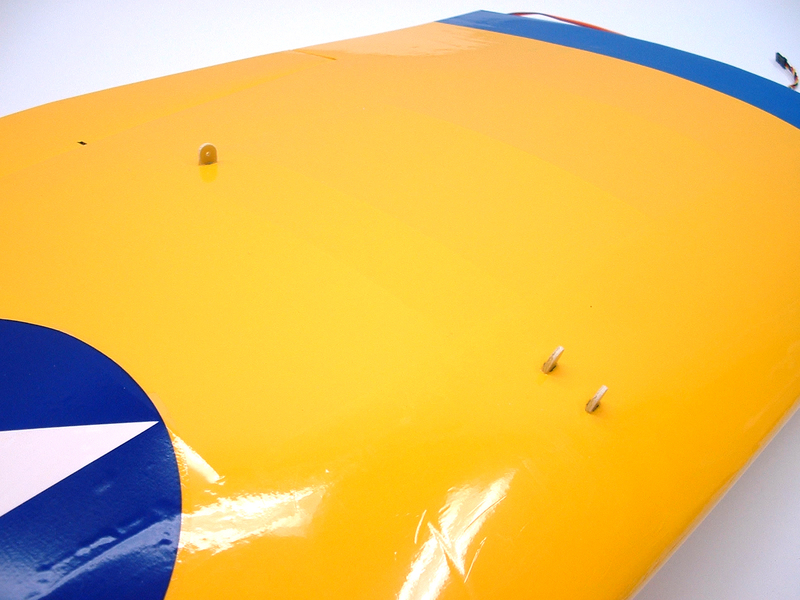 The flying wire mounting tabs were then epoxied into the pre-cut slots in the top and bottom sides of the wing. There are a total of six tabs for each wing half. 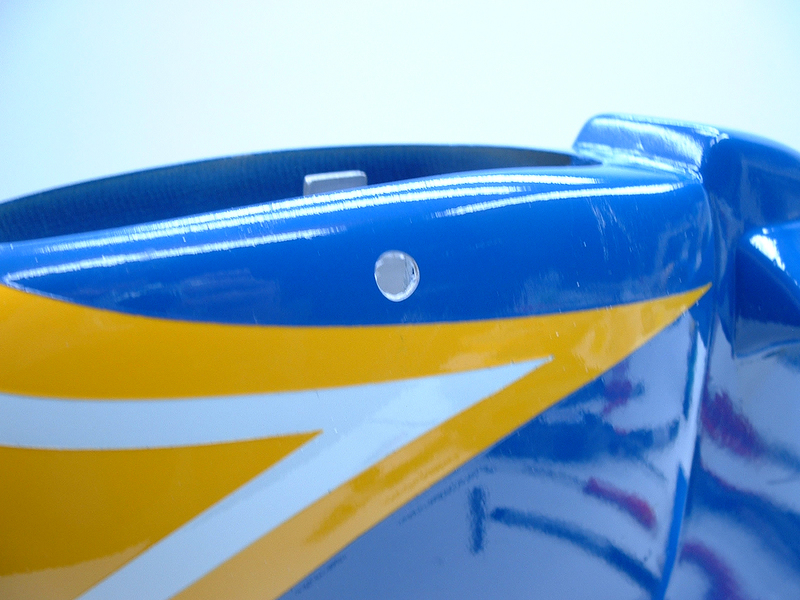 Moving on to the landing gear, I placed the LG mounting plate in place on the bottom side of the wing, traced around the plate, and cut and removed the covering. 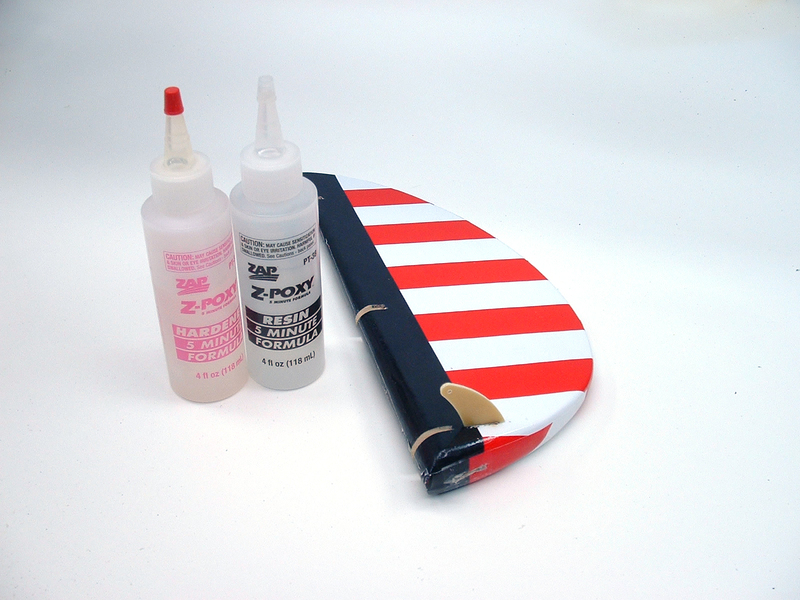 The LG plate was epoxied to the wing using 30 minute epoxy. 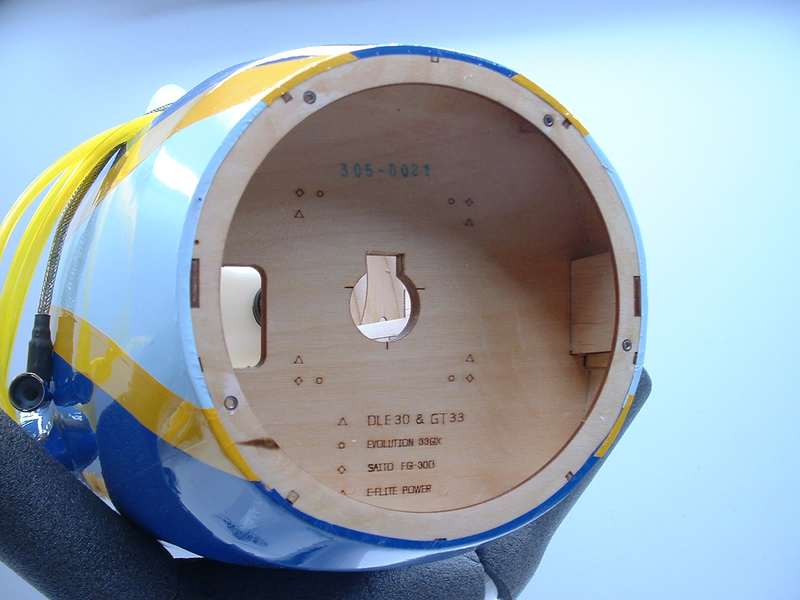 When the epoxy had cured, the strut was installed into its recessed mount, and fit with a nylon retaining strap. 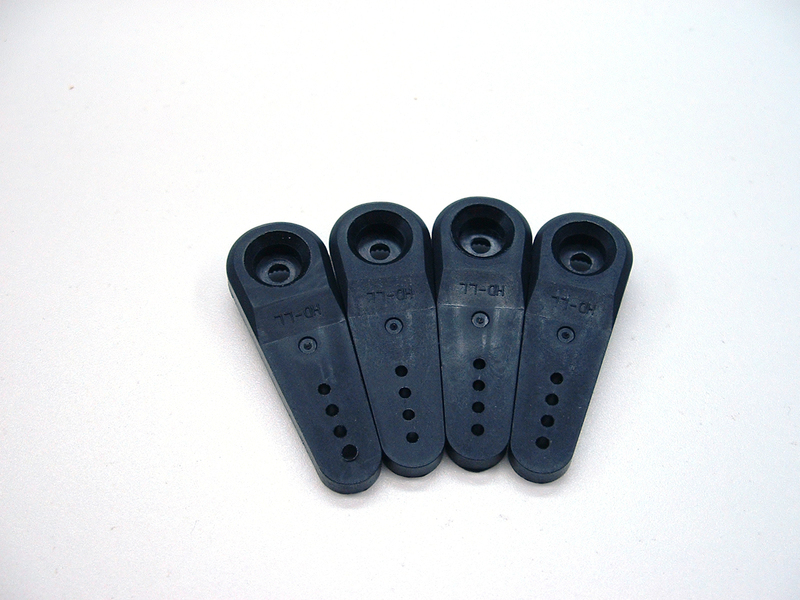 The nylon strap screw holes were hardened with thin CA in the same manner as the flap hinge screw holes. Though not pictured, now is a great time to test fit the secondary strut wire and get its nylon strap ready for installation. 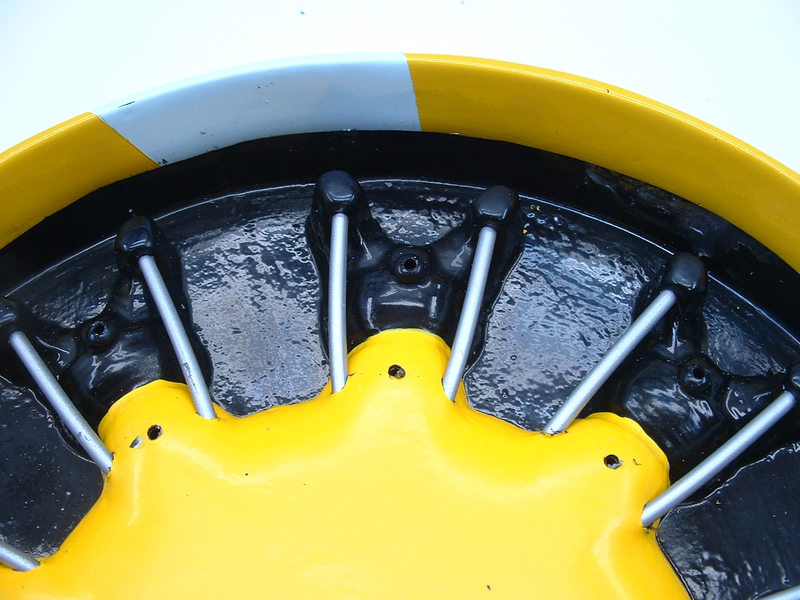 The large fiberglass wheel pant was turned 90° to the main strut, slid into place, and then rotated to its correct position. 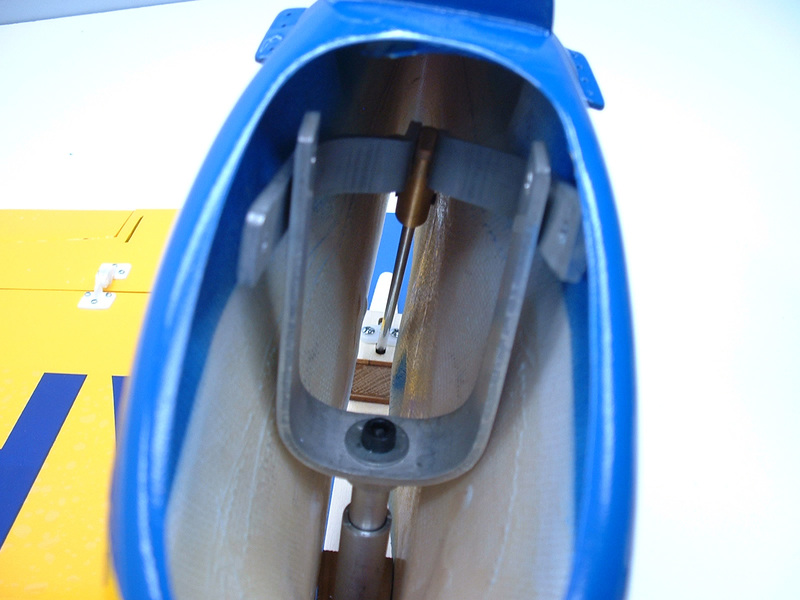 the secondary strut was then slid into the wheel pant, with the two-piece fork positioned outside of the main strut fork as shown in the first photo above. The secondary strut was then secured to the mounting block. 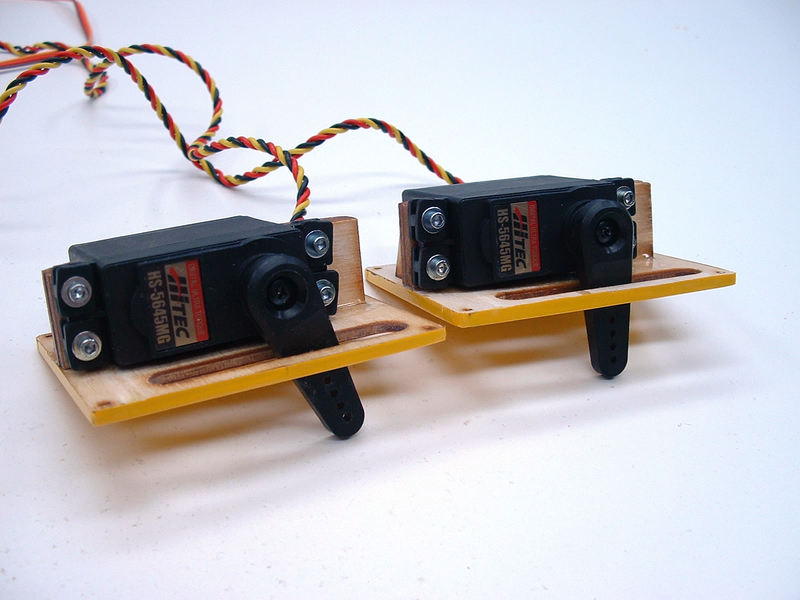 The wheel pant was then attached to the mounting block with four wood screws. Be very careful when the wood screws are installed, as the blocks consist of three pieces of wood. 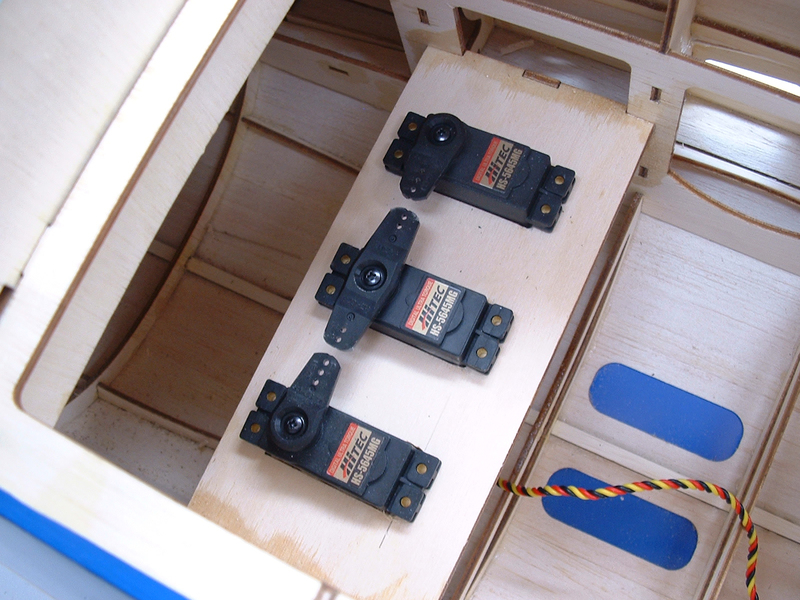 The screws can split the blocks if installed improperly, and will twist off if not properly installed into the hardwood center section of the block. 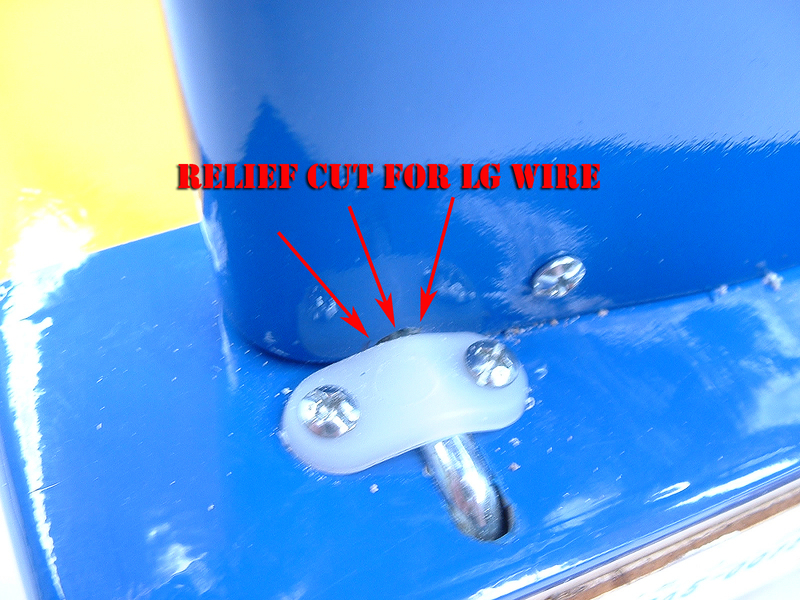 When seating the wheel pant to the wing and mounting block, a small relief cut must be made for the main strut wire. 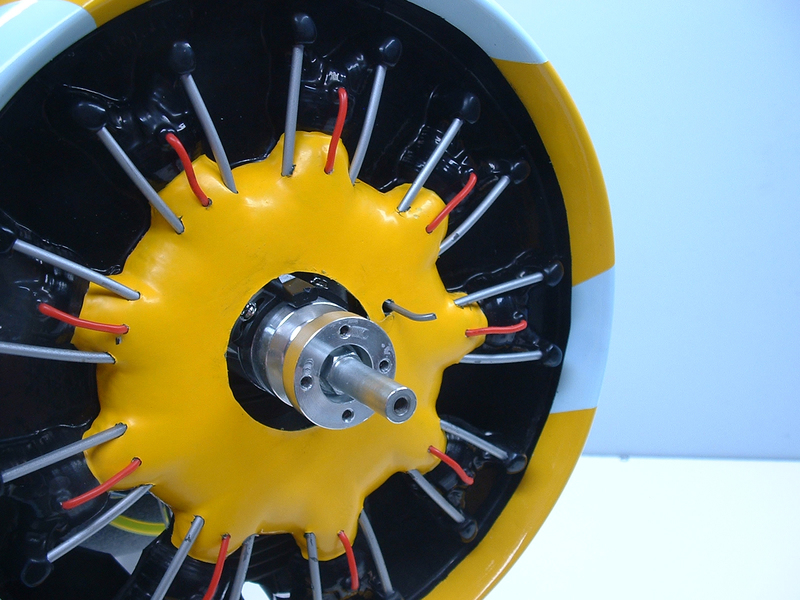 I had to accurately drill a hole in the wheel pant to allow wheel axle installation. This task can be a little stressful, so don’t be in a hurry and make an incorrect guess. The LG does have a slight amount of movement to it, so that helps with placement of the axle hole. 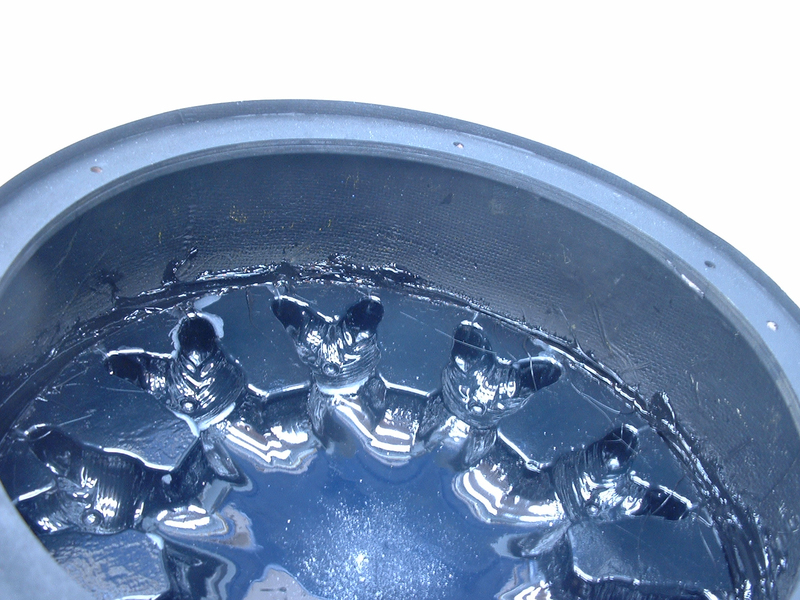 The axle was slid into place through the hole previously drilled, followed by a wheel collar, the 4-1/2″ wheel, another wheel collar. 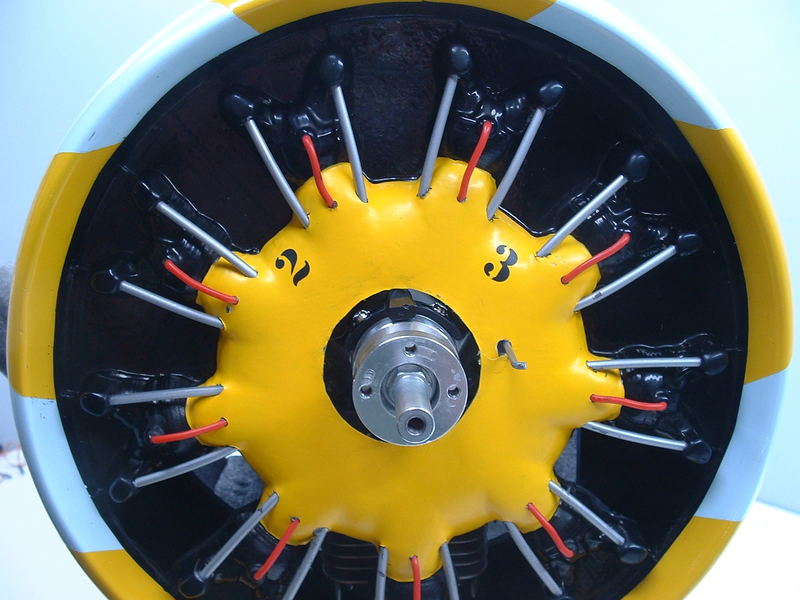 The axle then passes through the outer two parts of the LG forks, and a third wheel collar was installed to lock it all together as a single assembly. 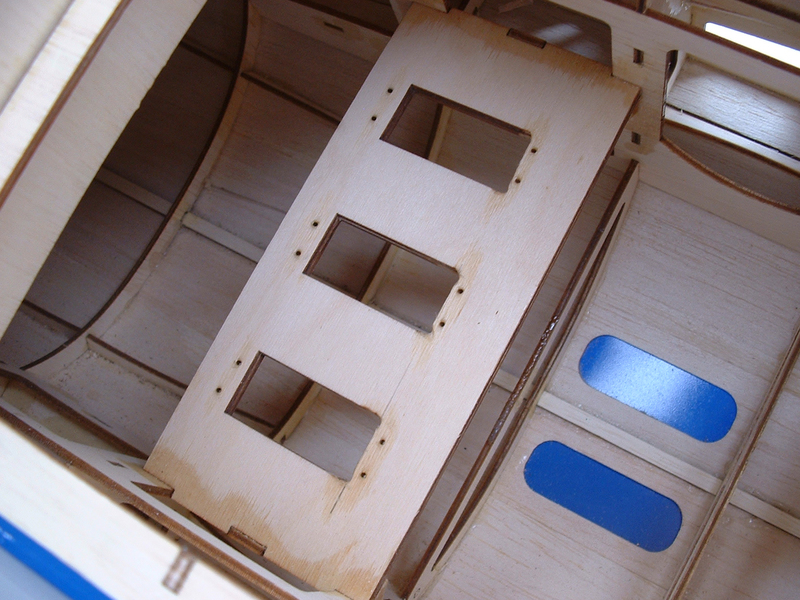 With that, the wings were set aside, and I moved on to the fuselage. 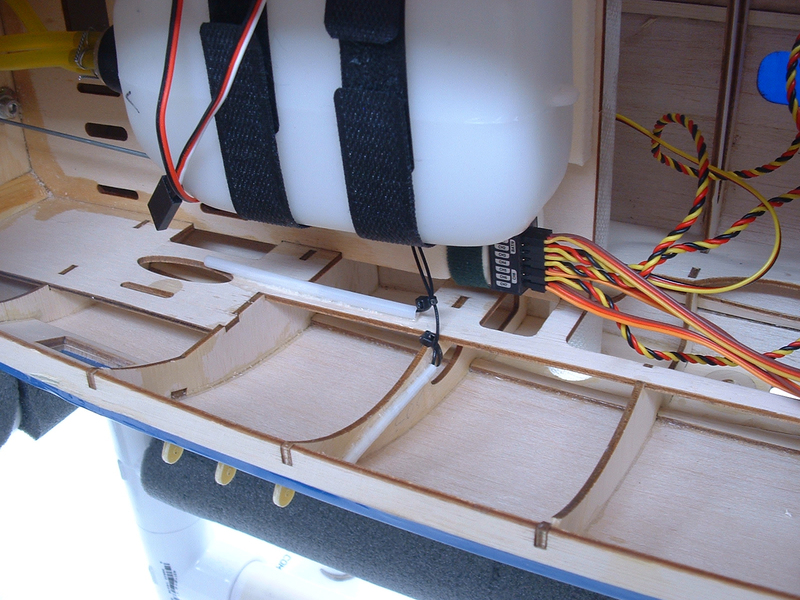 Assembling the fuselage began with installing servos. 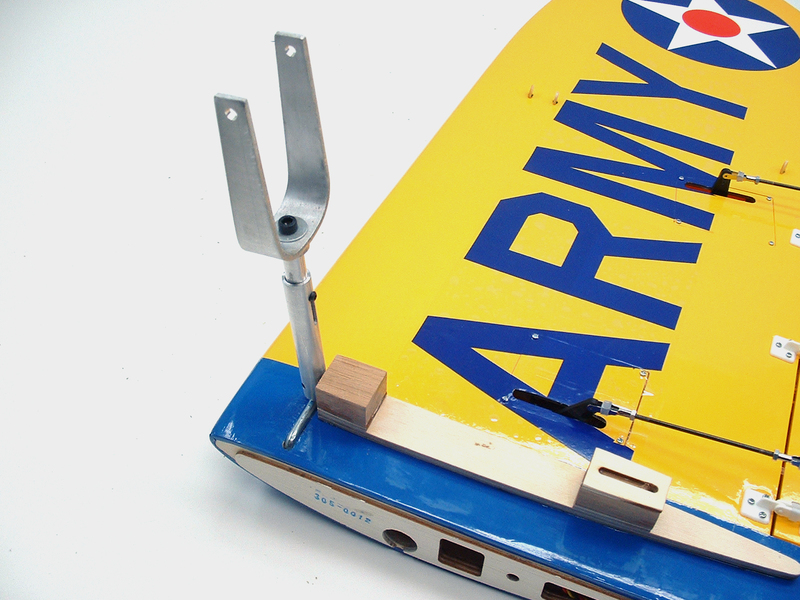 There are two elevator servos and a rudder servo mounted in the rear part of the tray – the openings were about 1/8″ too short for the Hitec HS-5645MG servos, so I had to open the servo mounts slightly. 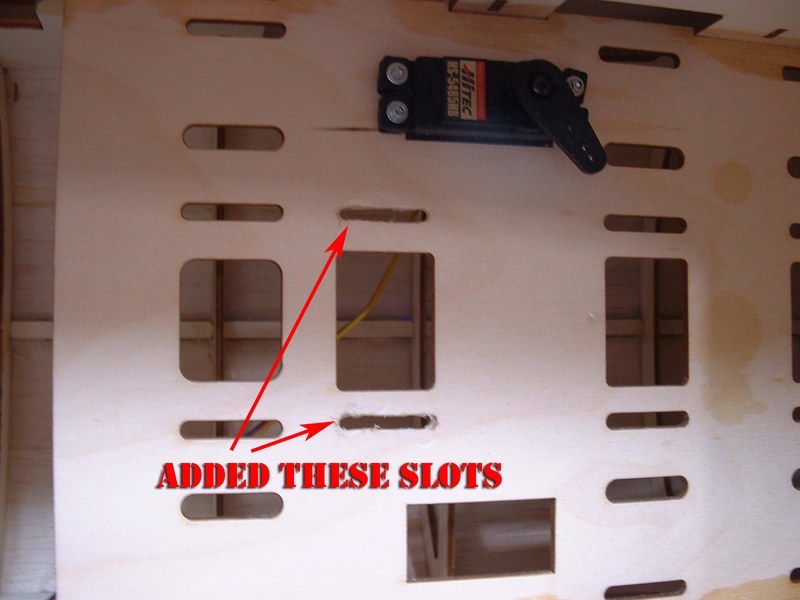 When the servos fit properly, I marked and drilled the screw locations. 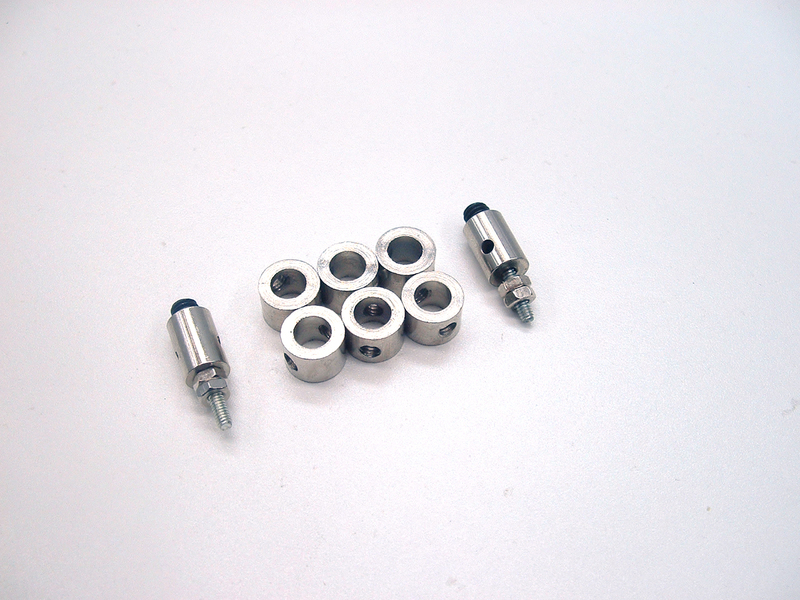 Like the flap hinge screws, I ran a screw into each hole and hardened the threaded holes with thin CA. 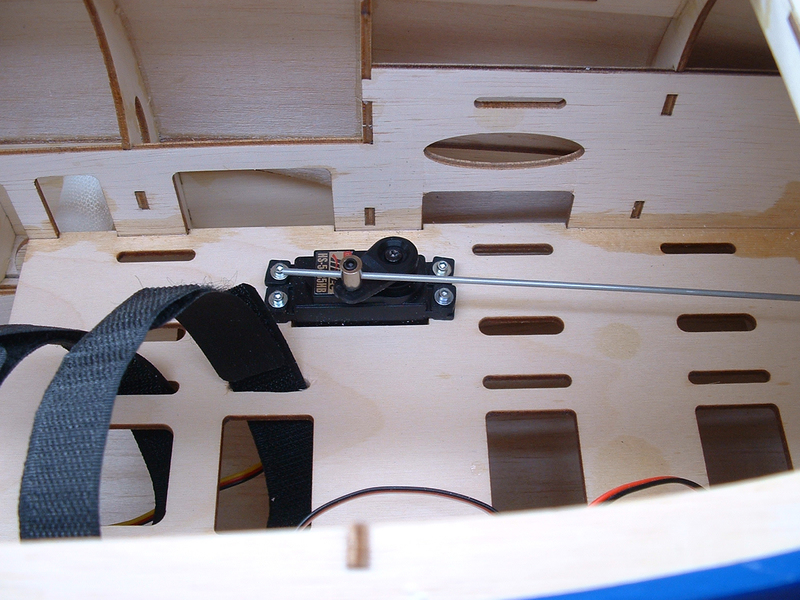 The servos were then mounted permanently to the tray, followed by the throttle servo in the front part of the tray. 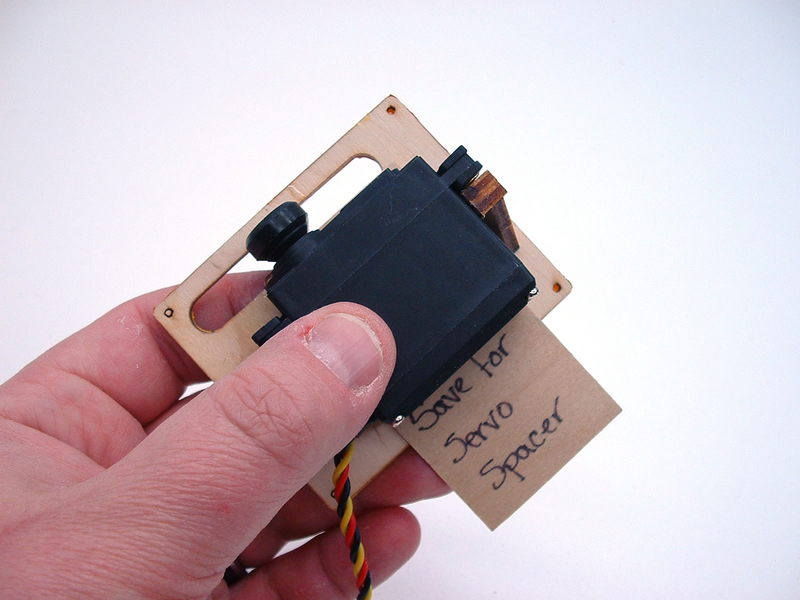 Ironically, the HS-5485HB servo fit without having to open the mount, so it was easy to install. 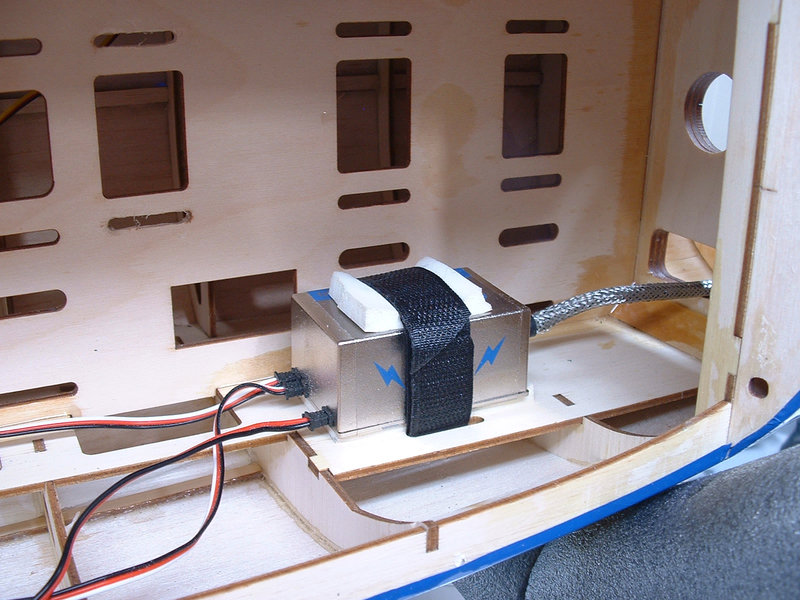 Now, there are two locations in which to mount the throttle servo, so a little planning must be done prior to installing YOUR throttle servo. Because I knew which engine I would be installing, and which side of the carburetor the throttle arm was located, I was able to install the throttle servo on the left side of the tray. 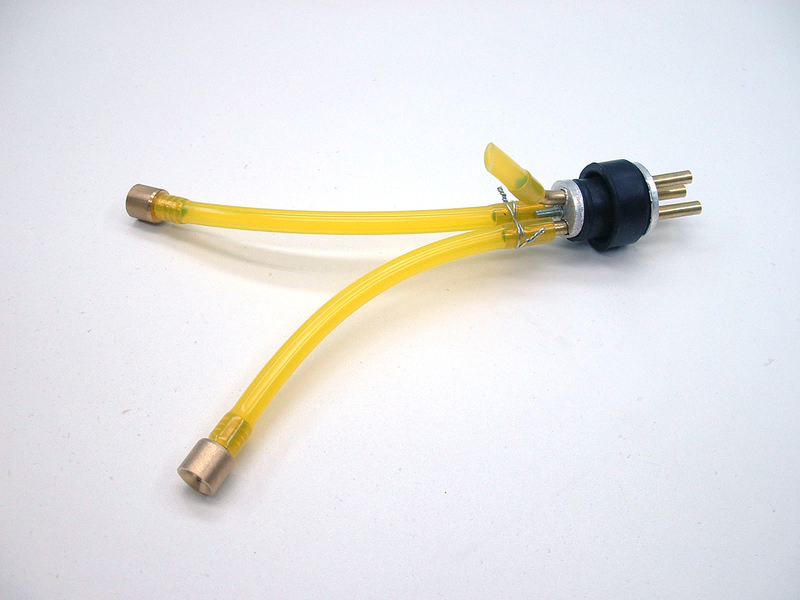 Depending on the engine you plan to install, this might be different, so plan accordingly! 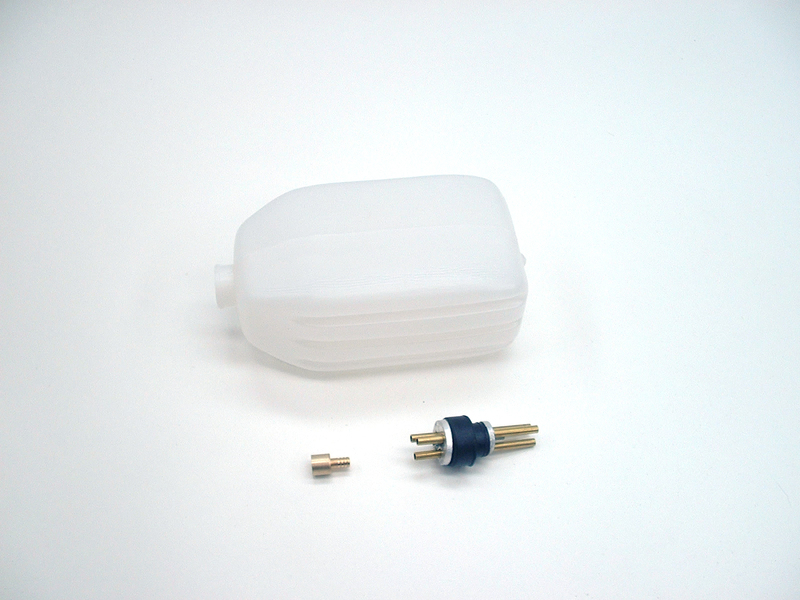 ***Editor’s Note*** For years now, I have used DuBro Socket Head Servo Mounting Screws to install my servos – I really like the socket head on these screws, and find them to be the best screw for the job! 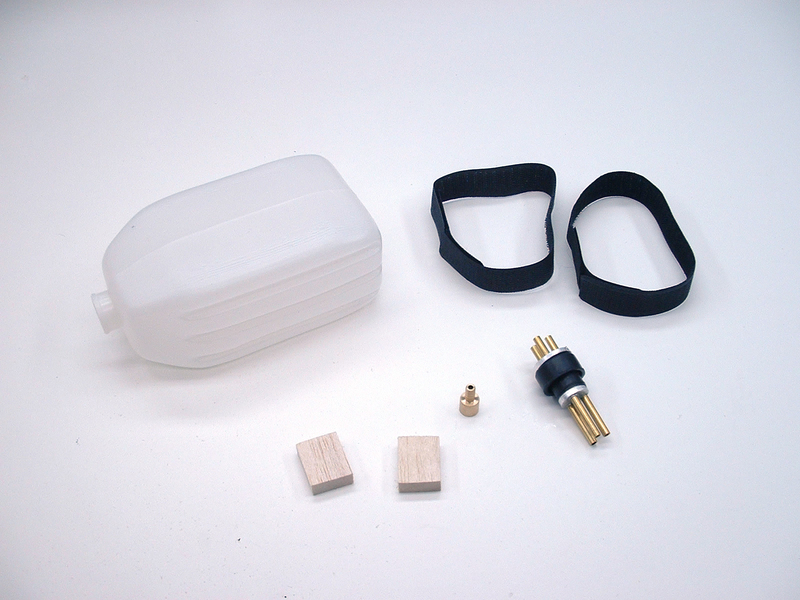 Because I’m using a gas engine, I needed to assemble the fuel tank. 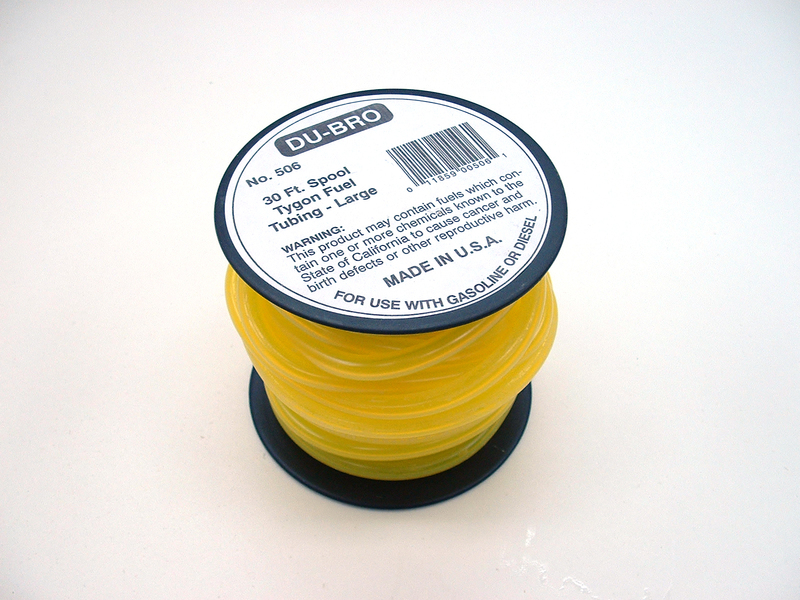 There is no fuel tubing supplied with the tank, so I grabbed my roll of DuBro Large Tygon fuel tubing. 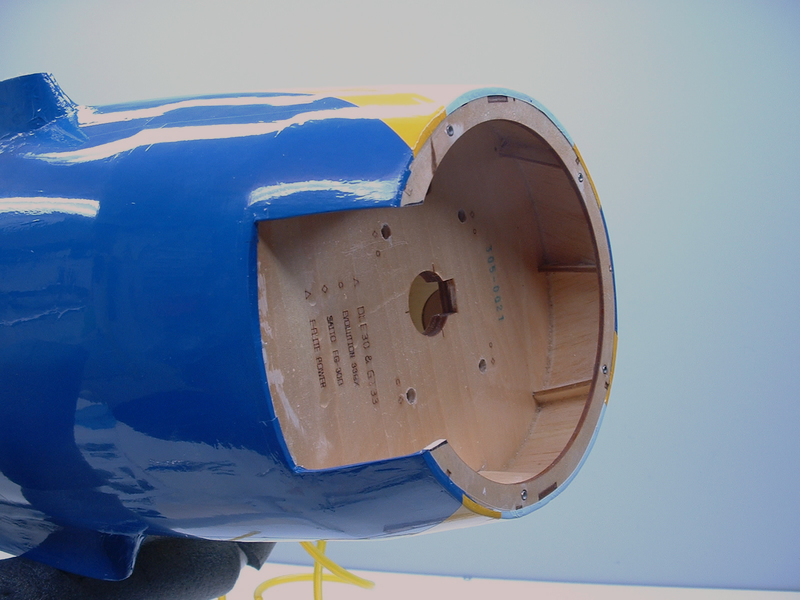 The vent line was bent upward so it will face the top of the tank when installed. 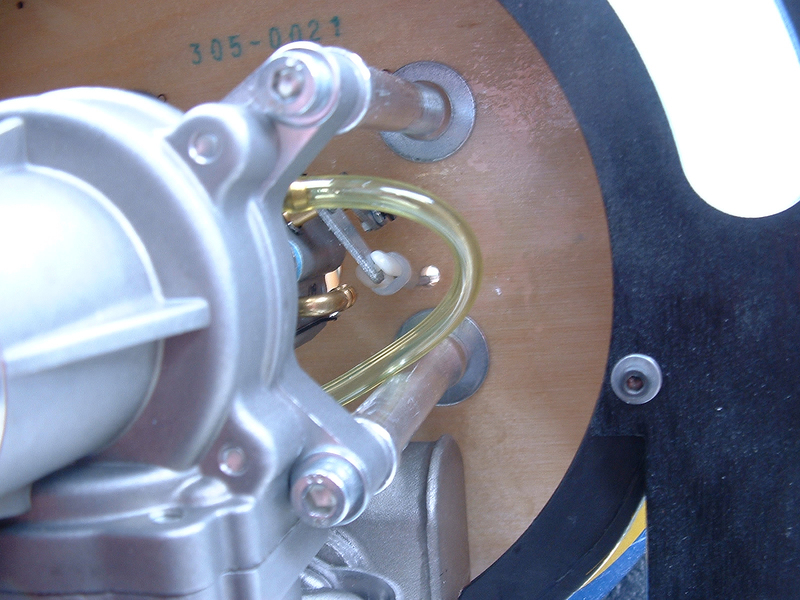 The three pieces of Tygon fuel were cut to the proper length and installed on the brass fuel fittings and safety wired to prevent them from falling off in the tank. I installed the stopper in the tank with the vent line pointing up, and tightened the stopper screw to keep the stopper in the tank. 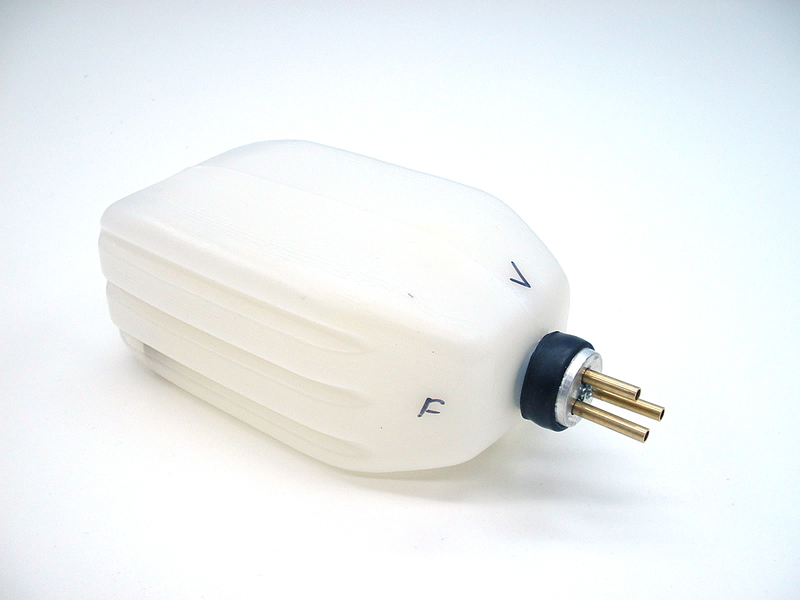 I marked the tank with an ‘F’ (Fill), ‘V’ (Vent), and ‘C’ (Carburetor) to help identify the fuel lines later. 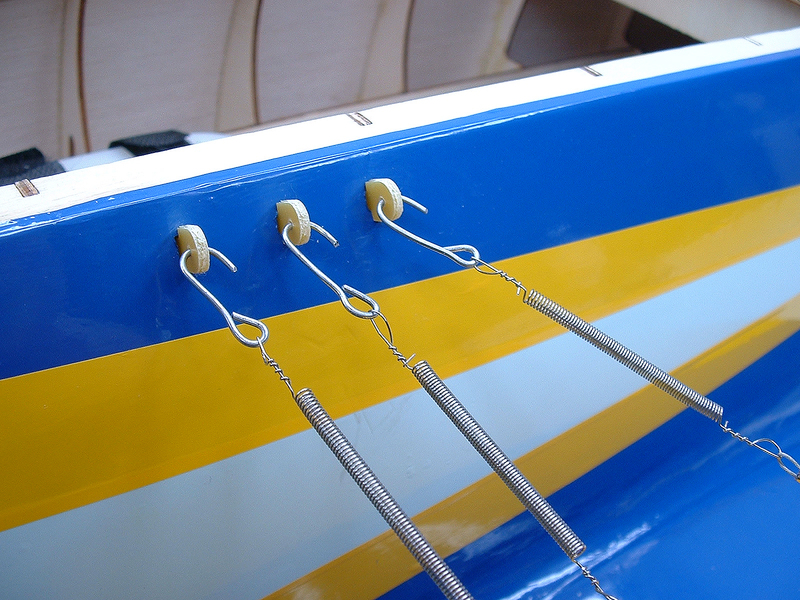 Three pieces of fuel line were installed on the brass fittings, and safety wired – with this, the tank was ready to be installed in the fuselage. Speaking of installing the tank, I noticed that there were two slots in the instructions that were not in the tray in my P-26. Using my Dremel tool and a cutting bit, I added these two slots. 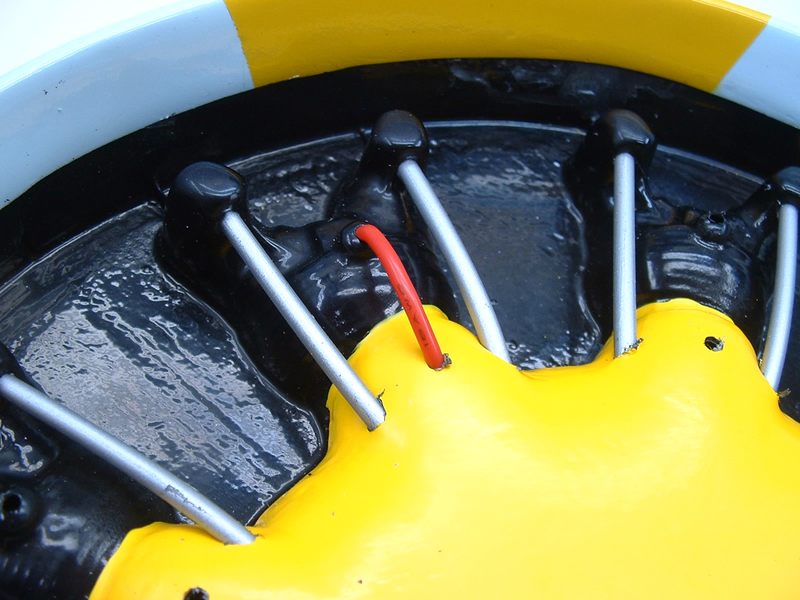 The RCGF electronic ignition module was installed using some DuBro 1/4″ protective Foam Rubber and one of the included hook n loop straps. 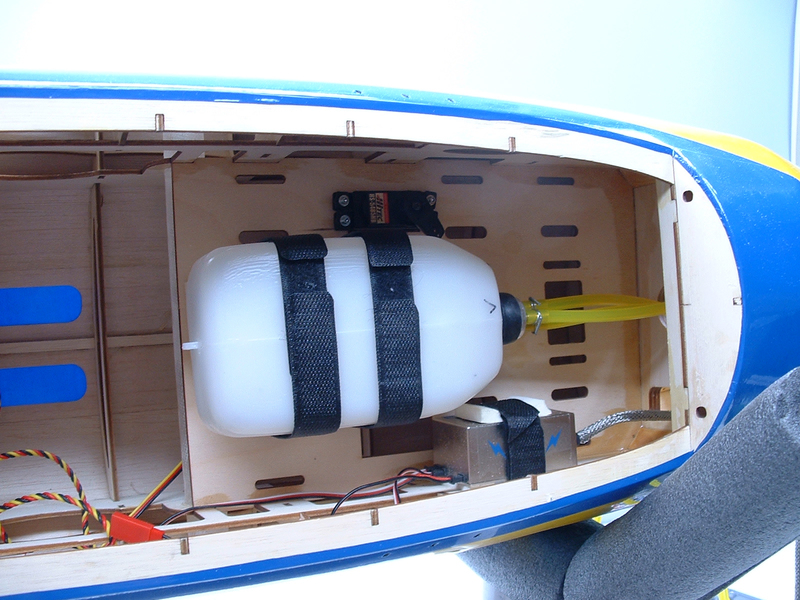 The fuel tank was then installed using two more of the included hook n loop straps and an additional piece of DuBro foam rubber under the tank. 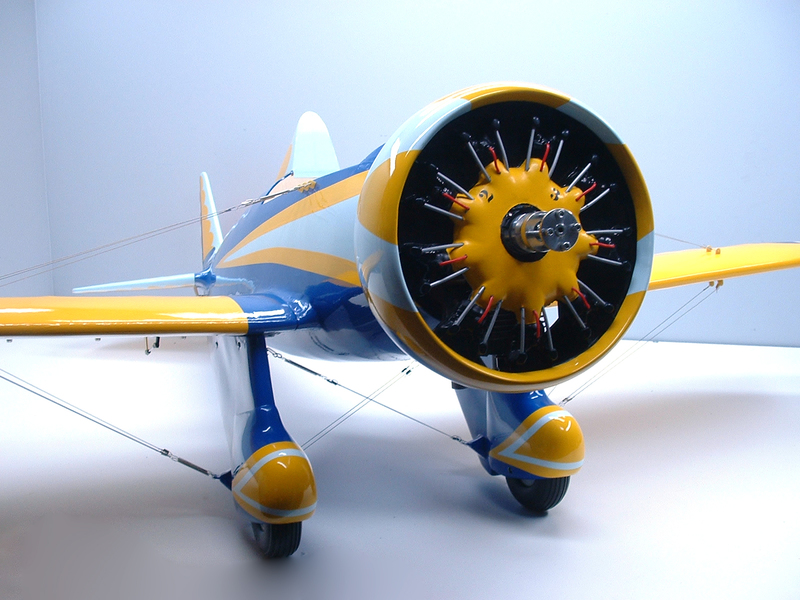 I will be installing the RCGF 35cc Rear Exhaust gas engine in my P-26. 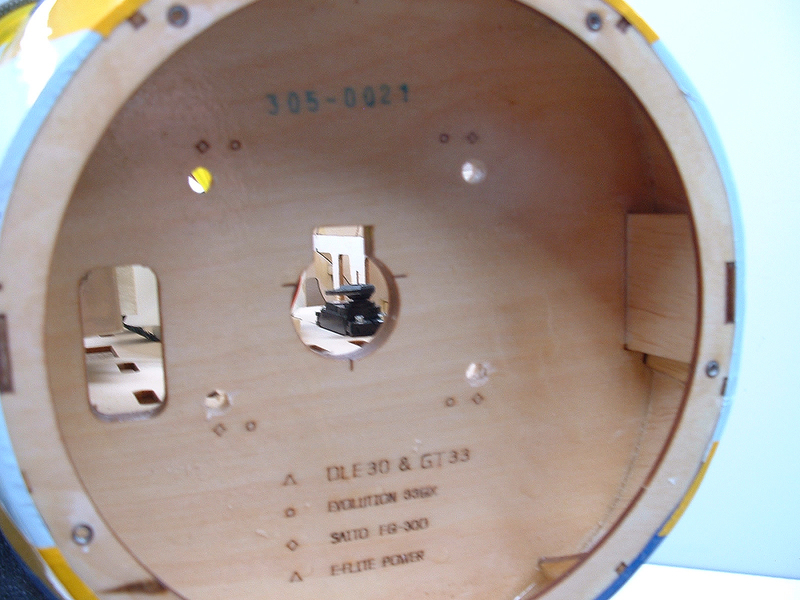 It has the same mounting pattern as the DLE 30, so the appropriate holes were drilled in the firewall. 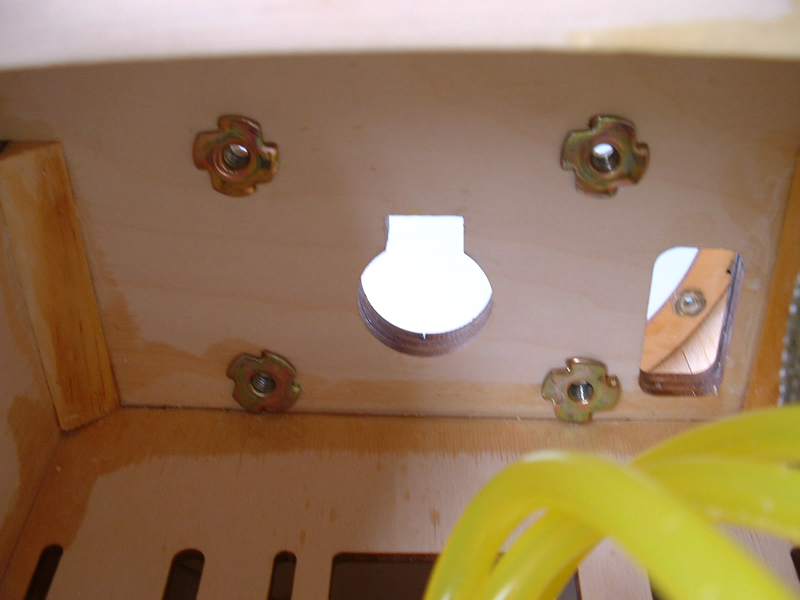 The blind nuts were then installed in the back side of the firewall. I really like that Seagull has pre-marked the firewall with mounting locations of several popular engine selections, which makes it easy to get the proper engine location! 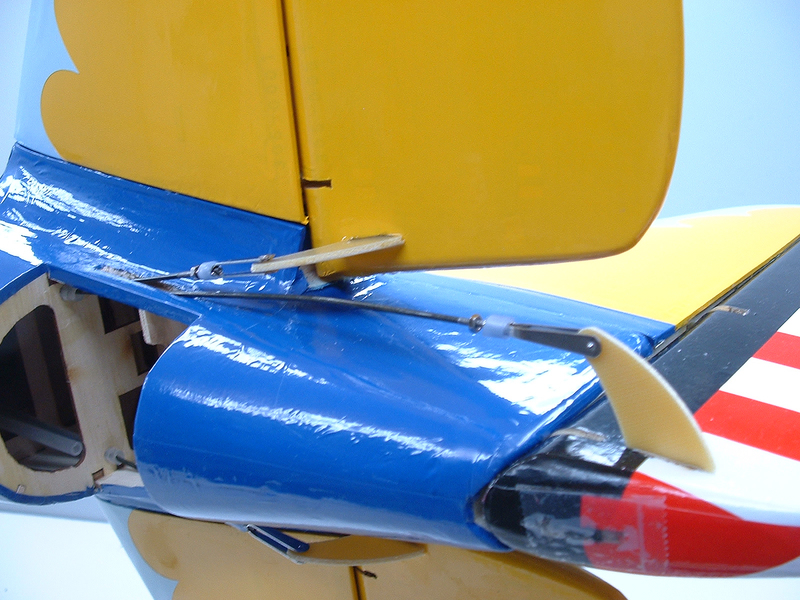 The RCGF 35RE was temporarily mounted to find the correct location to trim the lower section of the fuselage for muffler clearance. 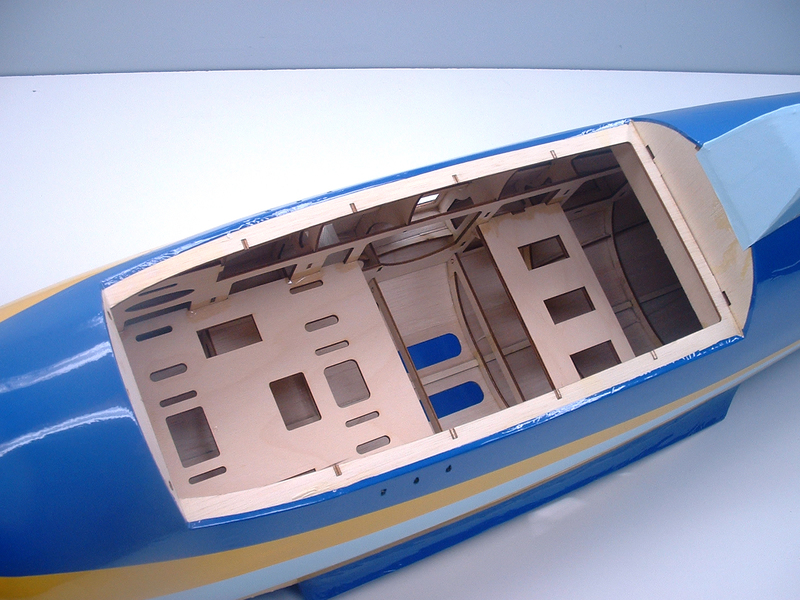 With the location found, I removed the engine and removed the lower section of the fuselage. 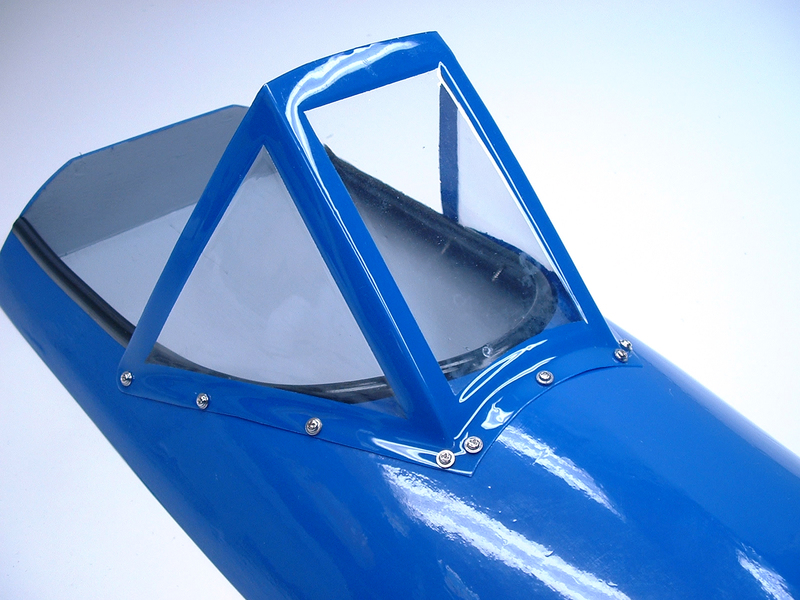 The covering was trimmed in such a way that it could be used to cover the cut edges, and the excess covering that was removed was used to completely cover the new opeing in the fuselage. After going over some measurements, I decided that I had to move the motor ahead approximately 10 mm from the stock location. 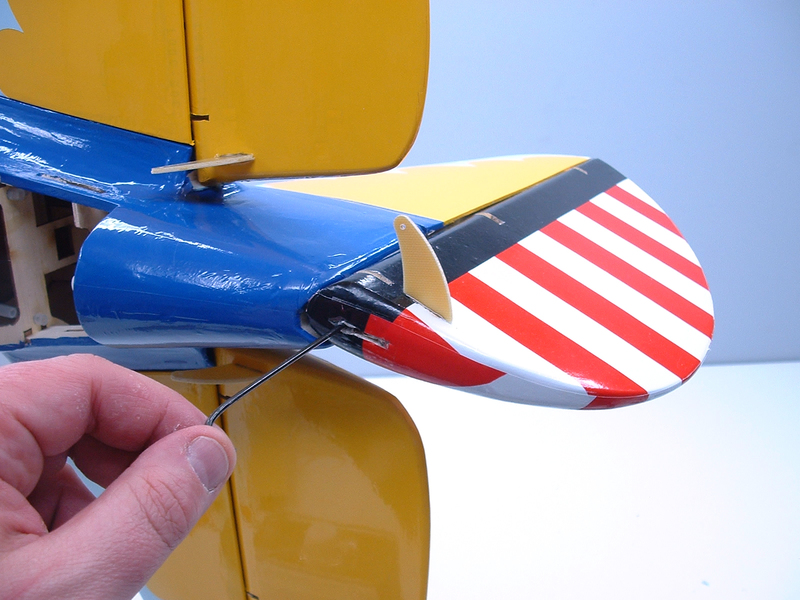 This gave me about 6 mm clearance between the muffler and the firewall, but it moved the propeller hub ahead. I installed the engine and temporarily held the cowl ring in place, and found that the spark plug cap would not quite fit within the cowl. 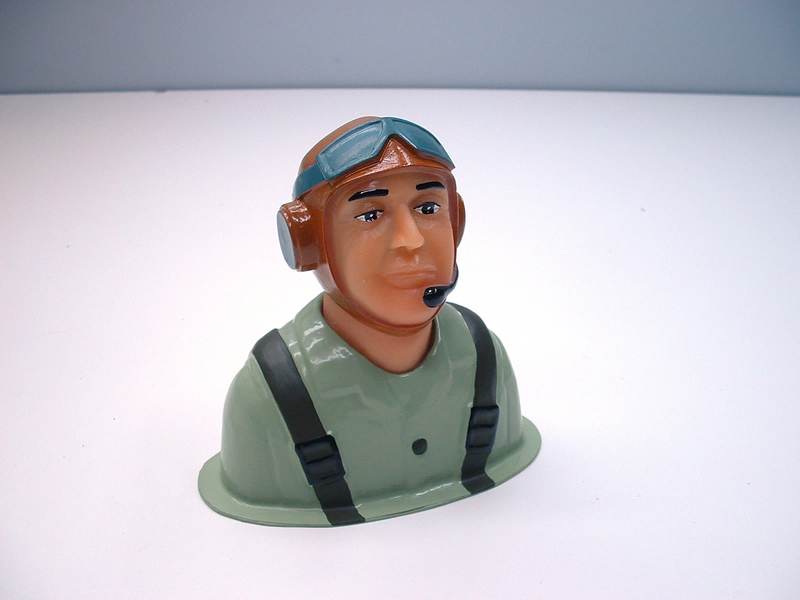 the cowl was trimmed to make room for the spark plug cap. 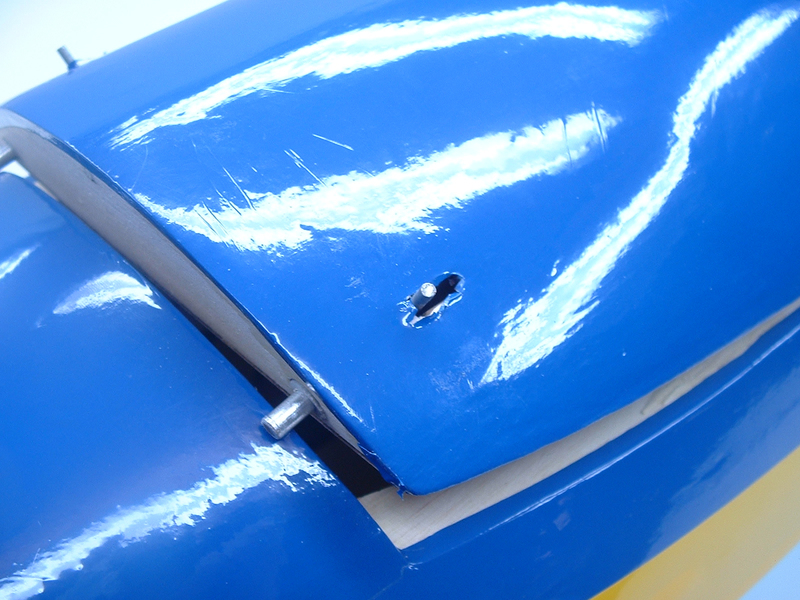 The throttle pushrod location was found, and a hole was drilled in the firewall. 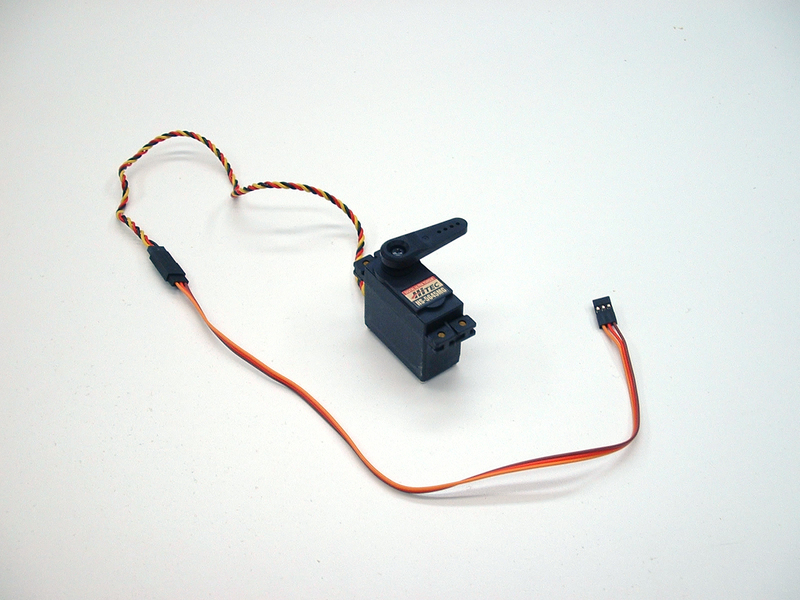 I assembled the pushrod connector on a servo arm and installed the pushrod and servo arm. 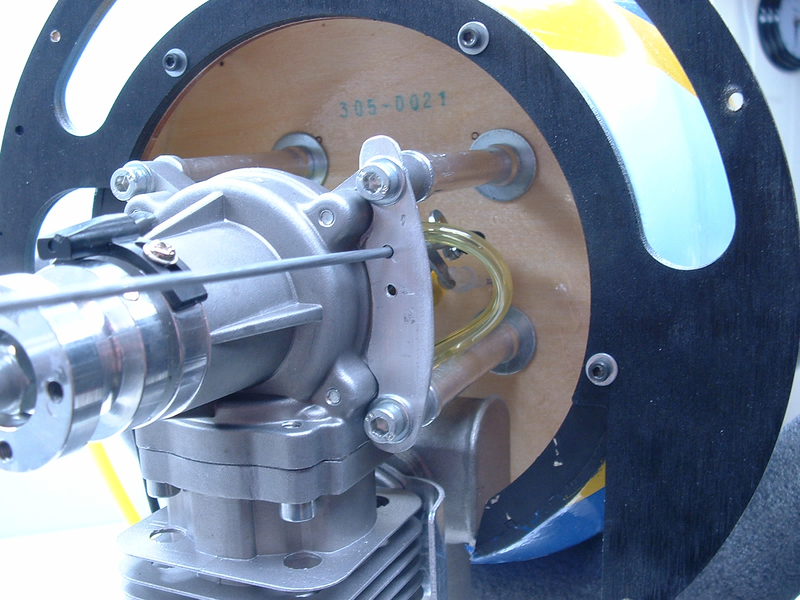 The servo and throttle were then adjusted to operate correctly together. 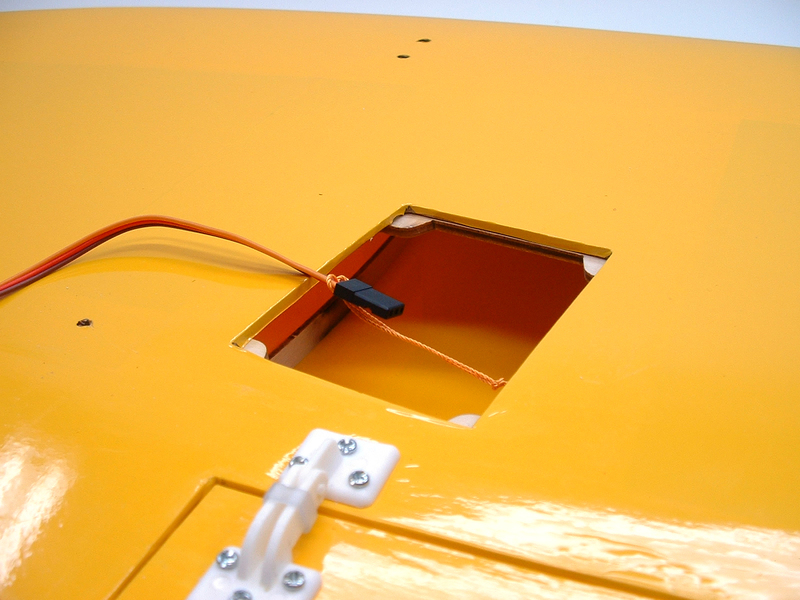 Note – the fuel tank was removed for easier access to the throttle servo and for taking clear photos. 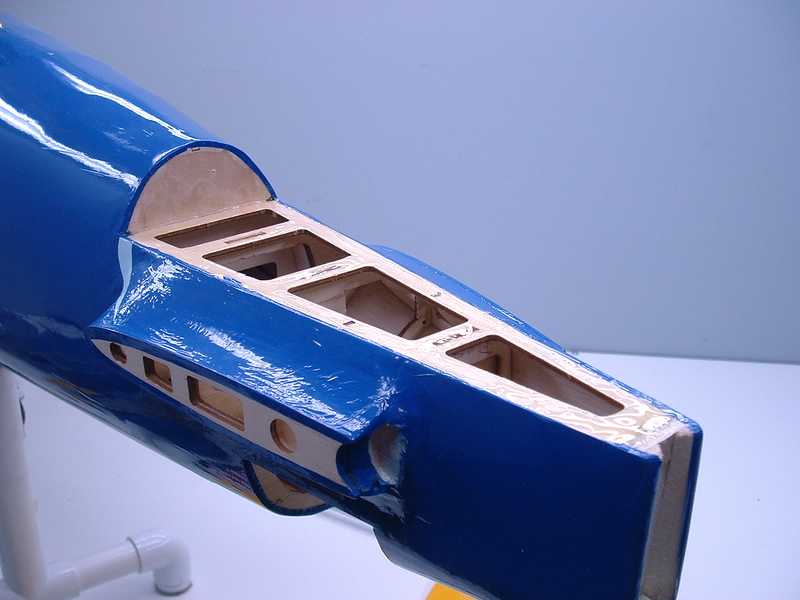 I also installed the cowl attachment ring to the front of the fuselage. From a small piece of 1/8″ scrap aluminum, I made a choke lever pushrod mount. 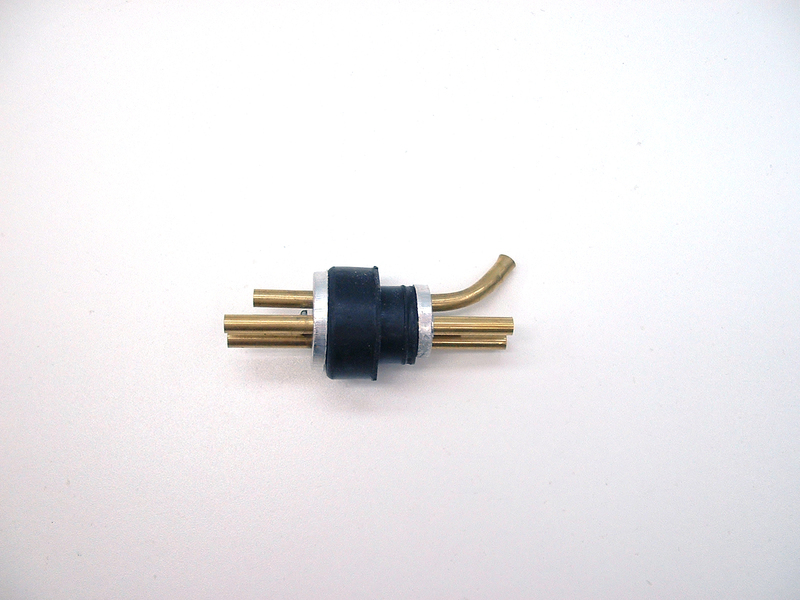 The 2-56 pushrod was attached to the choke arm on the carburetor with a DuBro 2-56 Threaded Ball Link. 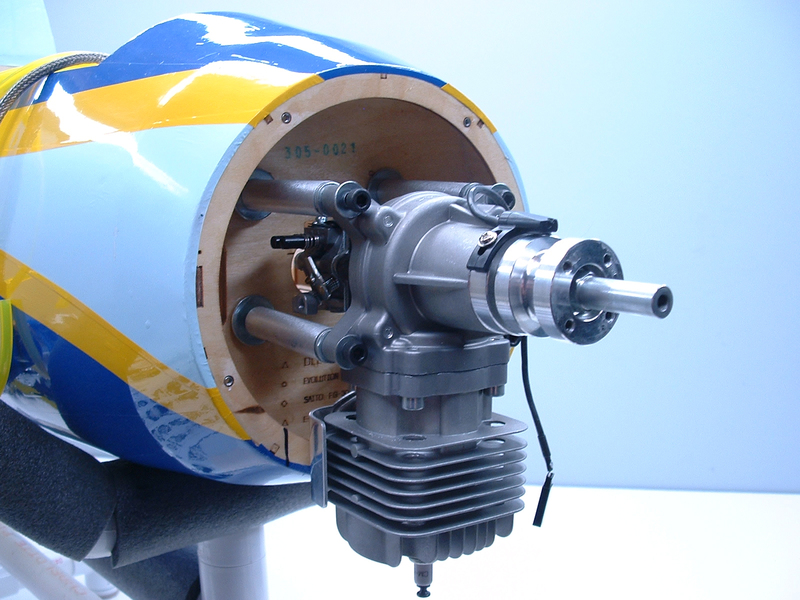 The lower hole was eventually used to set the choke pushrod at the correct level in the dummy radial engine – we’ll get to that soon! 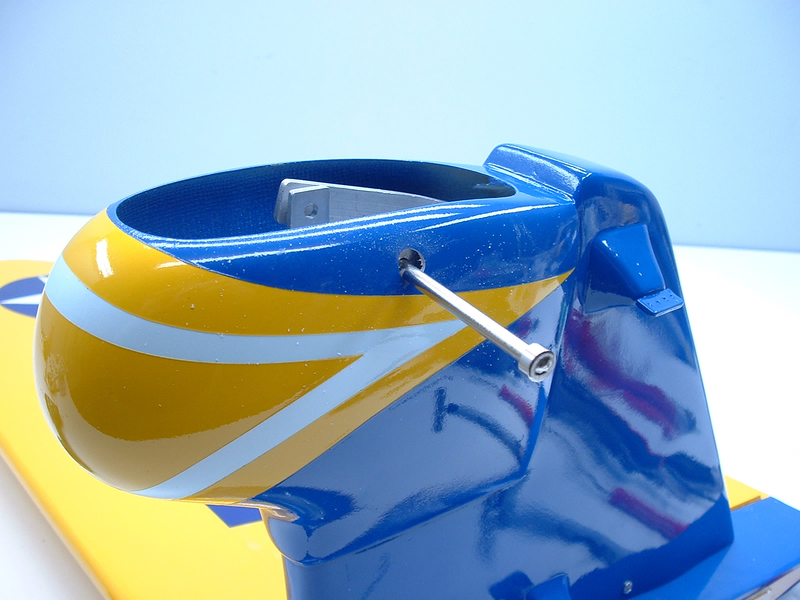 An aluminum fuel line plug left over from a different project was the perfect addition to the Peashooter – I simply drilled a hole in the cowl ring mount, slipped the fuel filler line through, and installed the plug. 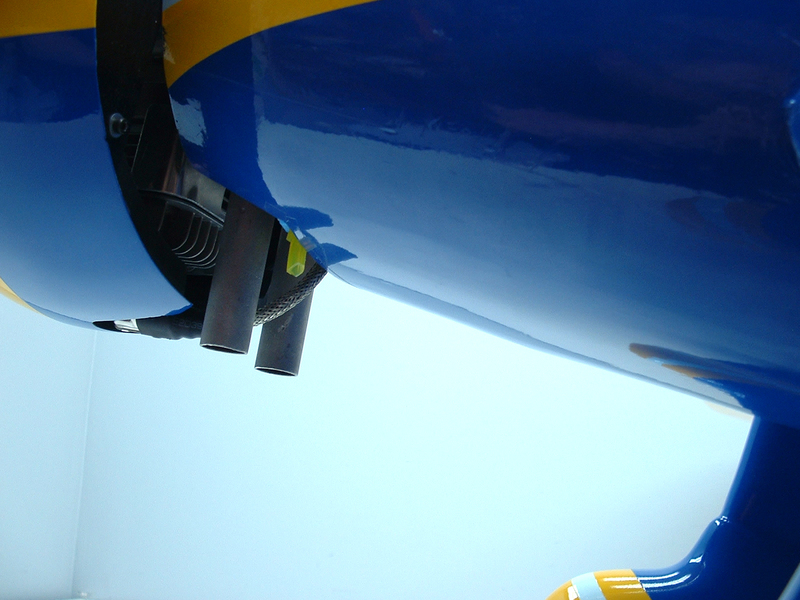 When it’s time to fuel or de-fuel the plane, I can simply pull the fuel line out about 4 inches and connect the line to my fuel filler pump. 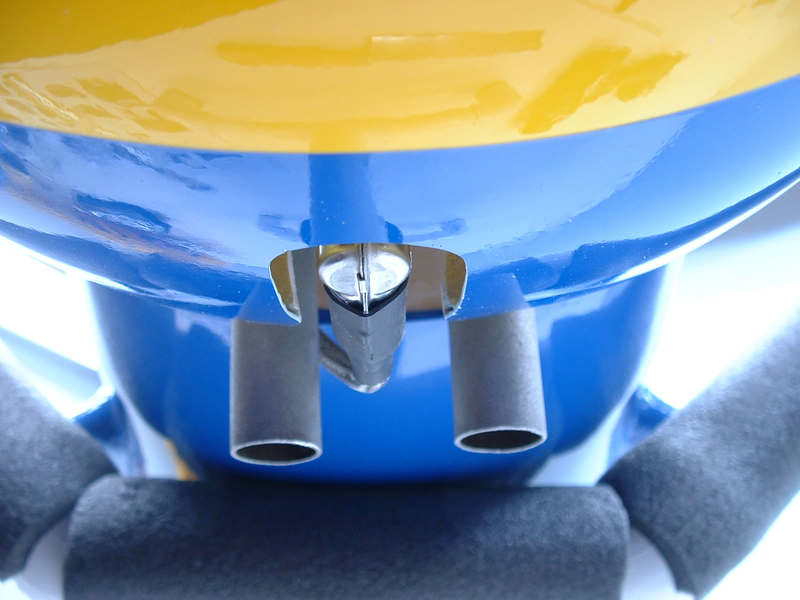 When I’m done, the fuel line pushes back into the hole and stays cleanly tucked inside the cowl. 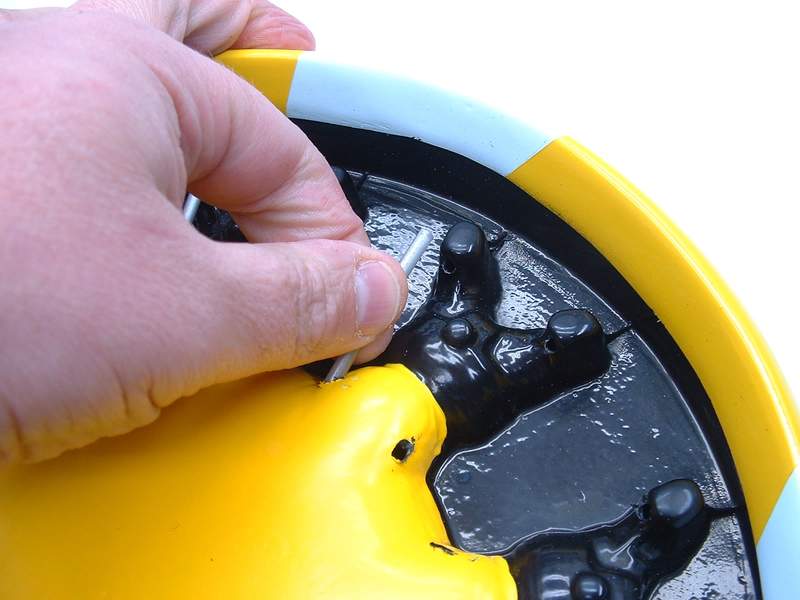 The instruction manual just says to use epoxy to glue the dummy radial engine inside the cowl. 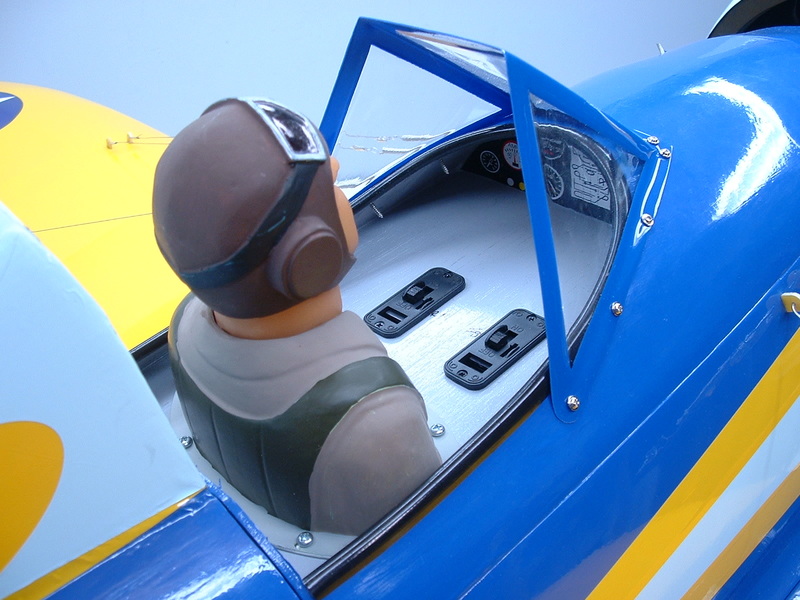 Because of the way the radial engine was formed, I didn’t feel that epoxy was an appropriate choice to secure the dummy radial to the cowl – there was a rather large gap to fill between the dummy engine and the cowl. After some research, I decided an RTV type product would be a better choice. I found a product called ‘Flex Shot’ at my local home improvement store, and this proved to be a great choice. 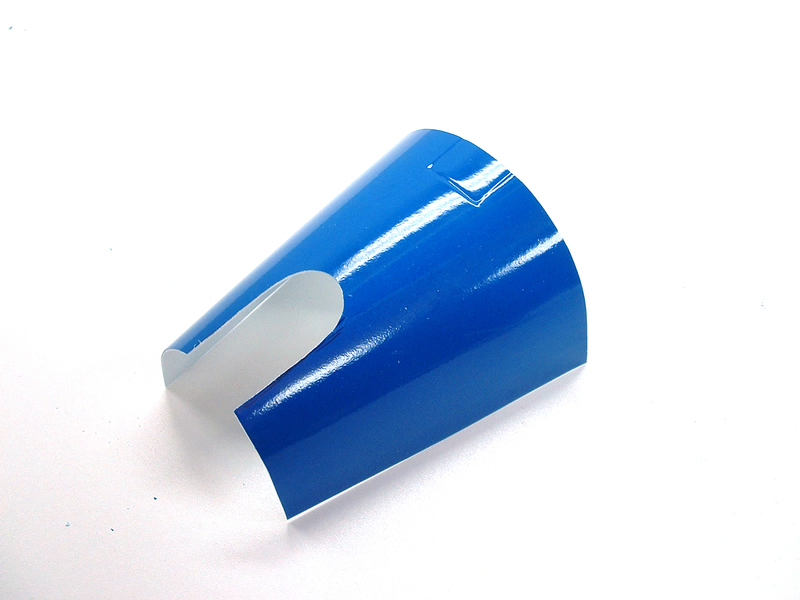 The pressurized tube made application easy, and the product stays slightly flexible which should reduce vibration to the plastic dummy engine. 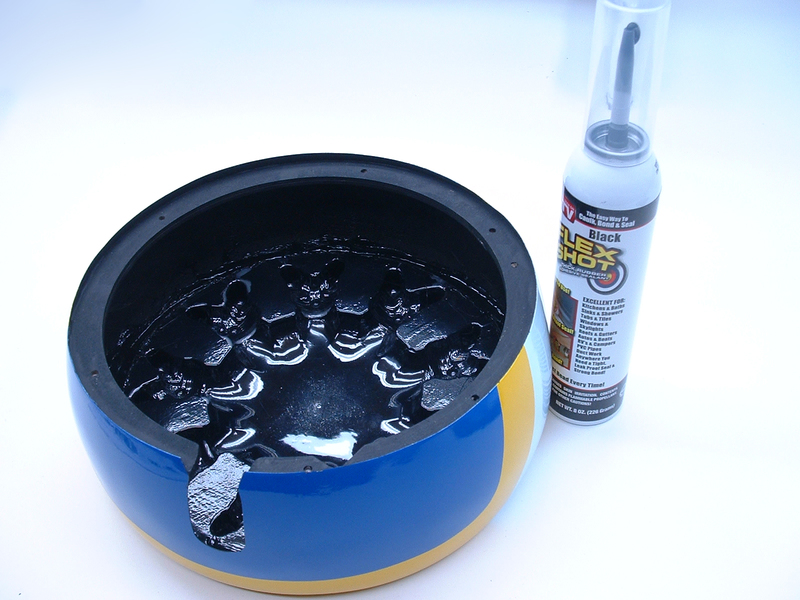 The only downside to this product is that it took about three days for it to completely cure, but that could’ve been due to the thickness of the application. 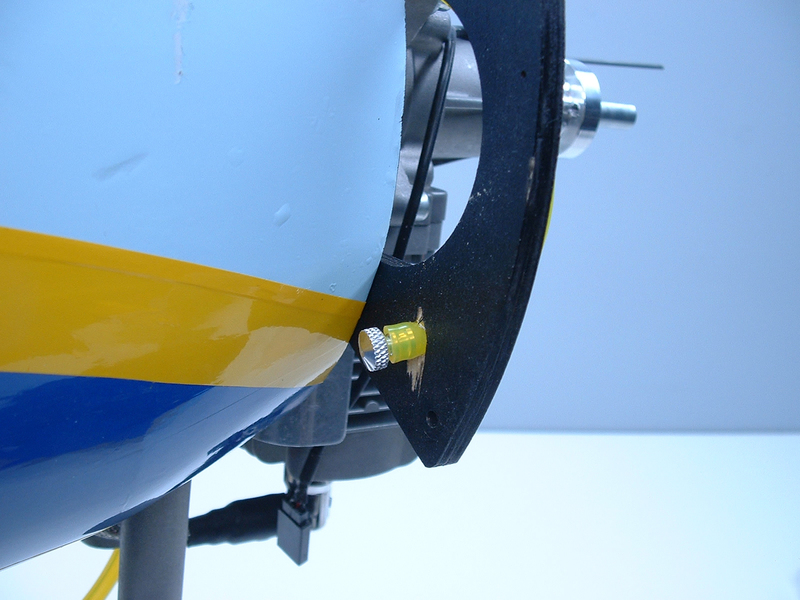 When the Flex Seal had completely cured, I drilled holes in the dummy radial and installed the faux pushrod guide tubes that were included with the ARF. According to the manual, there was supposed to also be ‘spark plug’ wires installed, so I drilled more holes and found a suitable piece of wire to use. 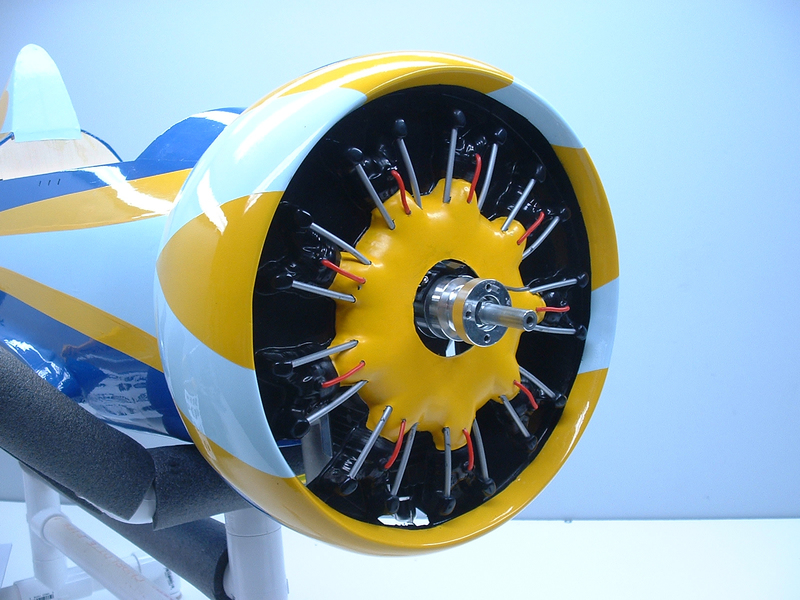 The wire was NOT included with the ARF, but I felt it was a necessary detail to such a large, open radial engine. 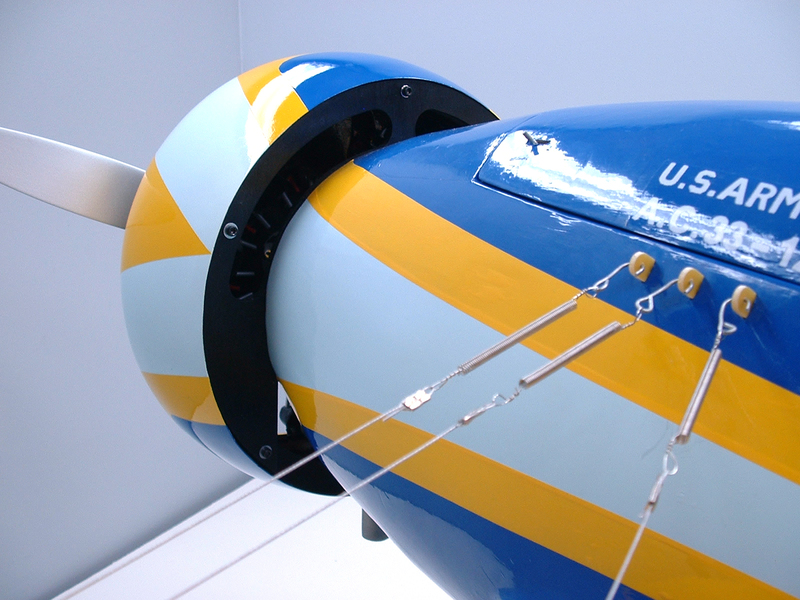 Both the spark plug wires and pushrod guide tubes were secured using ZAP thick CA and Zip Kicker on the inside of the dummy radial engine. 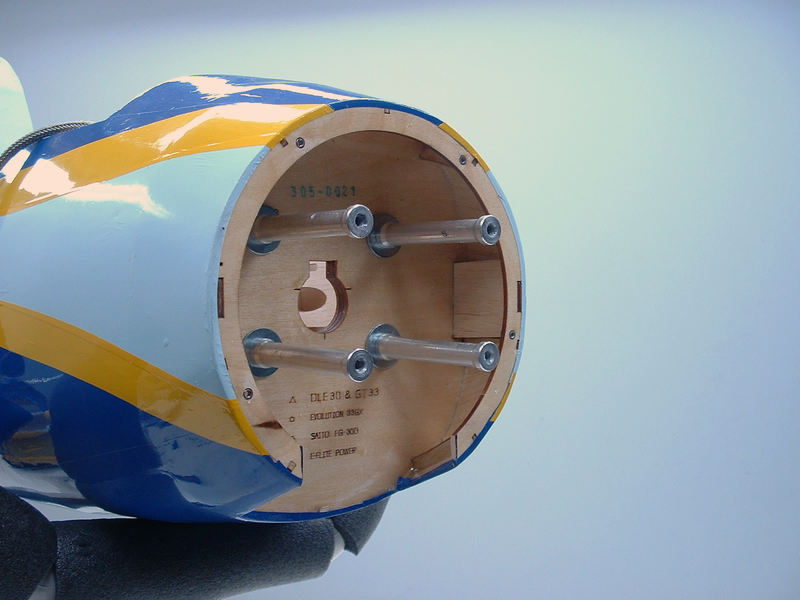 A large hole was cut in the middle of the dummy radial to pass the RCGF crankshaft and propeller hub through, and a second smaller hole was drilled for the choke pushrod. 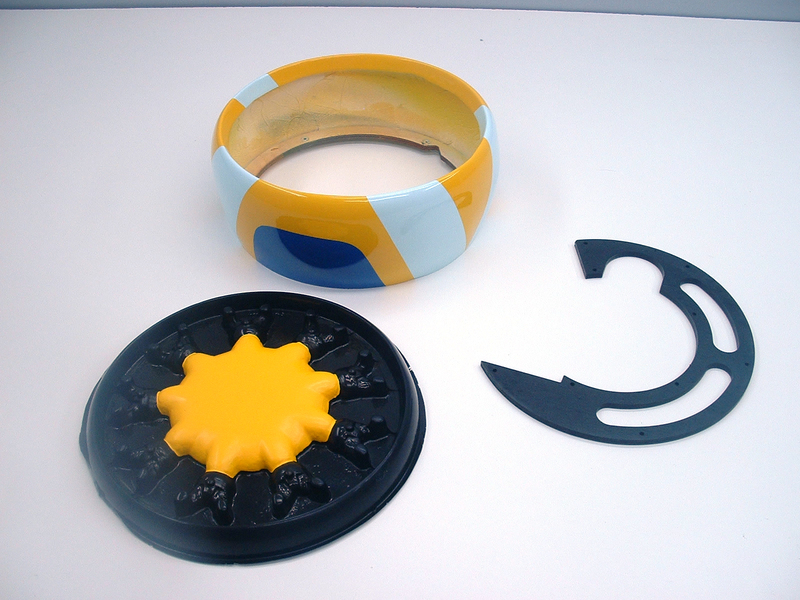 With the holes cut, the cowl was attached to the fuse via five machine screws and washers through the back side of the attachment ring. 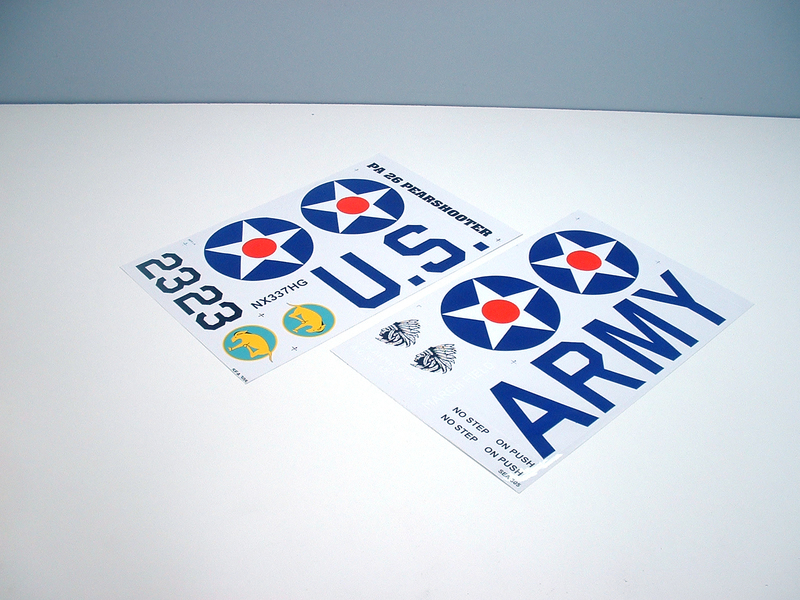 Unfortunately, the ’23’ decal for the engine were not included, so I cut my own on my vinyl cutter. The ‘stencil’ font I have is not a perfect match, but it looks better than if there were no decal at all. 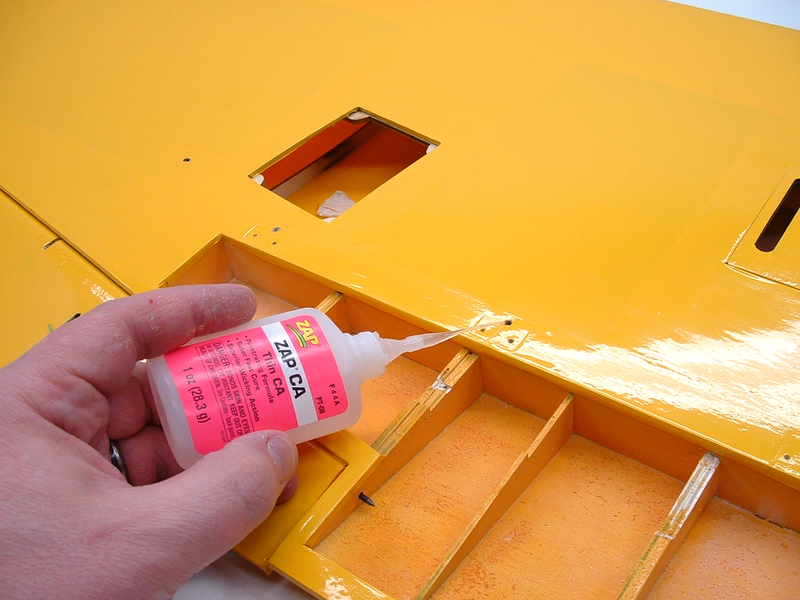 After checking the fit of the vertical stabilizer to the fuselage, it was epoxied in place using Zap 30-minute epoxy. 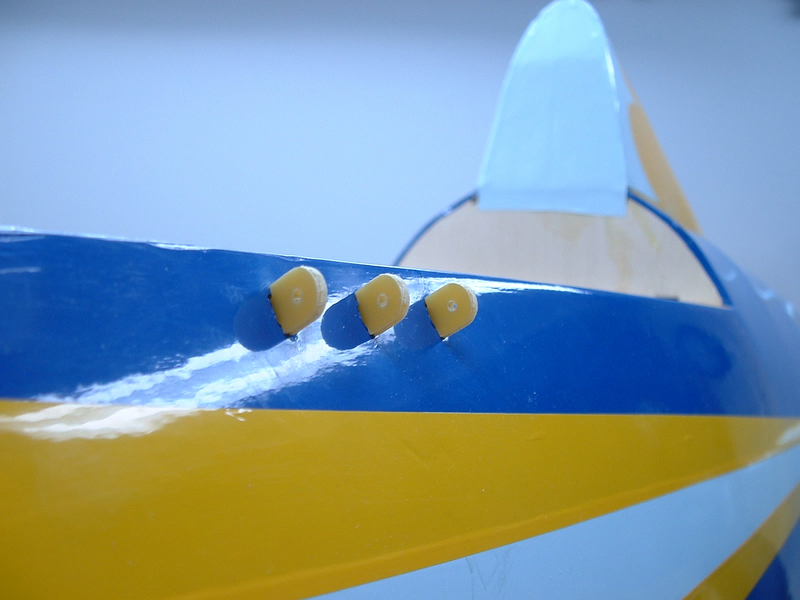 A couple of pieces of blue masking tape held the fin in place while the epoxy cured. I had to remove a little material from the root section of the horizontal stabilizer mounts to allow free movement of the elevator halves. 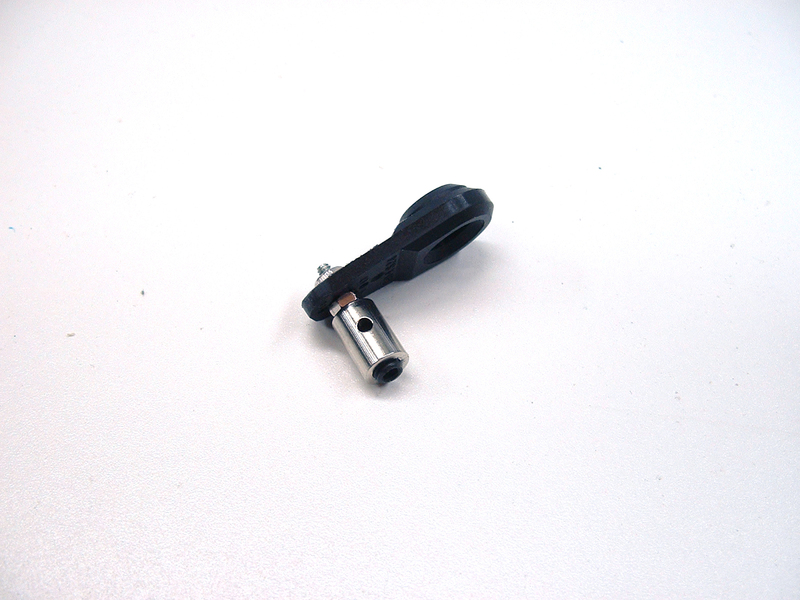 A Dremel tool with a 90° attachment and a carbide cutting bit made it easy to get into the recessed areas to work! 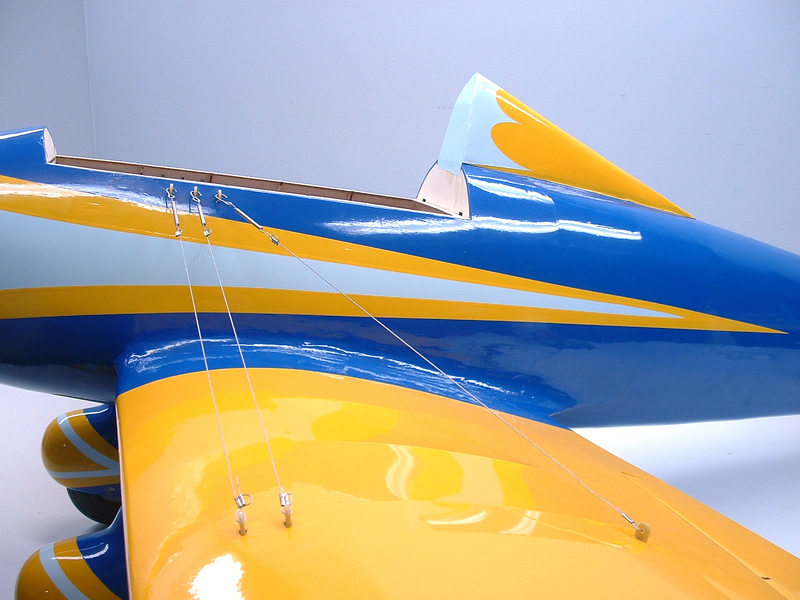 When I was happy with the fit and movement of the elevator halves, the horizontal stabilizers and aluminum joiner tube were epoxied in placeZap 30-minute epoxy. 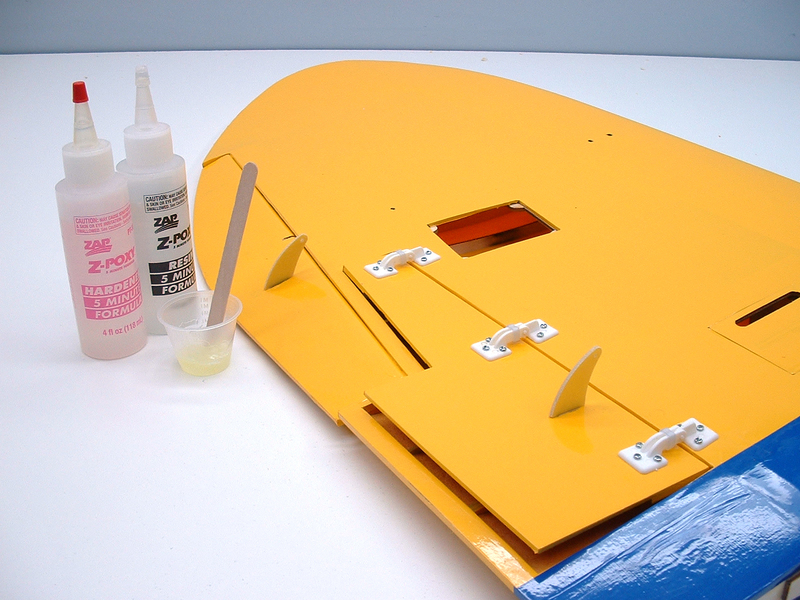 The elevator and rudder control horns were attached using Zap 5-minute epoxy. 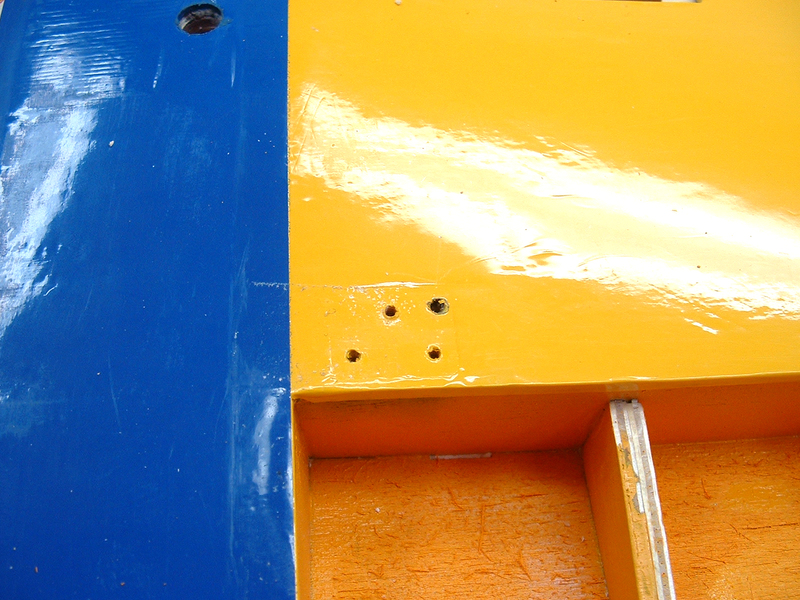 When the epoxy had cured, the rudder was aligned with the fin, and the steel hinge pin was slid into place. 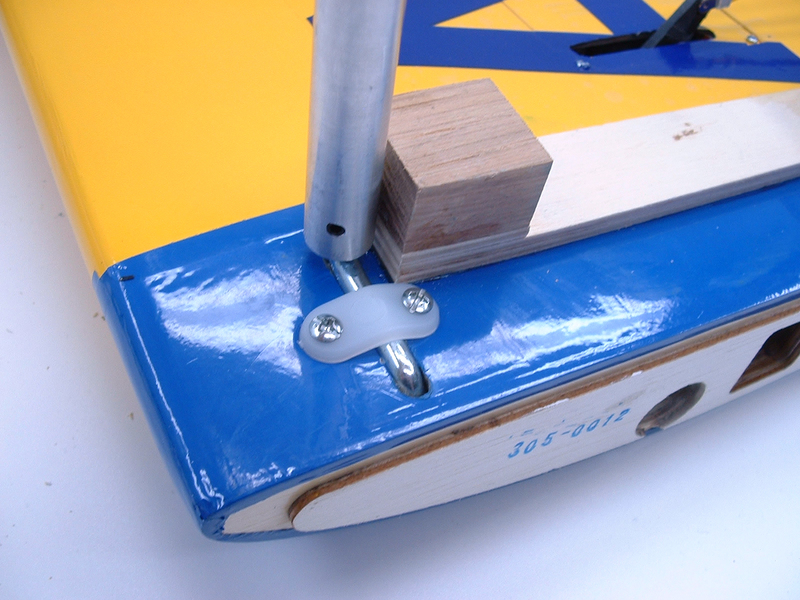 In addition to a piece of clear tape, I applied a couple drops of Zap 5-minute epoxy to the hinge pin to keep it secure. 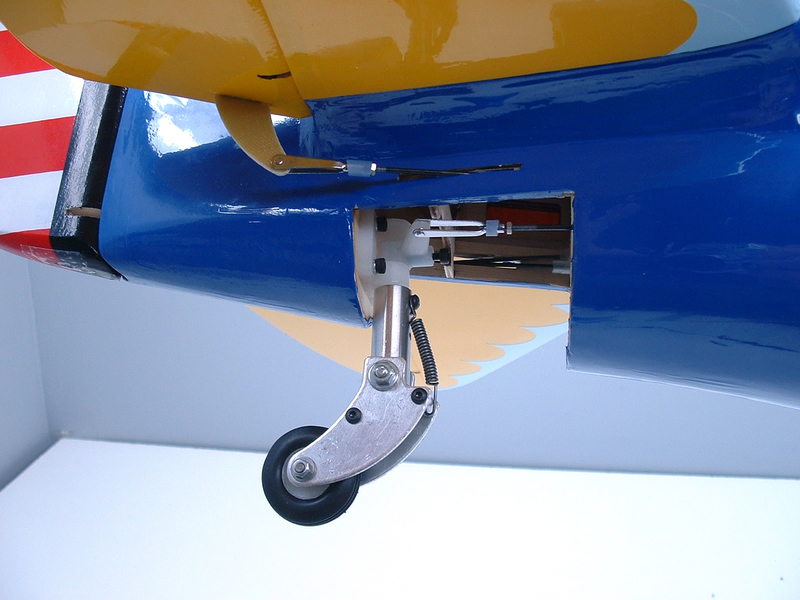 Followed by installing the tail wheel bracket and control horn. 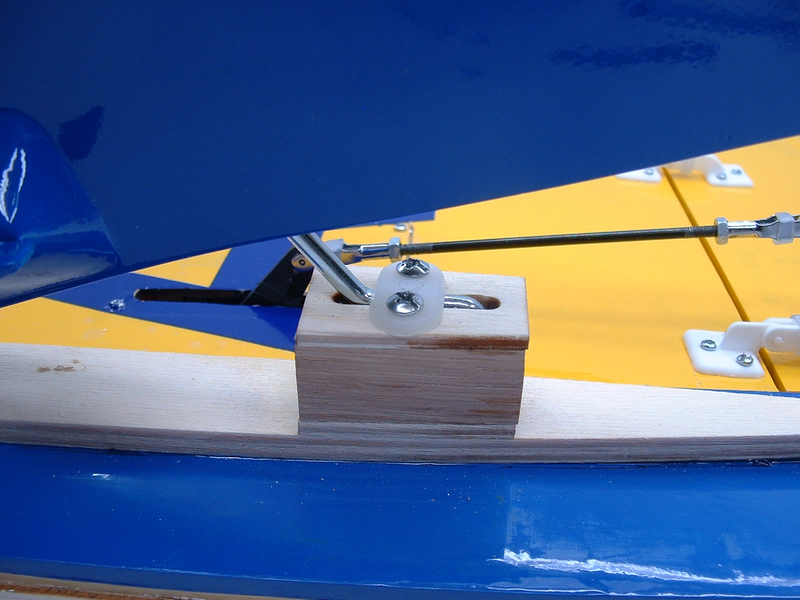 I realized at this moment that the tail wheel and rudder pushrods were too long for the servo configuration I had previously set up, so the rudder servo was turned so that the servo arm was toward the nose of the Peashooter. 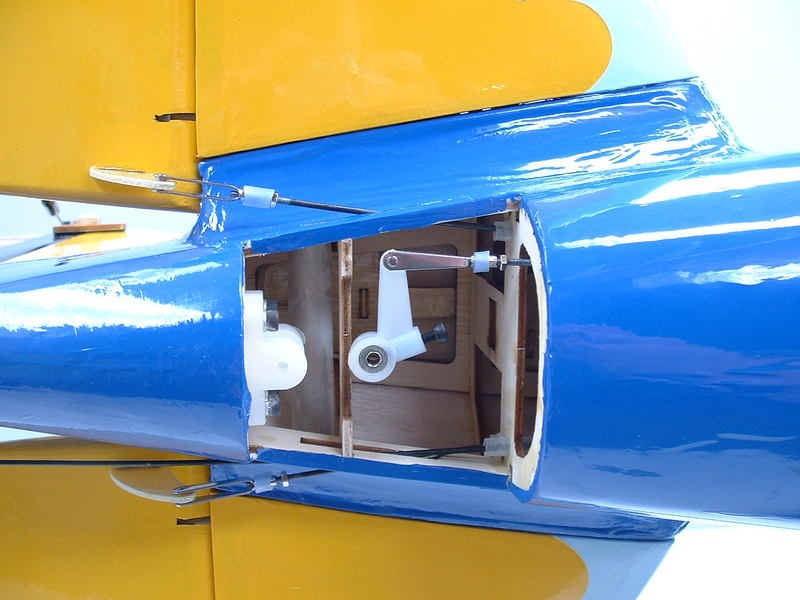 The rudder and tail wheel pushrods were then connected to the servo arm, as well as the elevator pushrods. 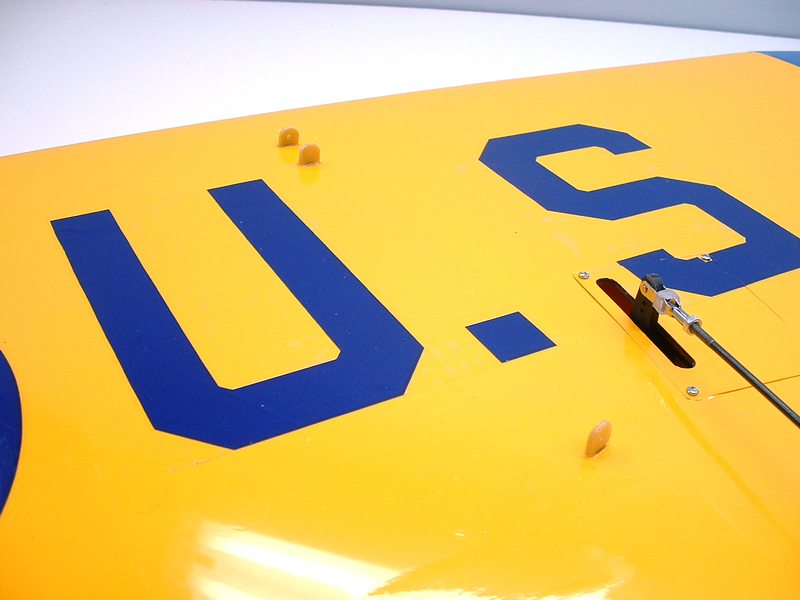 The tail wheel bracket cover was cut to shape, and installed with some small wood screws. The manual stated to glue the cover in place, but I prefer to use screws so that I can remove the cover for maintenance. 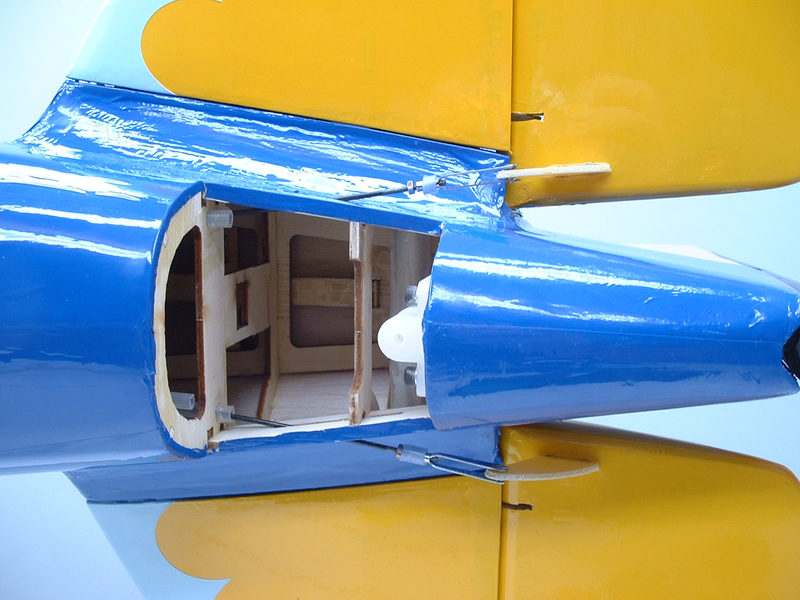 The fiberglass spring eyelets were glued into the pre-cut openings in the fuselage, and the left wing was attached using the aluminum wing joiner and a nylon wing bolt. 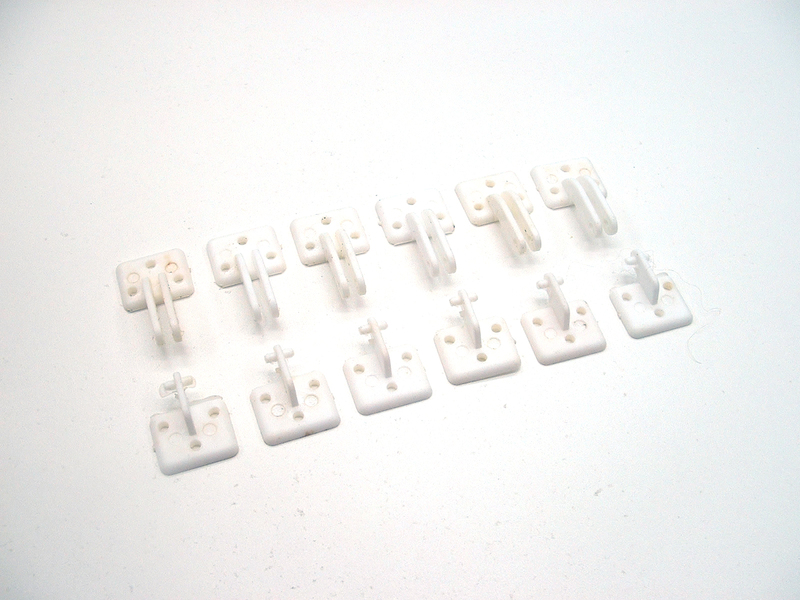 I made ten small spring hooks from some stiff wire, and installed the sixteen wing wires. 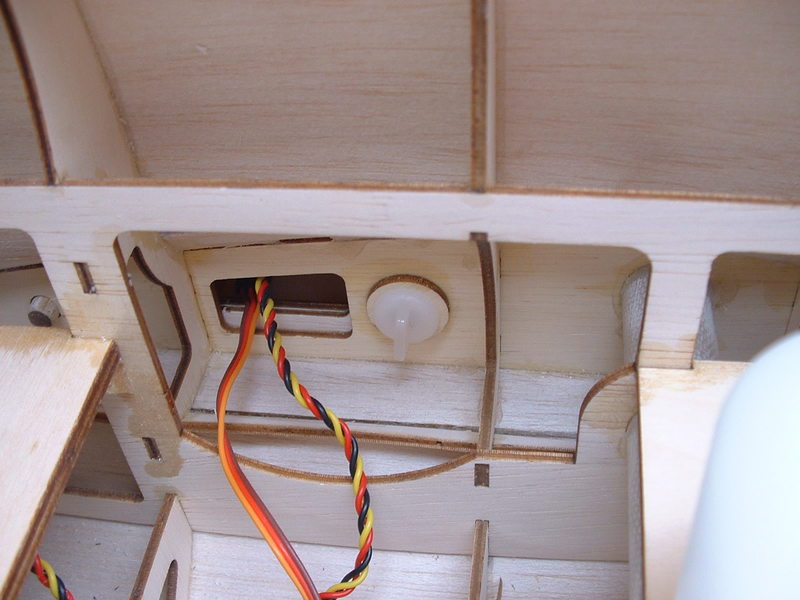 The wires are only for looks, so the springs only need to be tight enough to hold the wires in place. 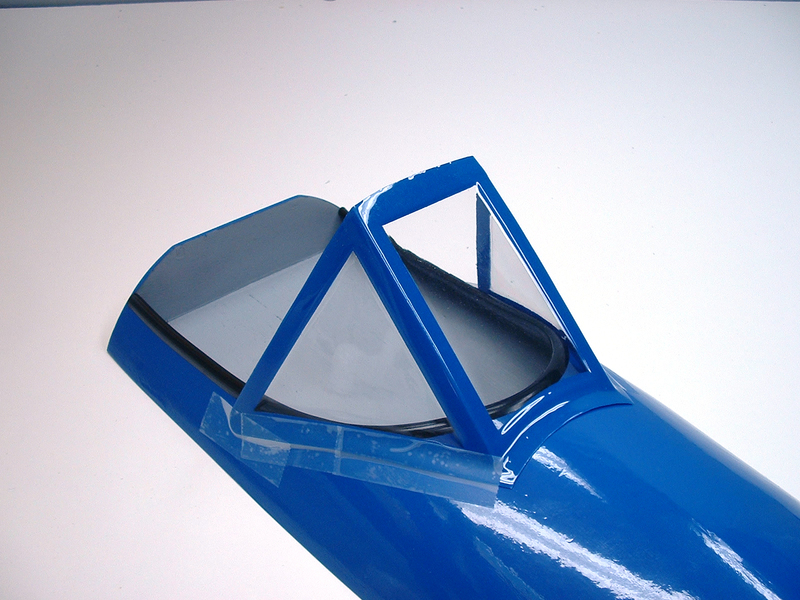 A few pieces of clear tape held the windshield in place while I drilled holes and attached it with small wood screws. 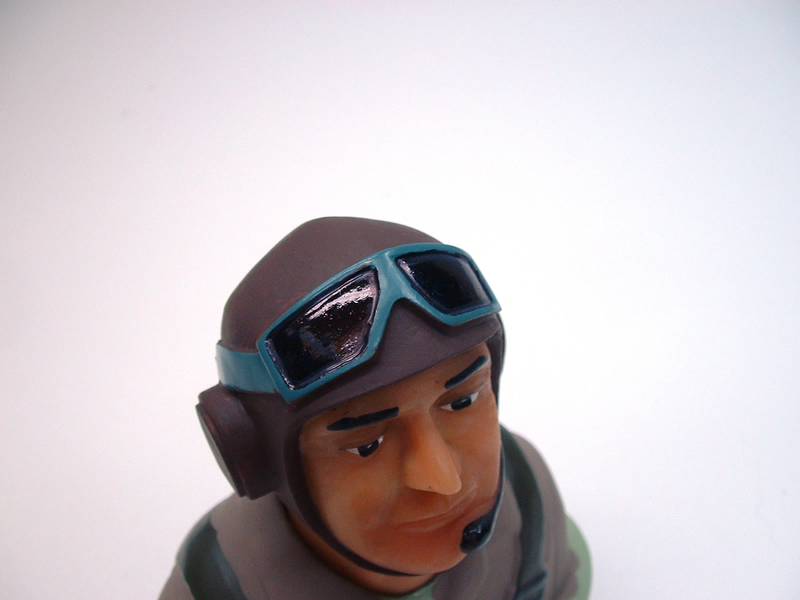 It’s amazing what a little acrylic paint and a couple of Sharpie markers will do to make a pilot look better. 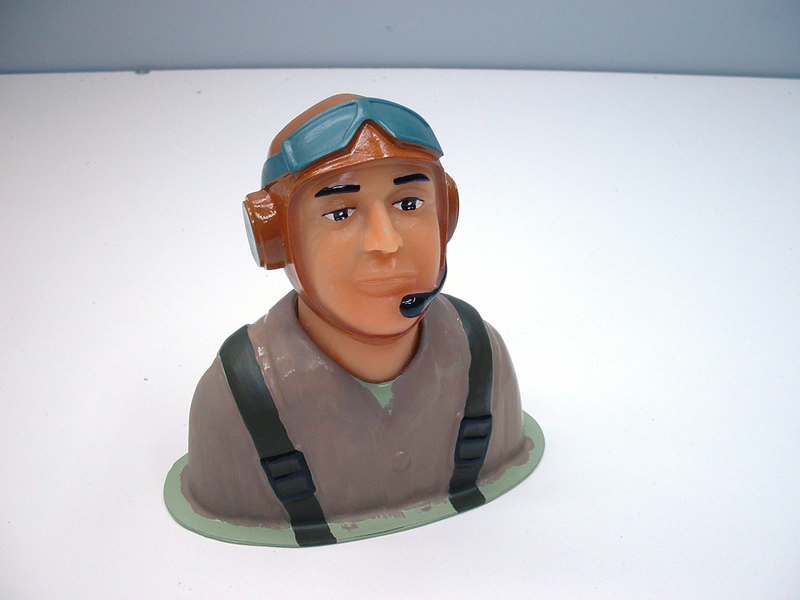 I ‘dirtied’ his face a bit with a mixture of water and brown paint to give him a little bit of a grimy look. Here he is, after attaching him to the hatch with four wood screws. Though he’s a little too large to be the perfect scale, I think he looks pretty good! 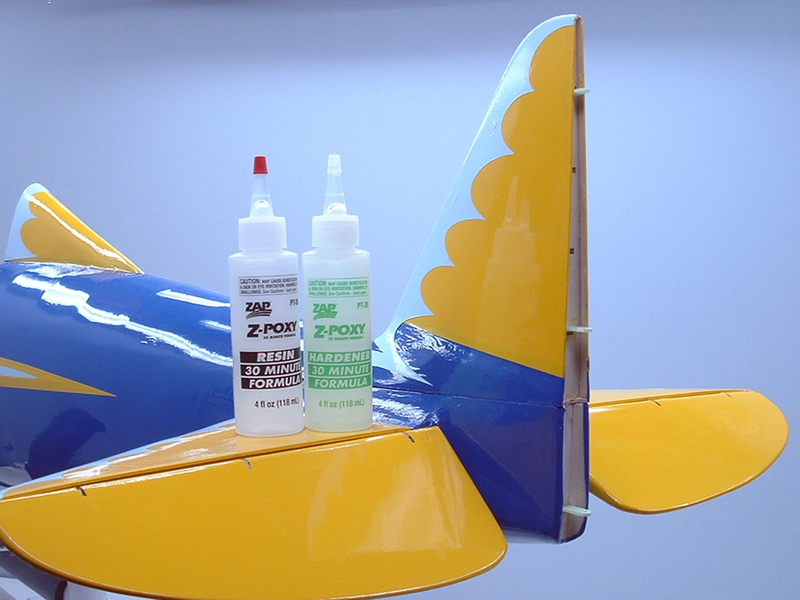 The P-26A Peashooter is nearly complete! 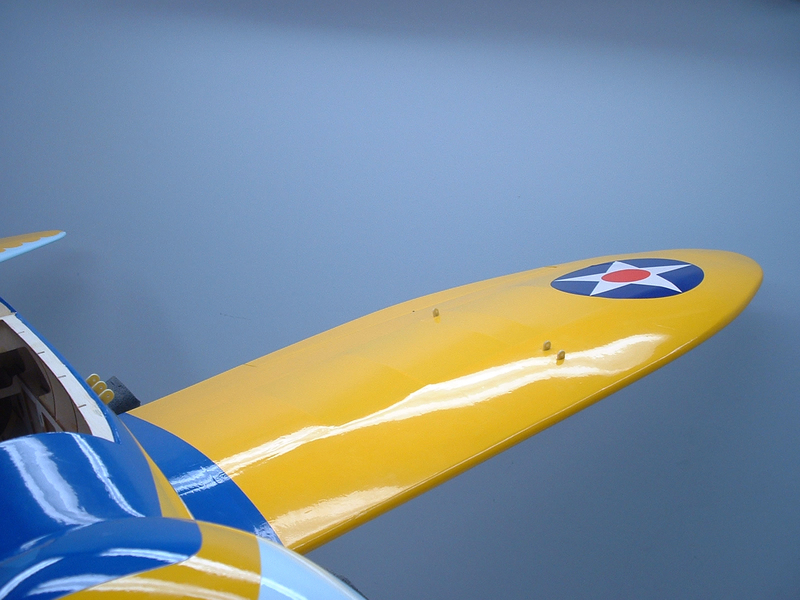 The last few things I had to do were mount the Hitec Maxima 9 receiver, secure the receiver’s antennas, and mount the Falcon, painted civilian 20×8 propeller! 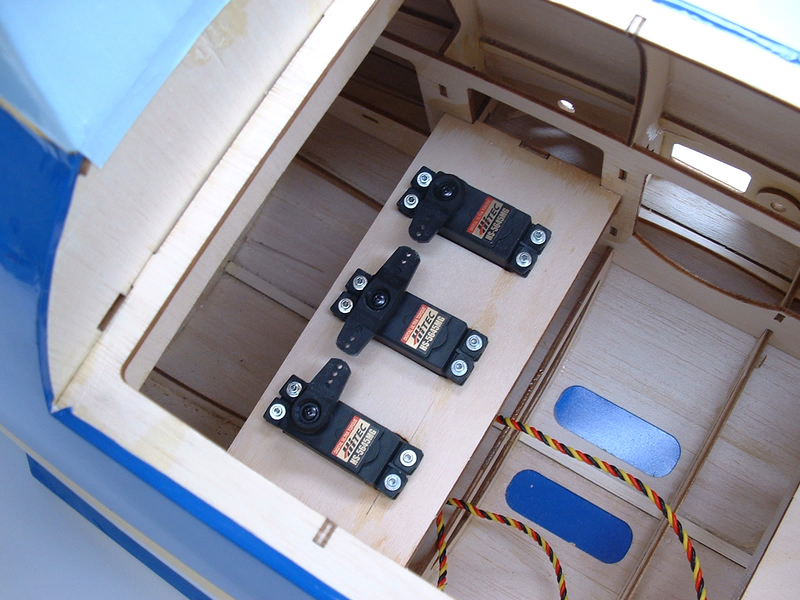 All that remained was to check the Center of Gravity, and mount the ignition and receiver batteries and power switches. 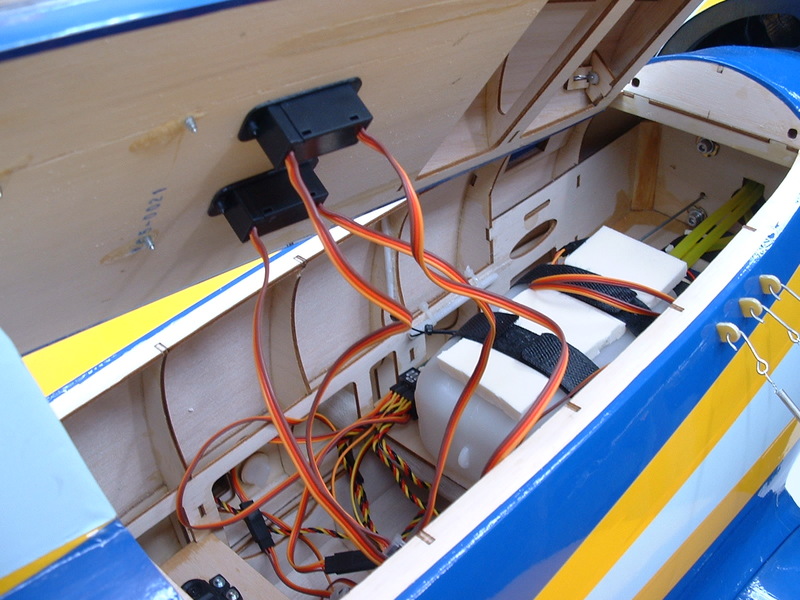 I know, I know – theres a few more extension wires in here than I need, but I wanted the ignition and receiver power switches to be accessible. 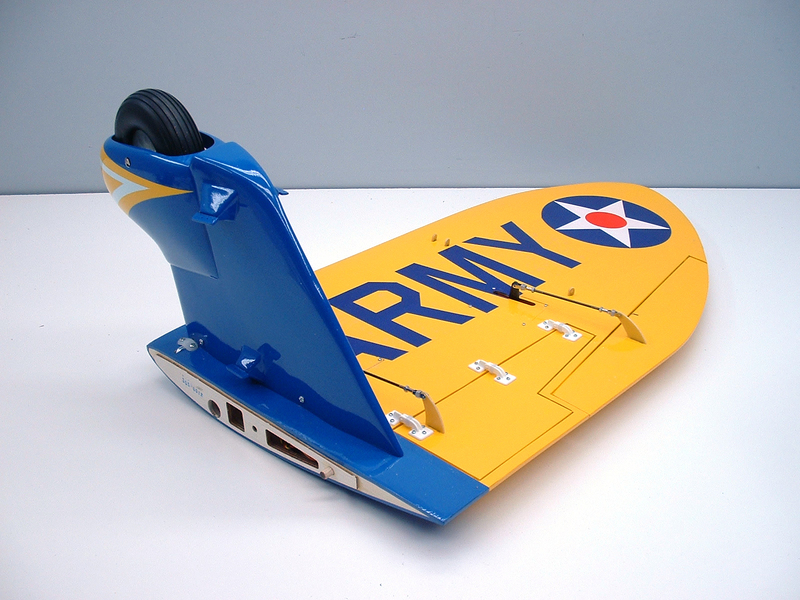 Both batteries were mounted in front of the fuel tank to get the P-26 to balance at Seagull’s recommended balance point of 120mm (4-3/4″) behind the leading edge of the wing at the fuselage. 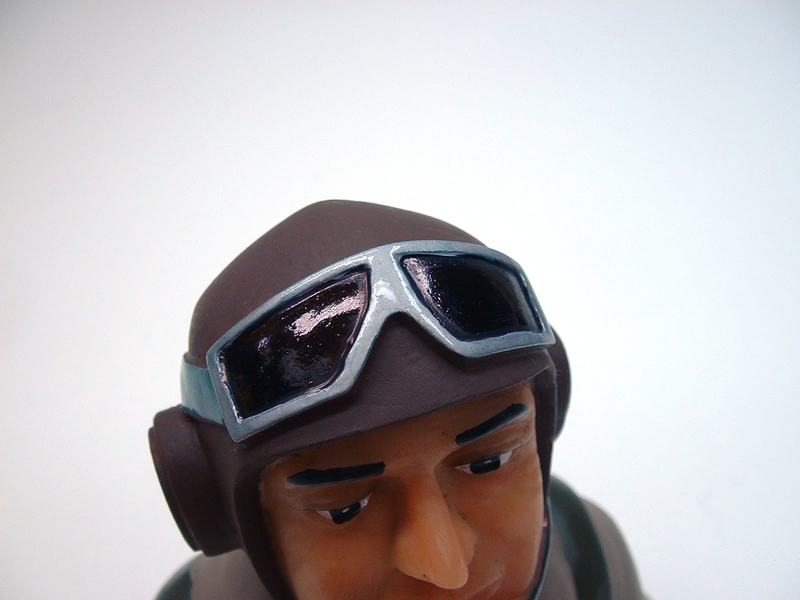 With that, the Peashooter was ready to fly – unfortunately, the weather was not…. So, stay tuned for part two of this review in the coming weeks!!! 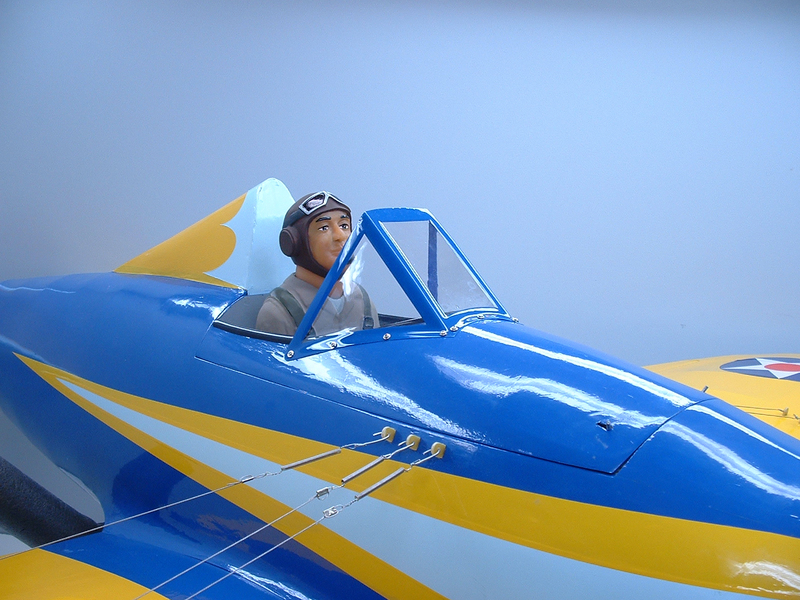 Since we can’t fly yet, I thought I’d save the normal photo shoot pictures for the flight report part of the review. 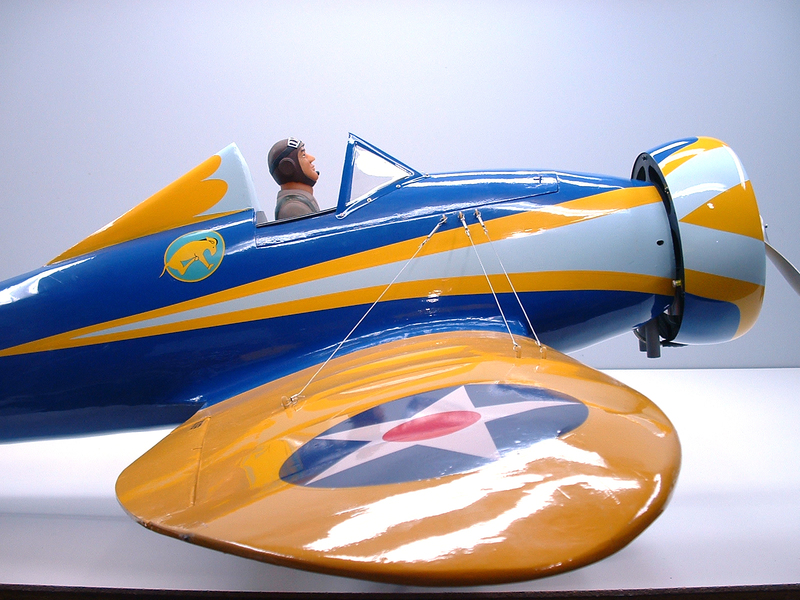 Enjoy these ‘candid’ photos of the Seagull Models P-26A Peashooter 30cc ARF! Good review, as usual. Why the delay on the flight report? Good looking plane, I can’t wait for the flight report. Might have to look into this.